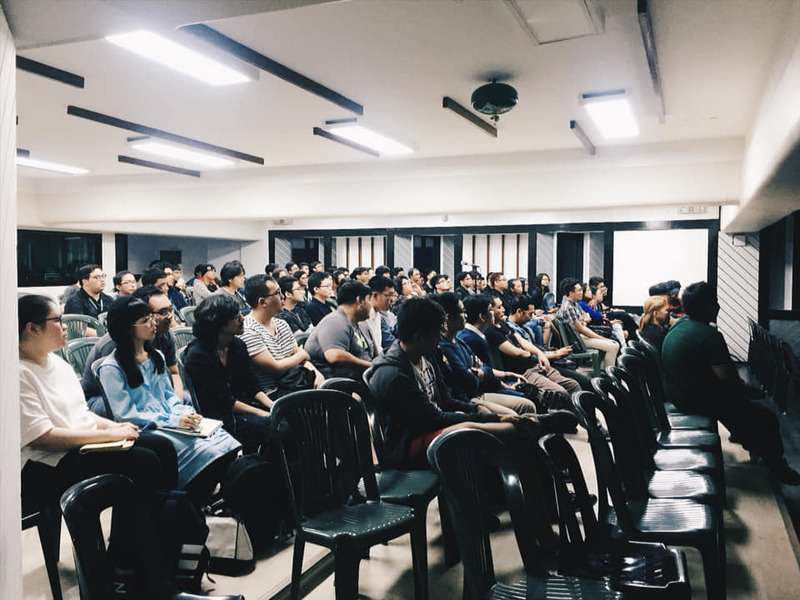 Animation | Miracle Animation Studios Inc.
Last December 10, 2018, I was one of the attendees who attended the free Masterclass for Unreal Engine (the software we use for our ‘Crop Circle Warriors’ mobile game) at the College of St. Benilde. The said class was from 10:00 am to 5:00 pm. 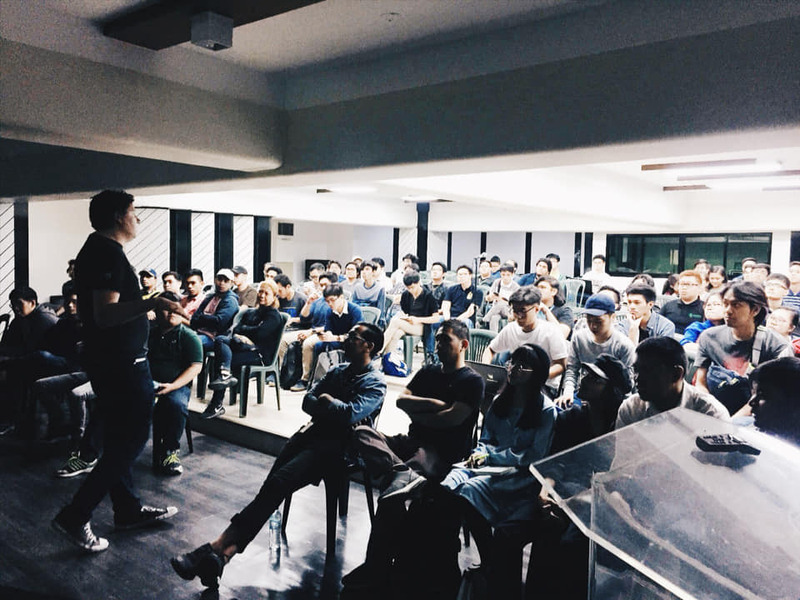 The master class was held by Chris Murphy, an evangelist for Epic Games and founder of Pub Games with over 10 years of experience with Unreal Engine. Blueprint debugging and performance optimization techniques. 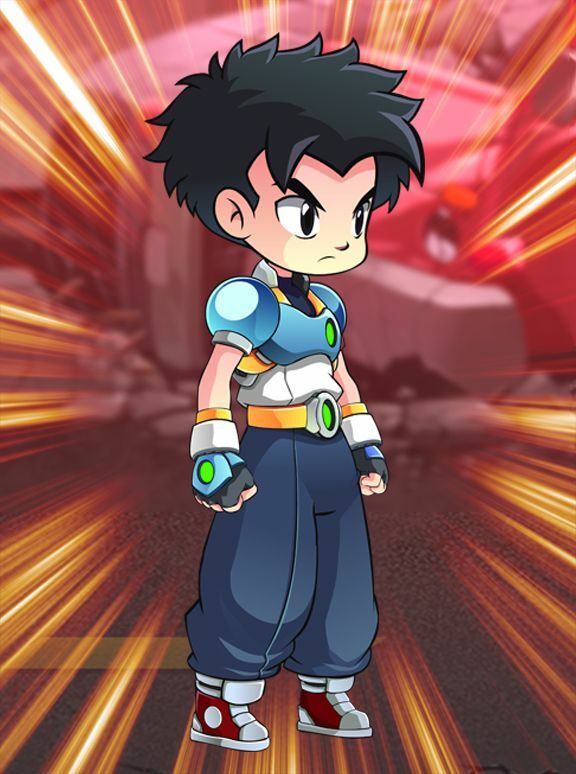 All these techniques were used in our mobile game already. 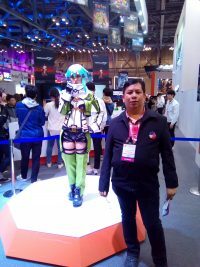 The introductory lessons covered all the basics that are needed to create a simple 3D character that moves and followed by enemies in a small level. He taught us how to import animation assets, blending separate animations to create a new animation, create a basic state machine which dictates what animation will play depending on what button is pressed e.g. move forward, move backward, jump etc. 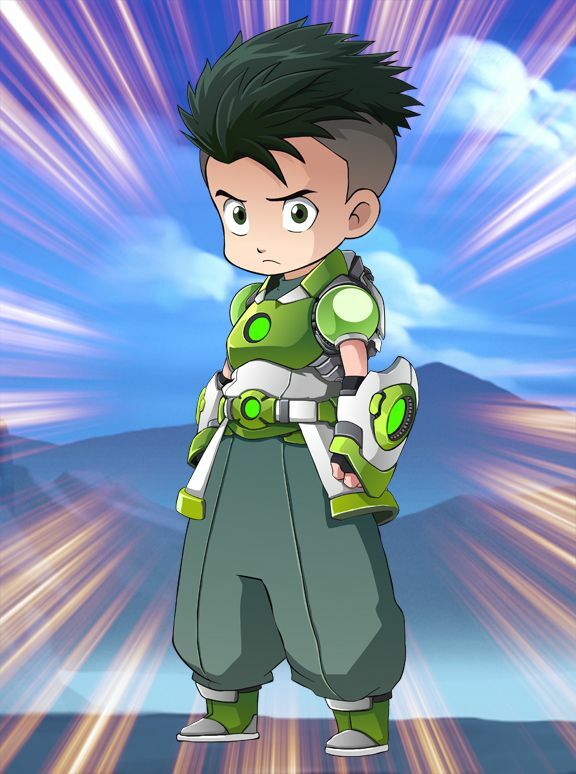 All these techniques were used in our game already. After the basics, we moved to the advanced part of the class which is technical art that covers shaders, visual effects, level creation tools like the use of spline to procedurally generate landscape paths and procedurally generate foliage. He also taught us the landscape tools and how to sculpt hills and cliffs. The discussion on Landscapes, Procedural foilage (creating 3D plants easily), world position offset effects (how to manipulate objects in the overall landscape), volumetric fog (realistic fog that adapts to lights), were new to me and this knowledge can help us make our games much better. 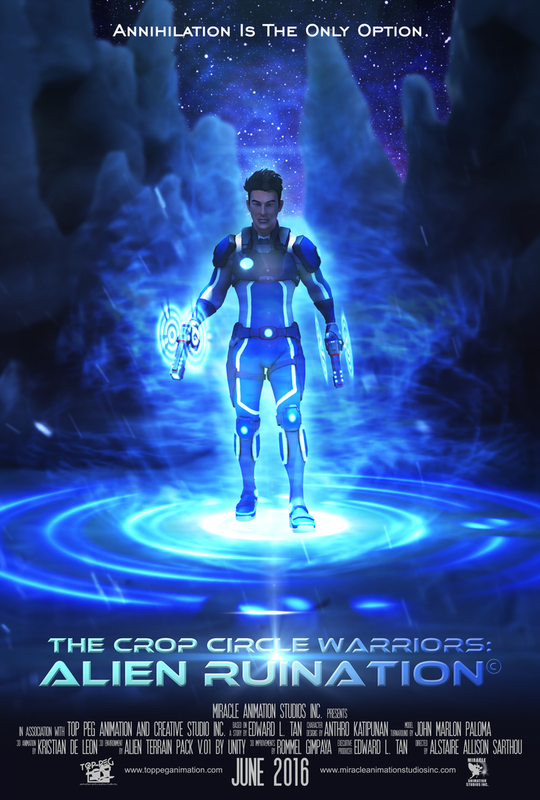 I will apply the new techniques I learned to the Crop Circle Warriors mobile game. 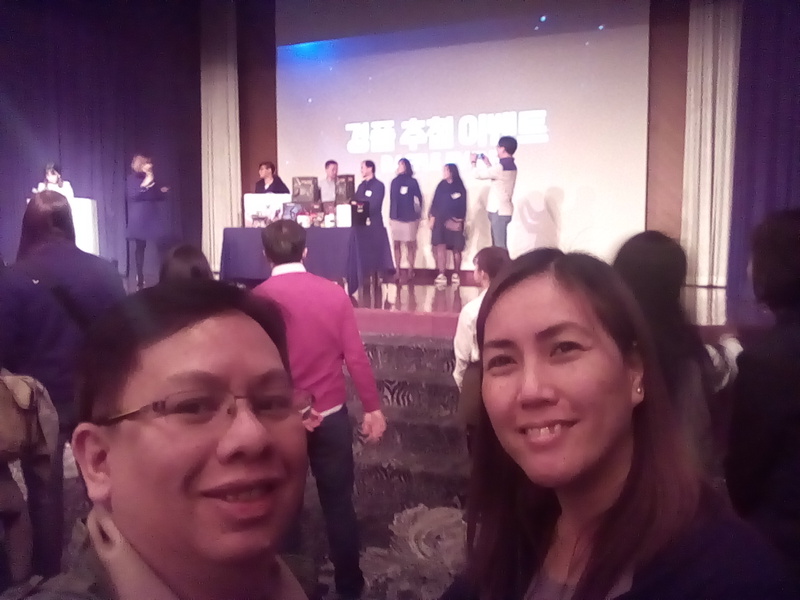 Unfortunately, I was not able to ask the questions I needed to ask due to the many participants in the auditorium who also had questions and took pictures with Mr. Murphy. 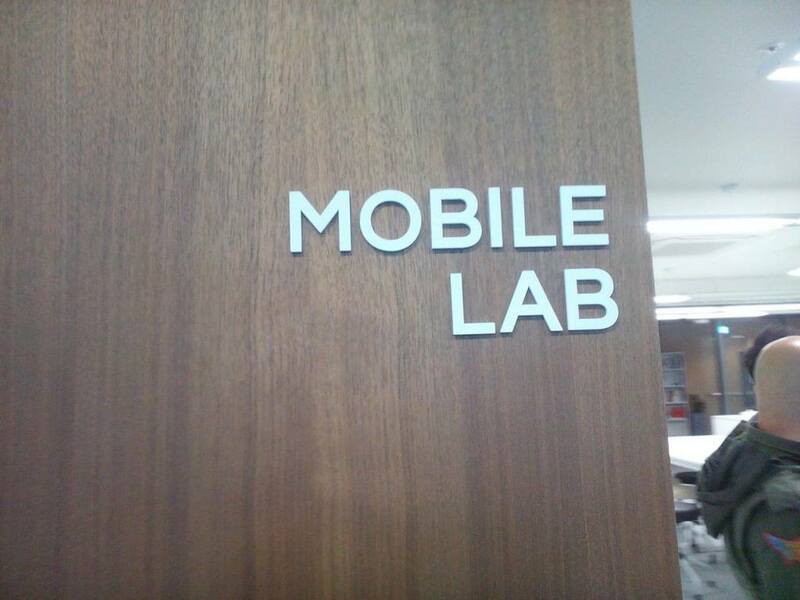 Due to the same reason, I was not able to show the sample of our mobile to discuss the problems that I cannot solve by myself. 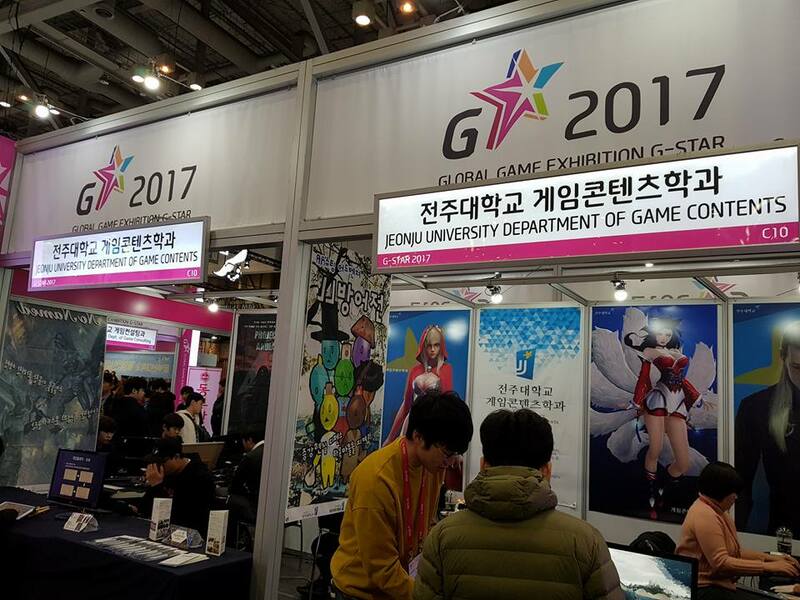 They said they will be scheduling another Unreal Master Class soon, so maybe we will have another opportunity to show our game. 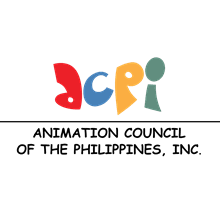 Last July 26, 2017, we received an email from the Animation Council of the Philippines, that Ms. Tess S. Loring, Chief Services Division of DTI-EMB (Department of Trade and Industry – Export Marketing Bureau) together with PTIC (Philippine Trade and Investment Center) Seoul through their Commercial Counselor, Mr. Emmanuel W. Ang, were seeking companies interested to participate in G-Star 2017, Busan, South Korea. 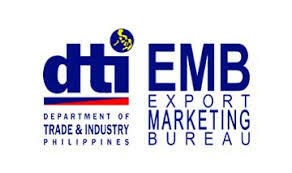 While the DTI-EMB will be choosing the 3 companies that will participate in the event. 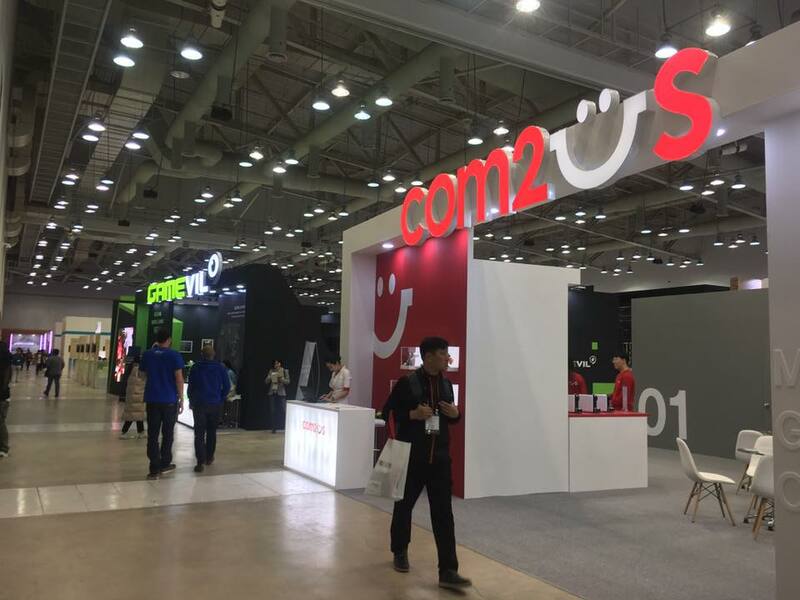 The companies just needed to submit the Exhibition Registration Form and digital images of the main product sample before the August 4, 2017, deadline. 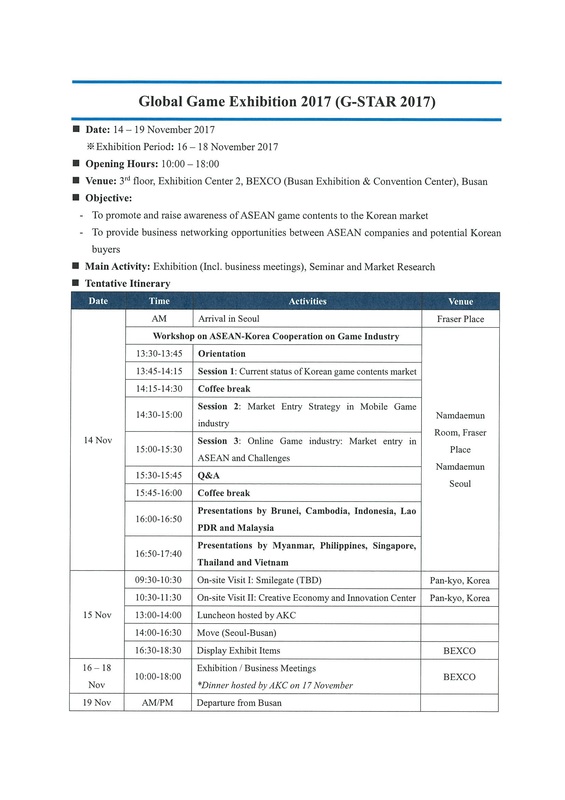 In past years, the AKC worked with the BOI (Board of Investments) to organize the Philippine delegation for this event. 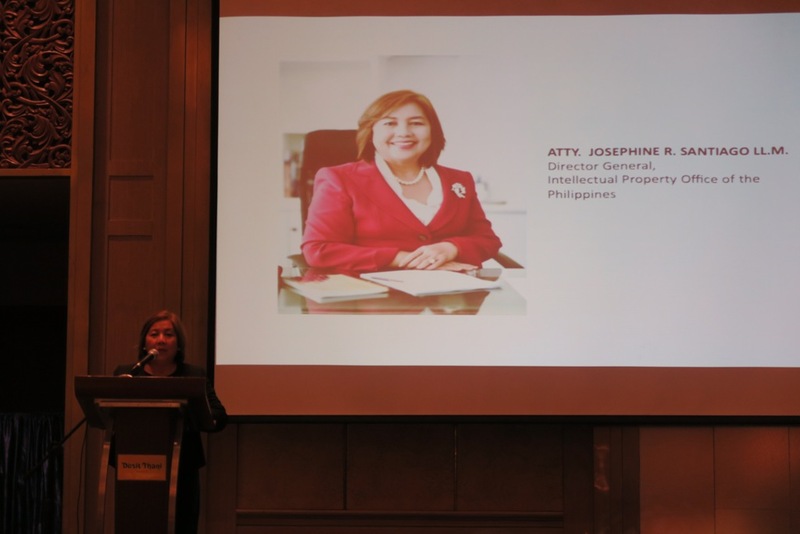 This year it was offered to the DTI-EMB; the BOI felt that the project is more aligned with the DTI-EMB since its main purpose is to help generate exports. 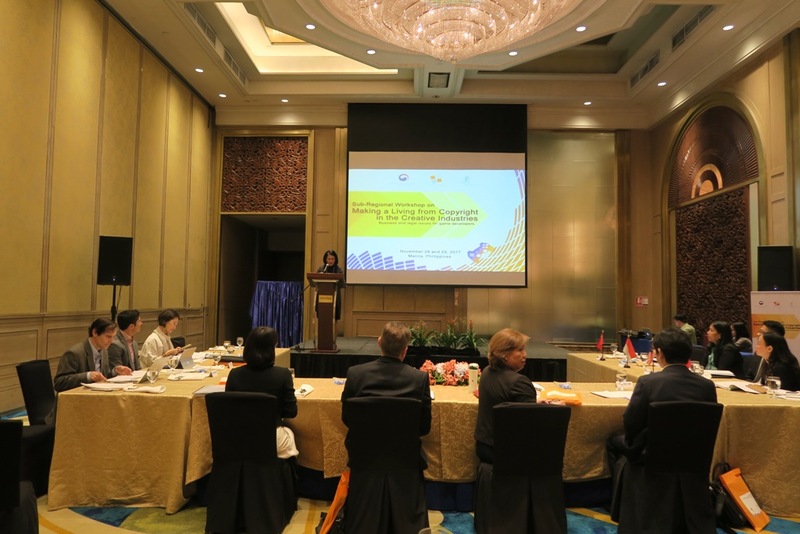 They also wanted to focus on making this opportunity available to small companies not only in Metro Manila but also from other regions in the country. 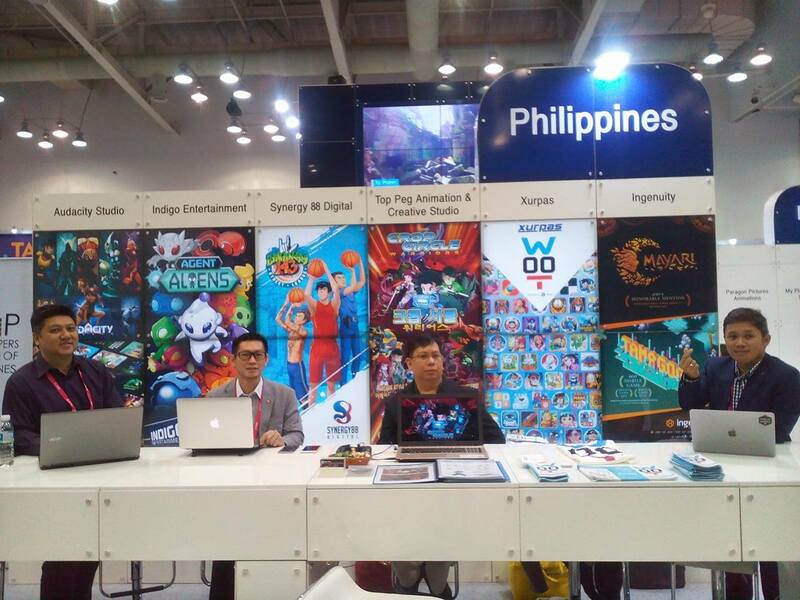 Top Peg Animation Studio indicated its intention to join and suggested Anthro Katipunan, the game designer for our mobile game, to be its representative. 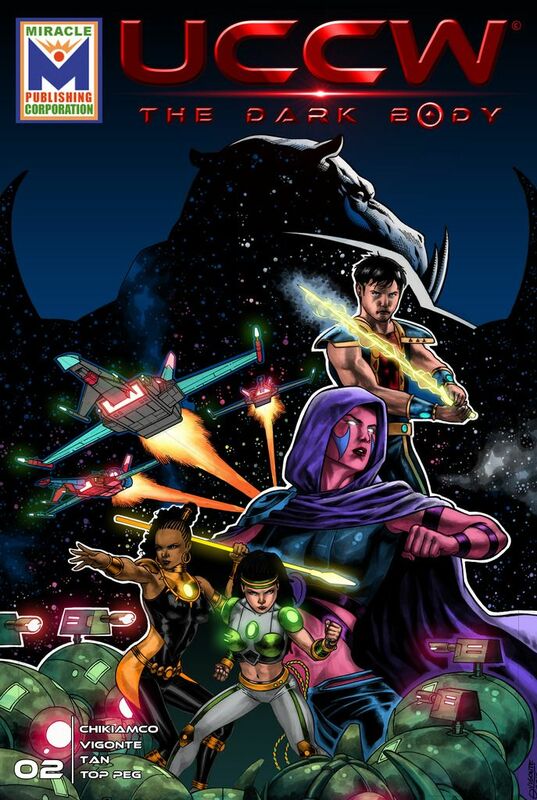 We submitted the requirements on July 31, together with a letter that we were excited to promote our first mobile game, The Crop Circle Warriors©, globally. 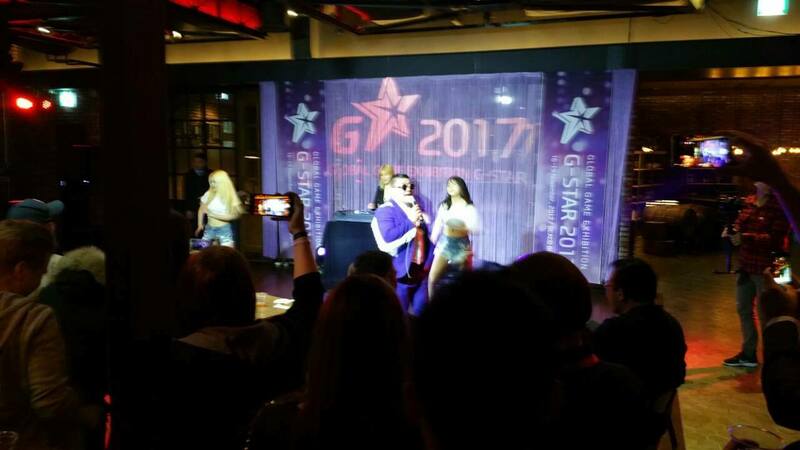 Unfortunately, Anthro wasn’t able to fix his passport in time for the event. 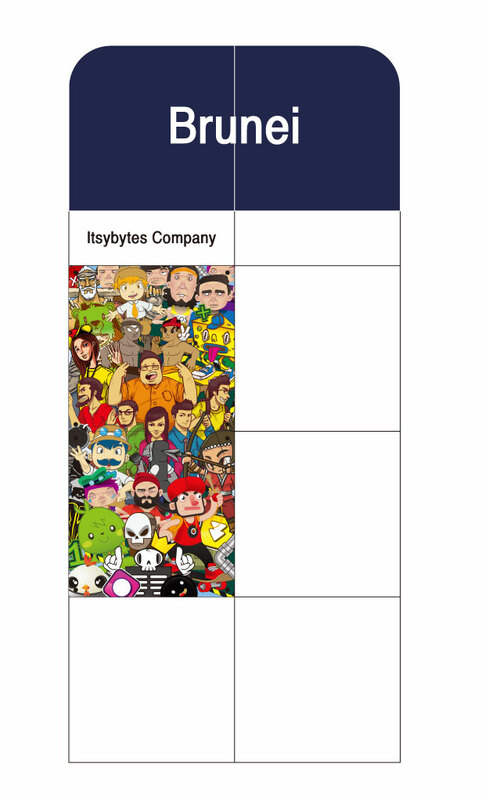 So I had to replace him as the company’s representative. 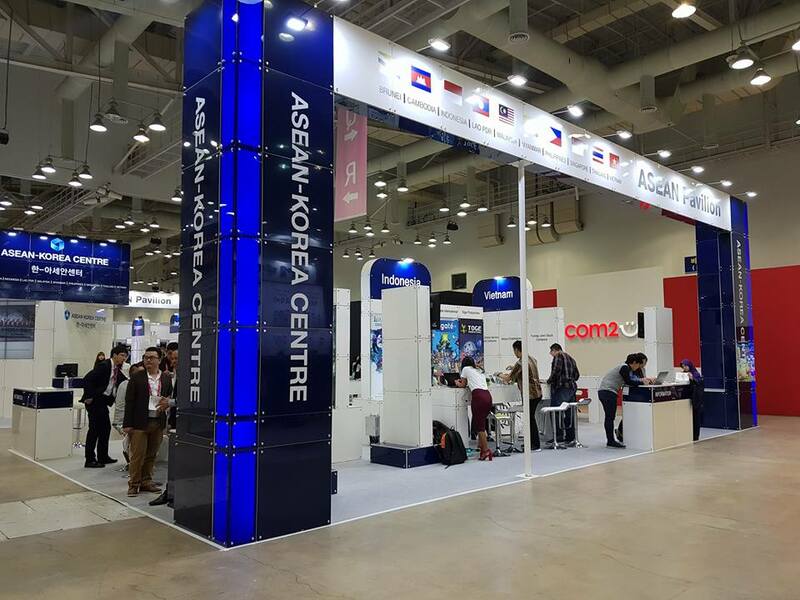 We duly informed the DTI-EMB about this change on September 13, since we had a deadline to submit a copy of the passport and completed guidelines for G-star. 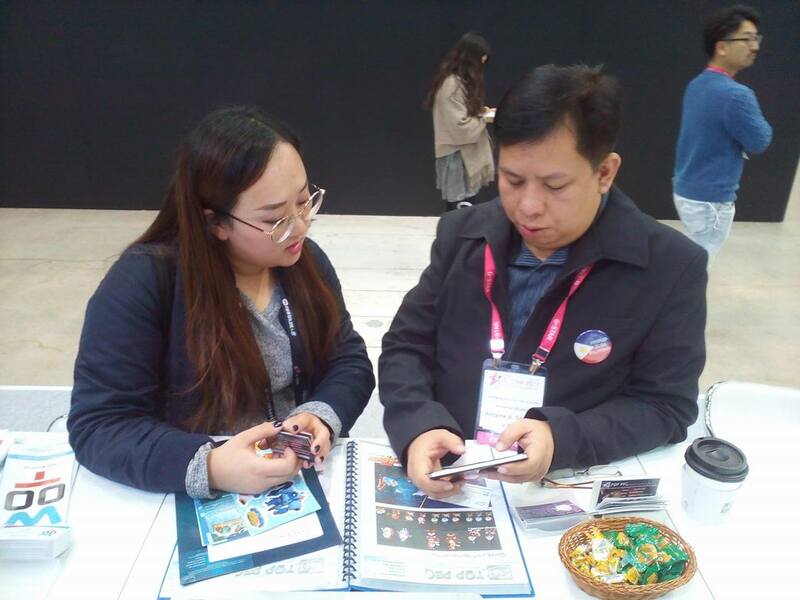 We were also reminded of the Business Matching System, where we needed to register at the G-Star site and set up meeting schedules with different companies that were either exhibitors or visitors at G-star. 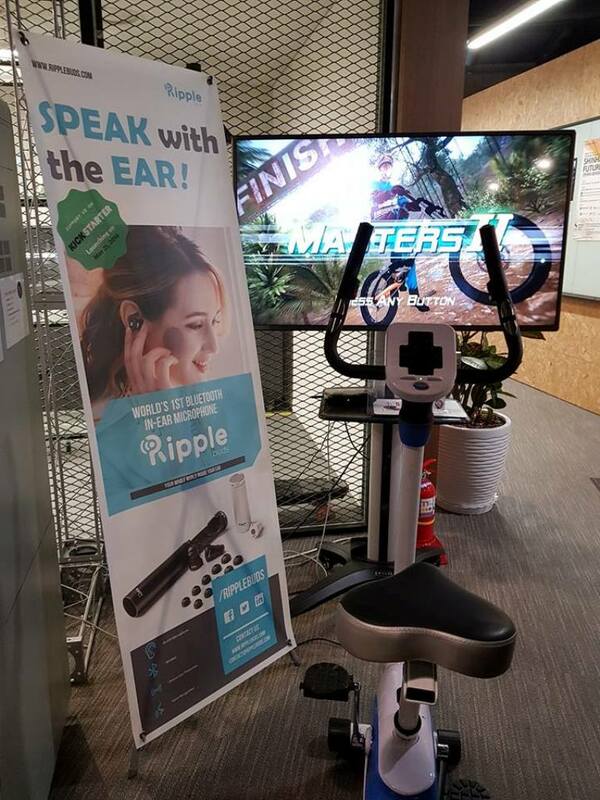 These companies can then approve the meeting schedule if they were interested. 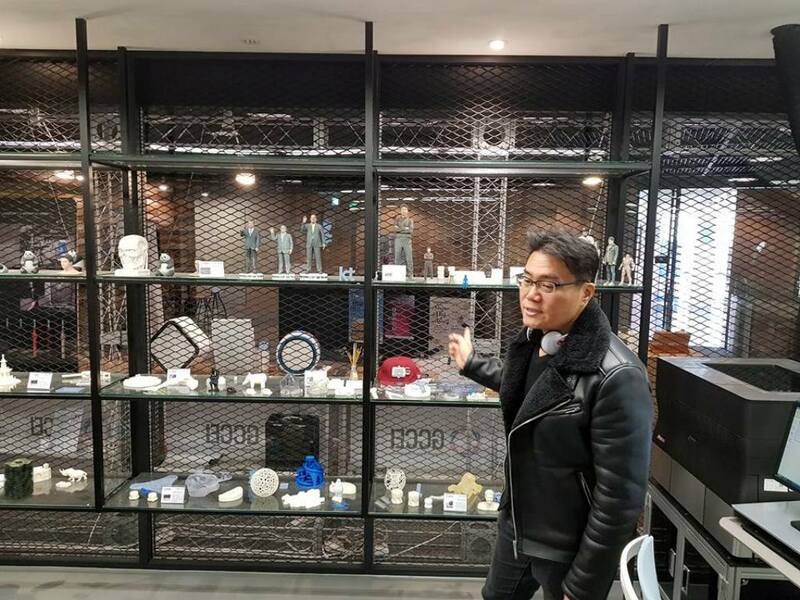 I received 2 invitations from companies from China and Vietnam, while I was able to send 7 invitations to different companies, only 3 approved. 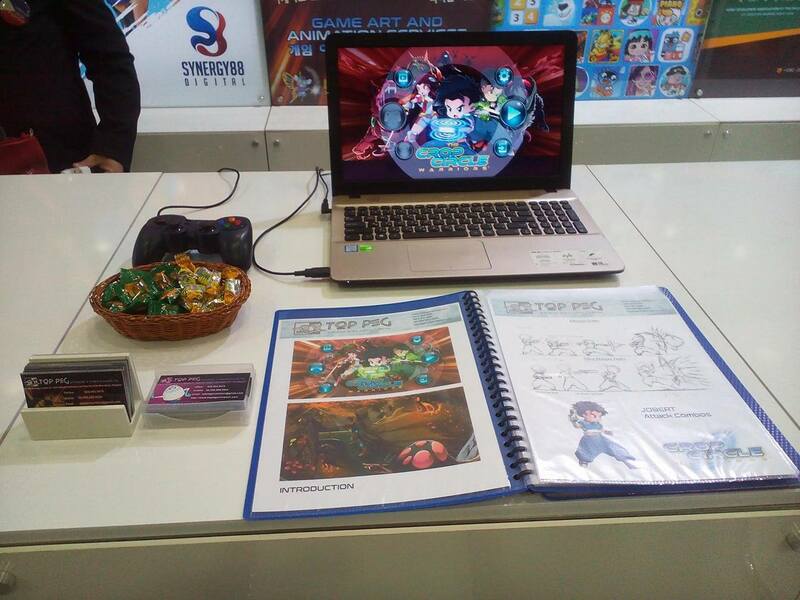 Anyway, in my experience at the Tokyo Game Show, more clients made meetings at the booth rather than set it online. 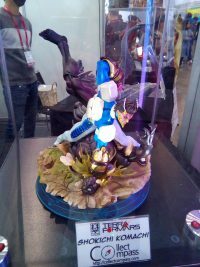 So I wasn’t worried too much about this. 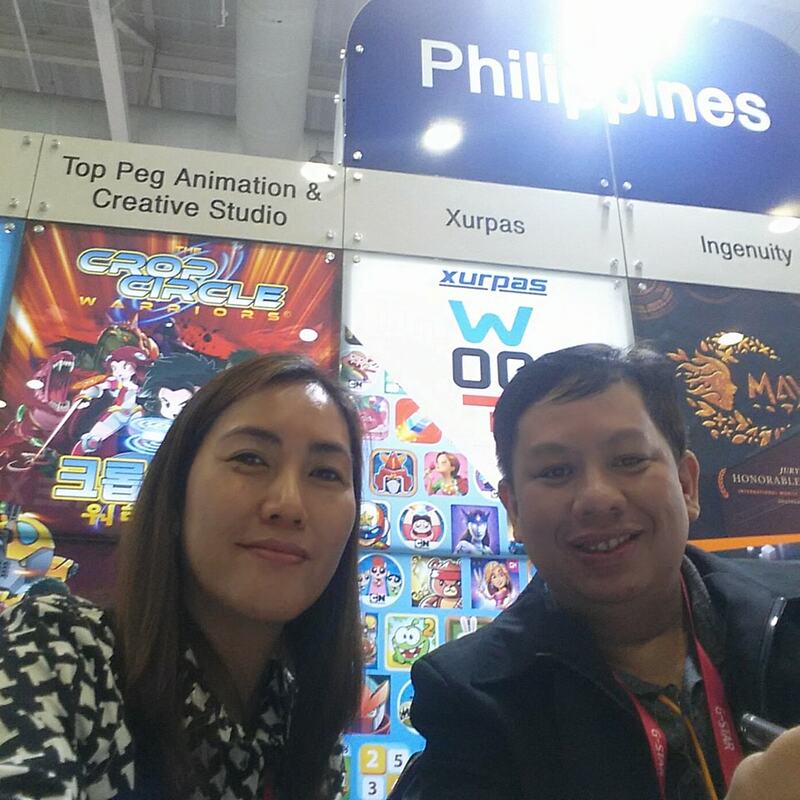 We were given access to the Business Matching sites when I learned that Emottoons Studio was replaced by Ingenuity Studios (Davao) – which had 2 games Tamagogo and Mayari (Mobile games) that won back to back as best game at the ICT Creative Awards. 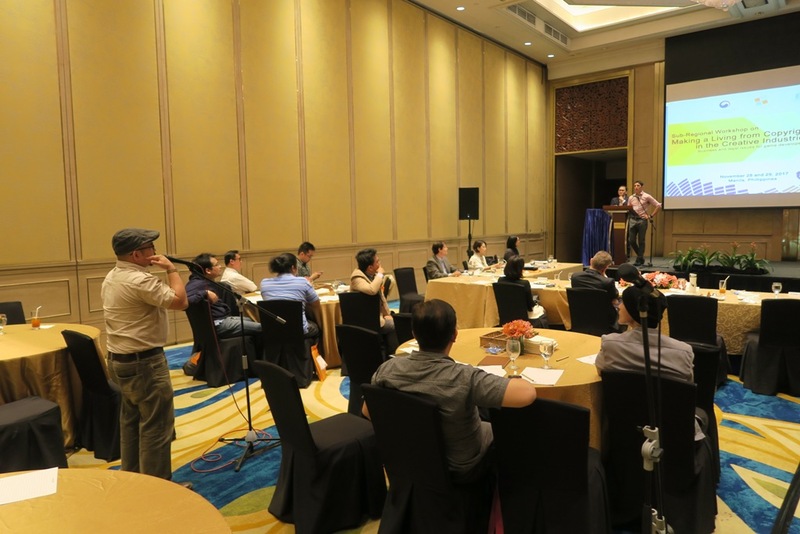 September 20, we learned the confirmed number of participants per country.We also learned our hotel accommodations and flight schedule. 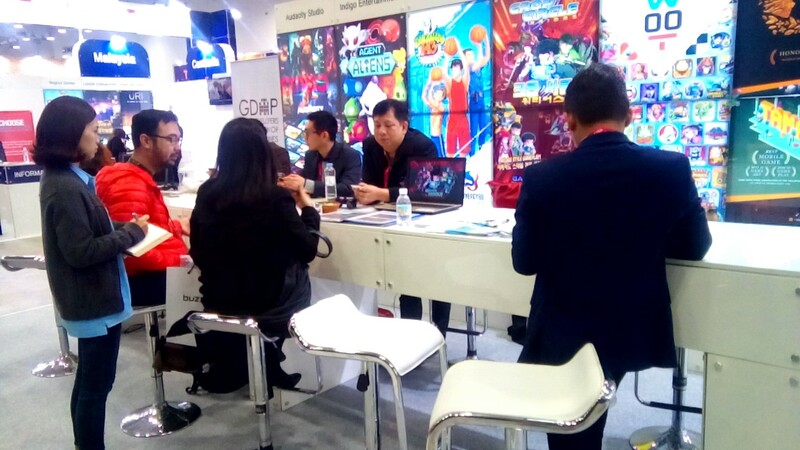 September 29, due to my experience at the Tokyo Game Show last 2014, I knew it would be hard to meet potential passing clients at our booth while having other meetings with other companies. 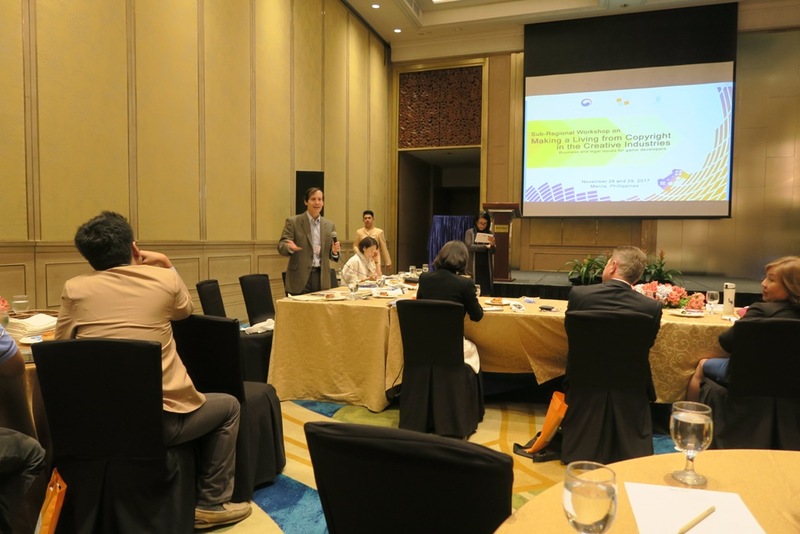 I suggested to the DTI-EMB that a second representative of Top Peg be allowed to attend. 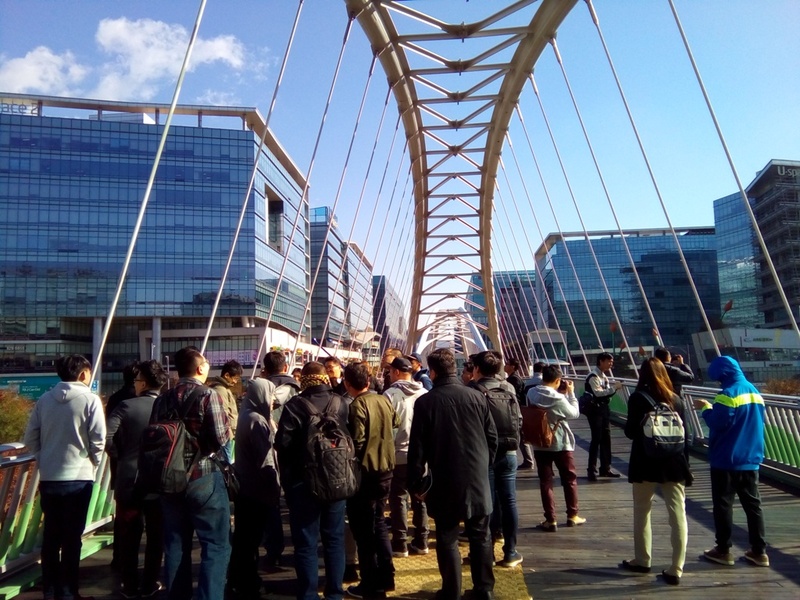 At that moment, Xurpas also sent an email stating that they will be sending two representatives and they will take care of the additional persons’ expenses. The AKC promptly considered it and said that the hotel rooms are good for two people, so we just needed to pay for the flight, transportation and Trade Badge. 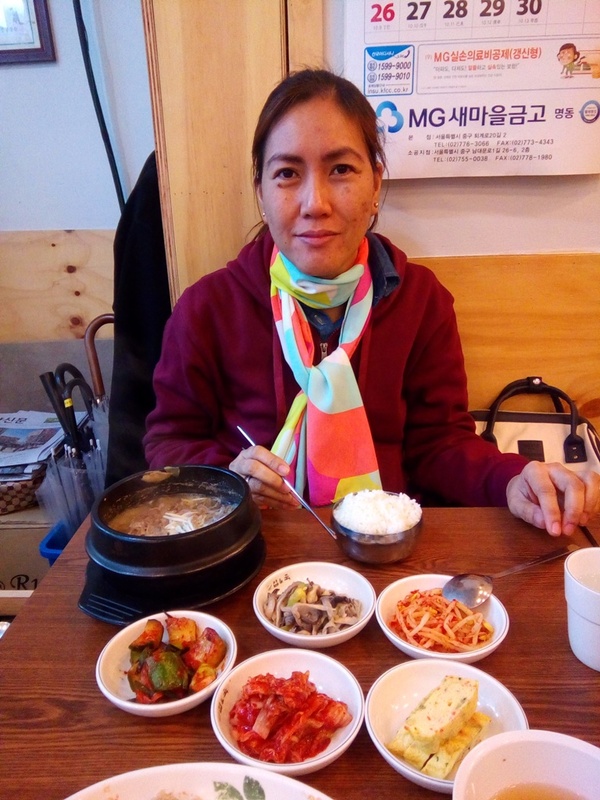 Since Edith Sarthou, who is our Administration Head and also my wife, knew of the costing for our different projects, I suggested that she come along with us. 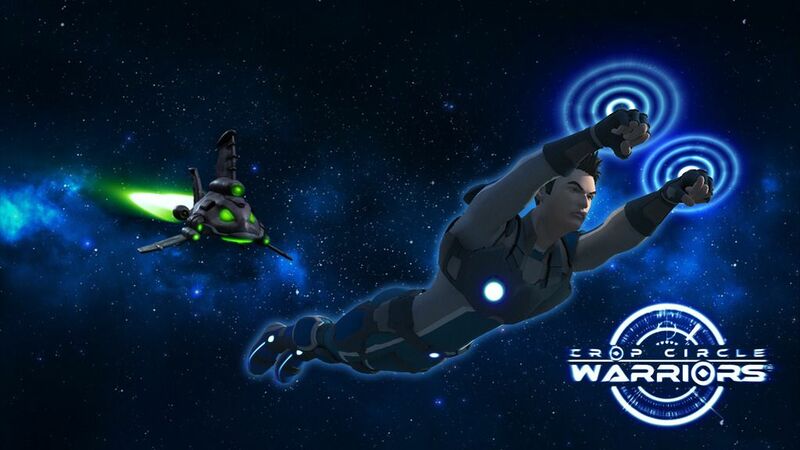 Xurpas also requested if they could fly at an earlier date, with the cost of accommodations at their expense. 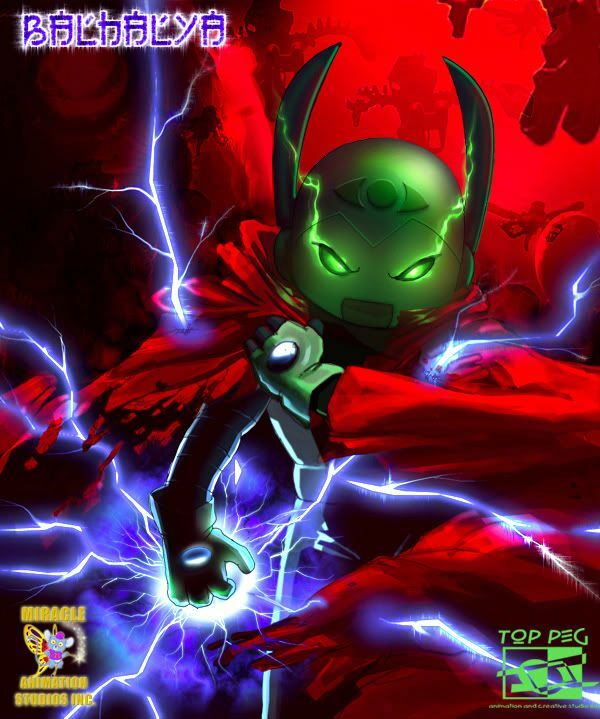 Aside from Xurpas and Top Peg, Synergy 88 also had a 2nd representative. 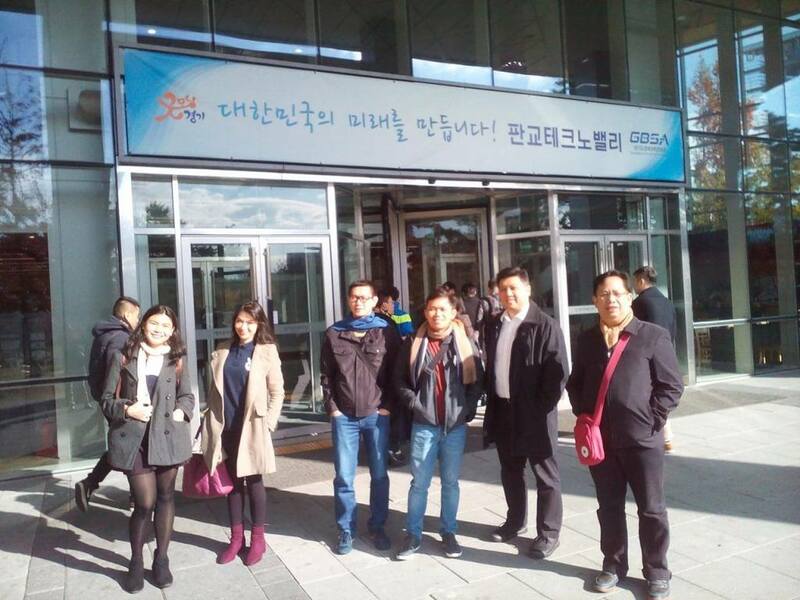 October 4, we had a delegation meeting at the DTI-International Building. 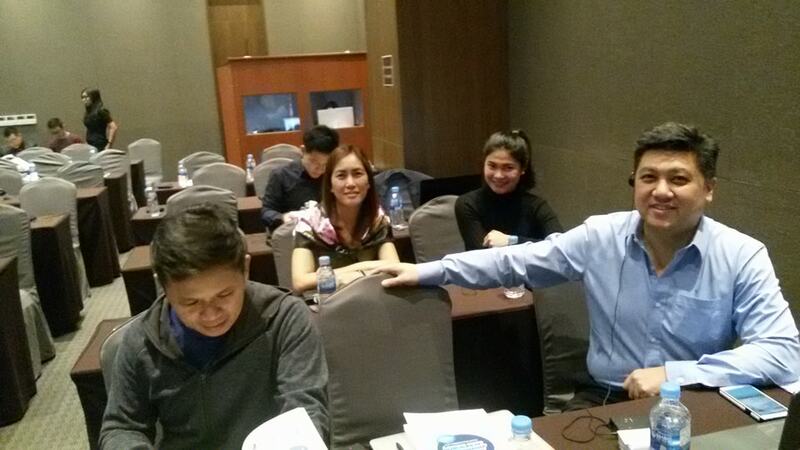 Present were the delegates, James Lo of Indigo Entertainment, Sofia Adap of Xurpas, Joemar Albino of Synergy 88, Me and Edith for Top Peg. 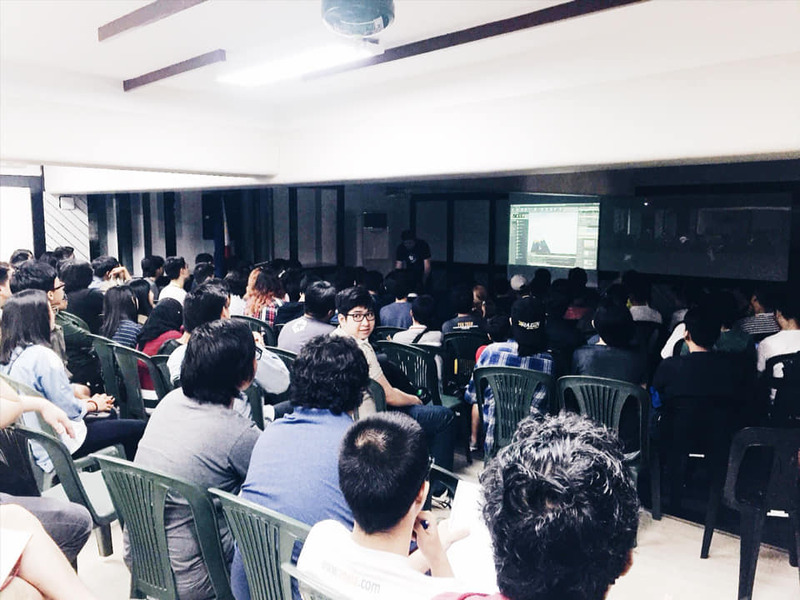 Hajee Aquino of Audacity (Iloilo) was also present via Skype, while John Naranjo of Ingenuity (Davao) was not online. 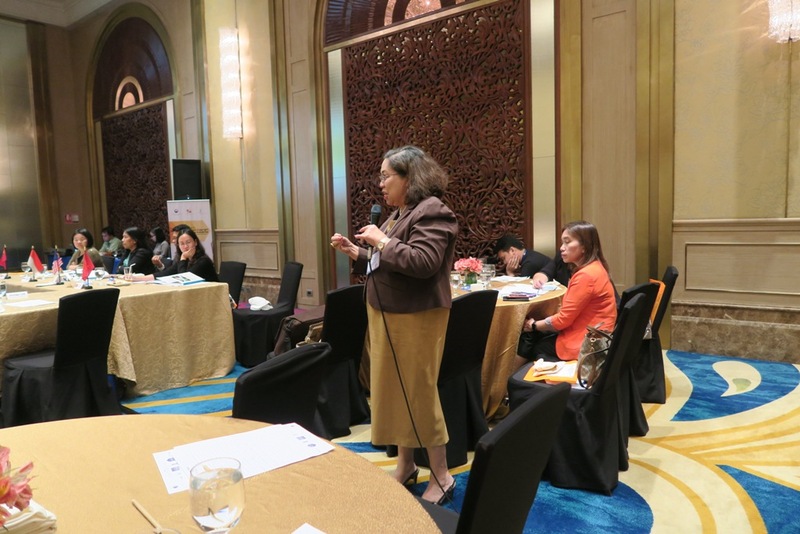 Also present were the representatives from DTI-EMB, Ms. Tess Loring, Ms. Glecy Cademia and Mr. Rhys Manabat. 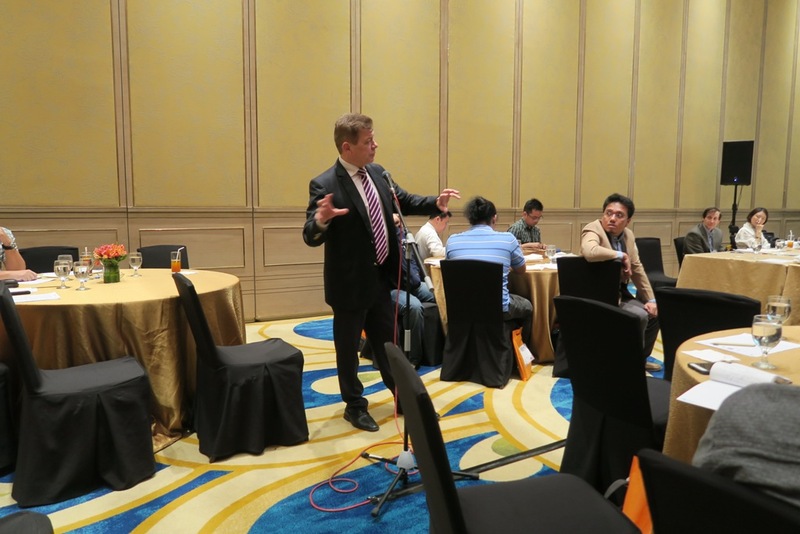 Highlights of the meeting were the discussion of the Business Matching Activity, the additional representatives and setting up a Viber group for easy communication between delegates. 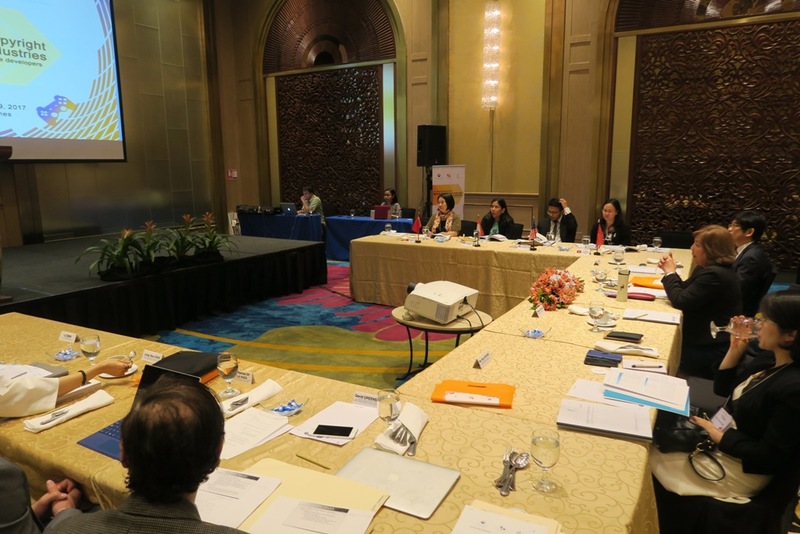 Also, the delegates informed the DTI-EMB of the problems that were encountered last year, since Audacity and Indigo also joined them. 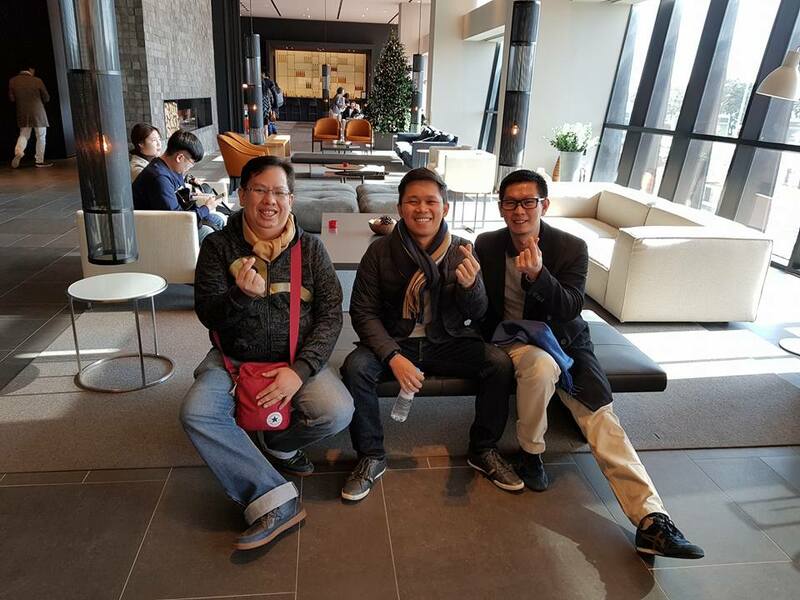 They said that the Invitation Letter from the AKC should be sent to us so we can process our visas earlier since there was the ASEAN Summit, with a 1 week holiday, coming up. 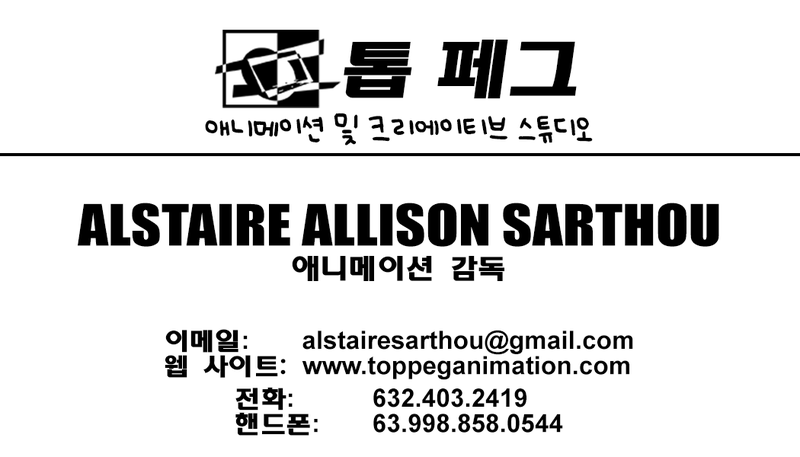 We were also advised to have our calling cards printed with Korean translation at the back. 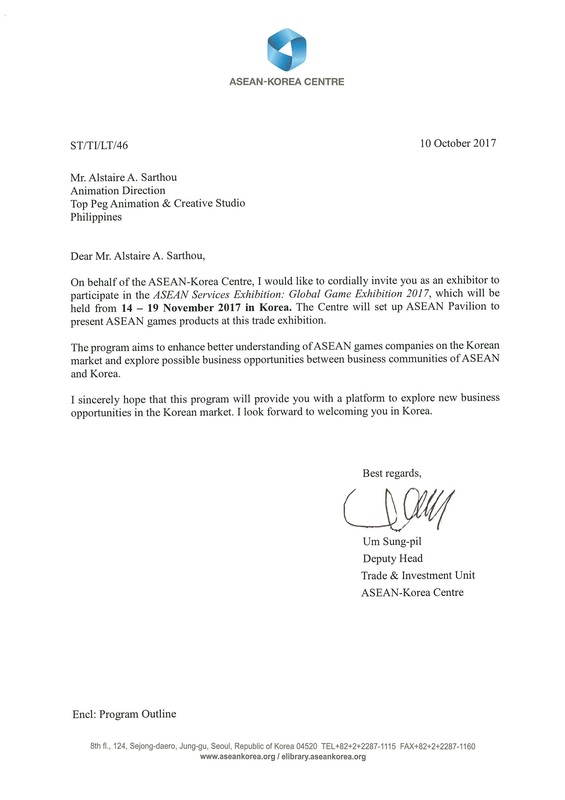 We received the Invitation Letters plus our flight schedules on October 13, from Mr. An-Jin Hun of the Asean-Korean Center (AKC). 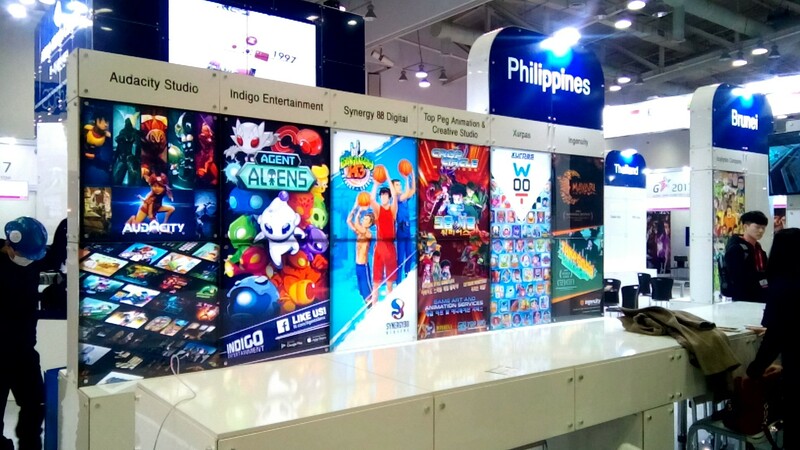 November 2, Indigo Entertainment informed the DTI-EMB that Mr. James Lo would be replaced by Mr. Eduardo Nilo due to last minute commitments. 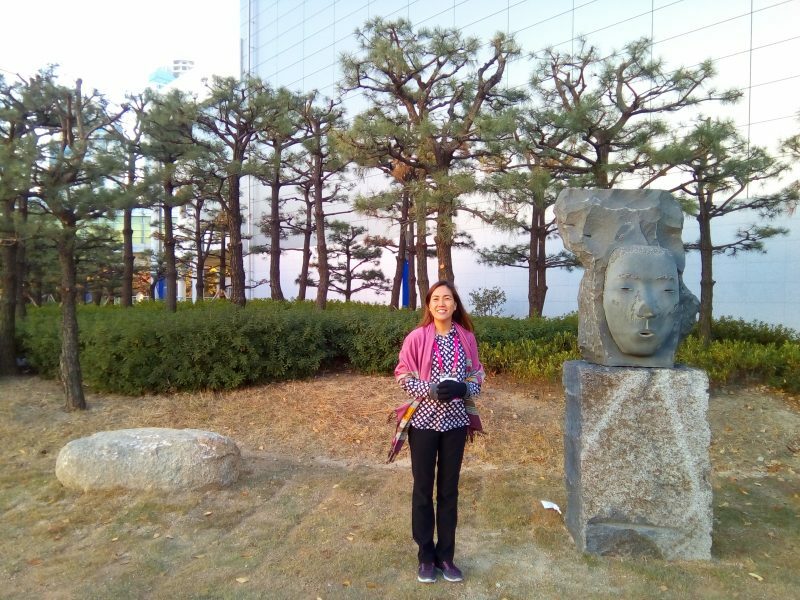 The Korean Embassy opens at 8:30 am but we were advised by the guard to be there by 6:30 am when we inquired last October 30. 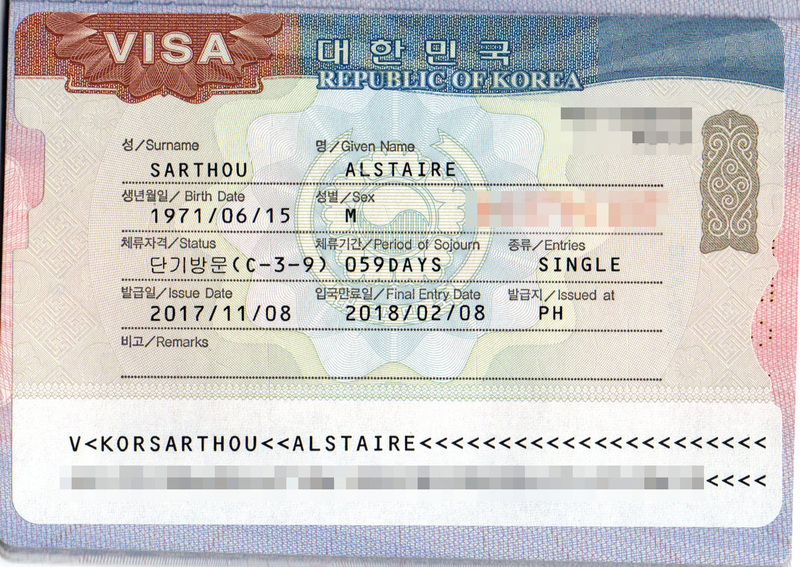 We were able to apply for our Visas on November 3. We arrived at about 6:45 am and there was already about a hundred people already in line. We just needed to list our names at the window, by 8:30 am those on the list will be called in, anyone not in the list would fall in line outside and take a chance if they will still be called in. After that, you just need to fall in line again and submit the documents to the guard, who then checks and approves it. You will be given a number that would be called at a specific window for the interview. 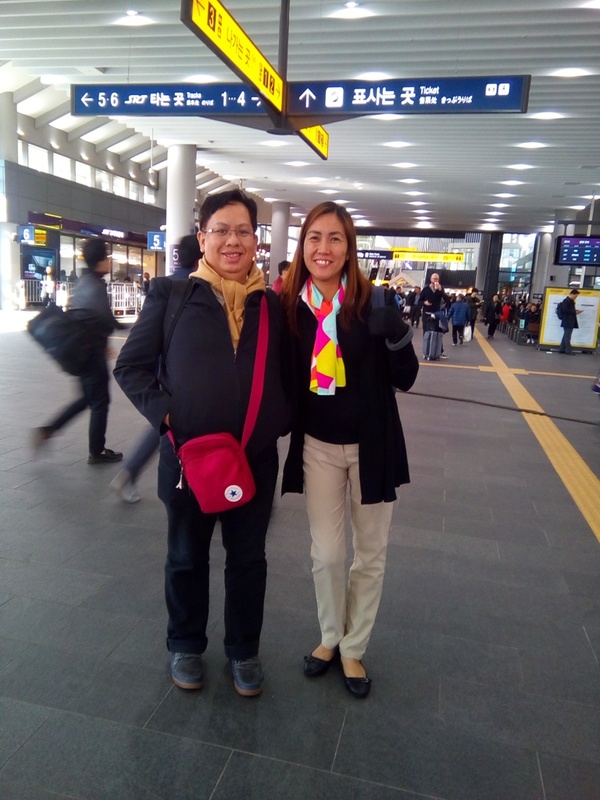 I was placed in a special lane since I was able to travel to Japan before, and since Edith was my wife, she too was able to avail of the special lane. At the window, they just asked the purpose of the trip. They then gave me a schedule on when to pick up our passports with the Visa. 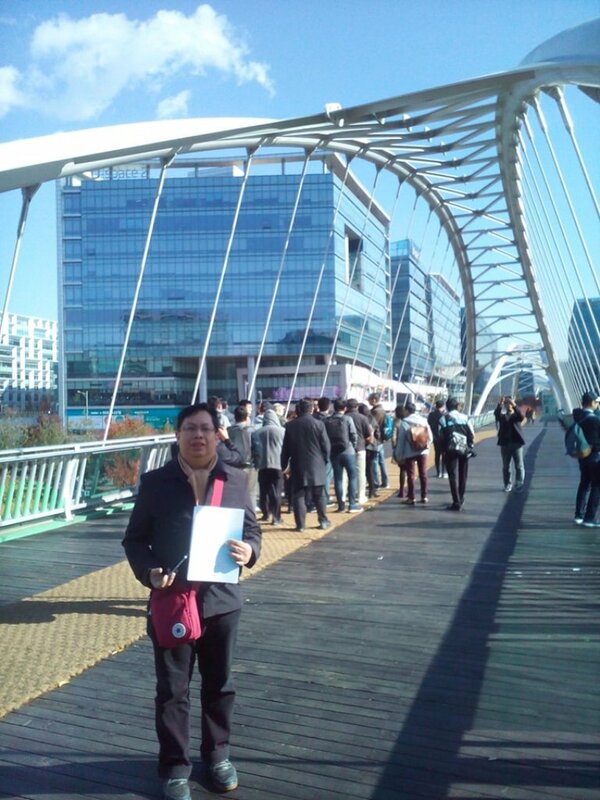 We received our Visas on November 8. 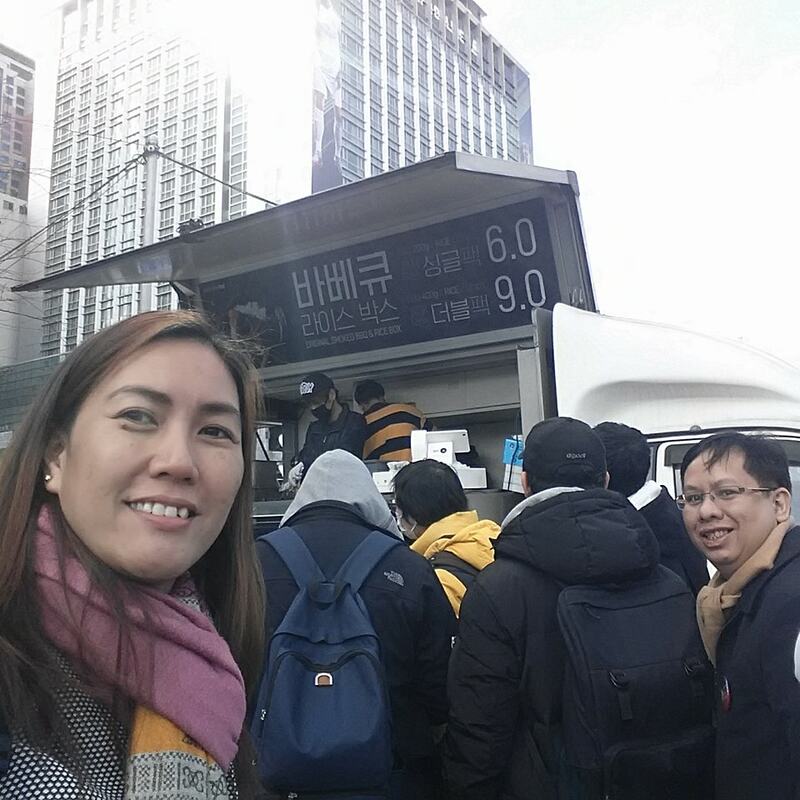 Edith was also able to purchase a promo flight from JejuAir with a round trip ticket for only P14,000++. 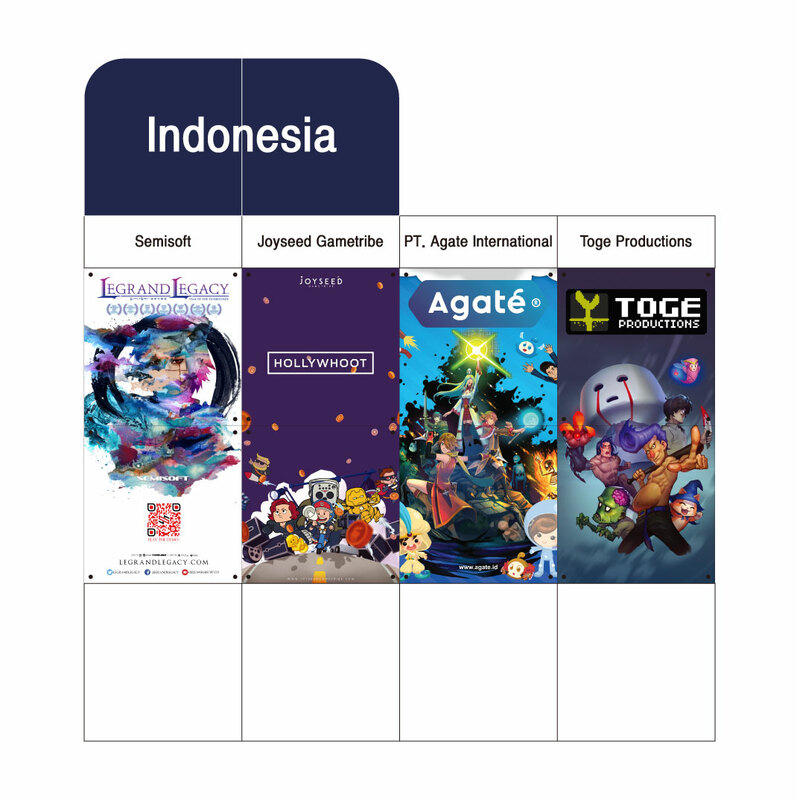 We were also asked to send our backdrop designs based on the ASEAN Pavillion design that they gave us. When I designed the backdrop for Top Peg, I decided to place Korean translations. 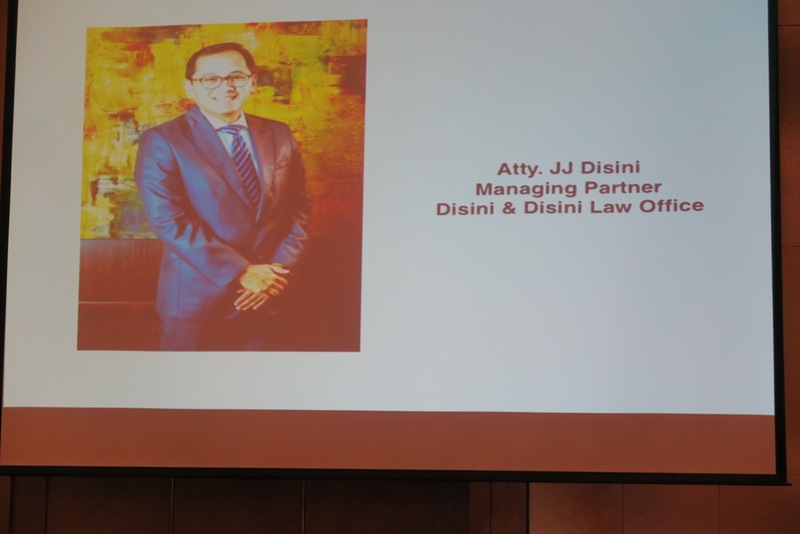 Since it was suggested by the DTI -EMB that our calling cards have a translation, then why not our backdrop too. I used Google Translate to do the translations. 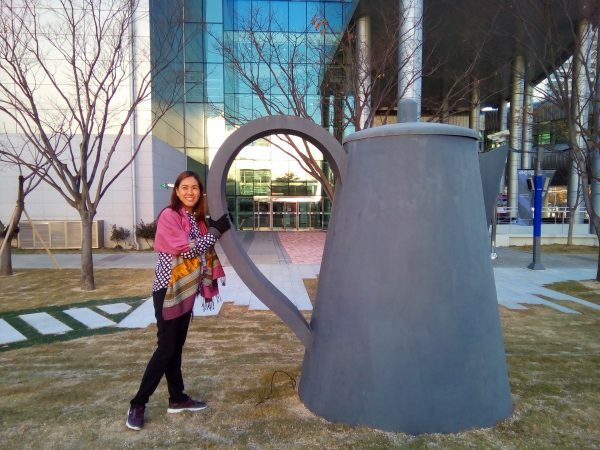 I had a cousin, who works for a Korean-English School, who had her boss check the translations. 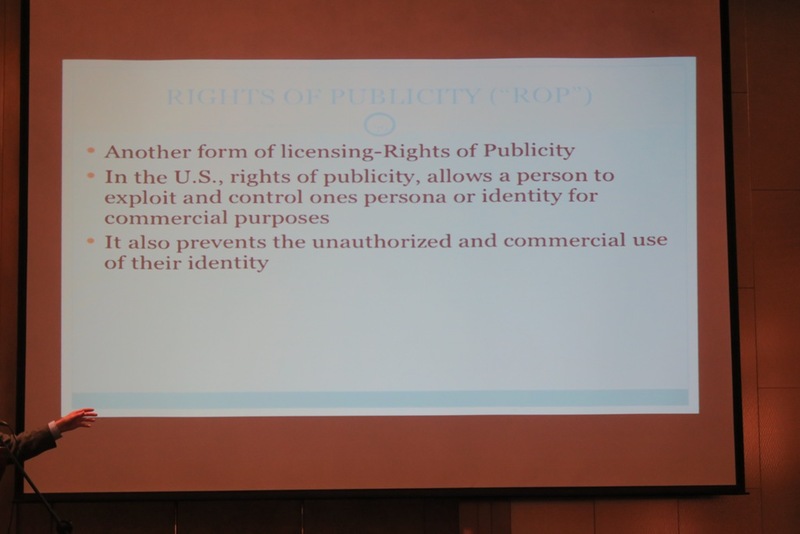 Her boss said I made a mistake on the word “CROP”, my version meant “To Cut”, instead of “vegetation”. 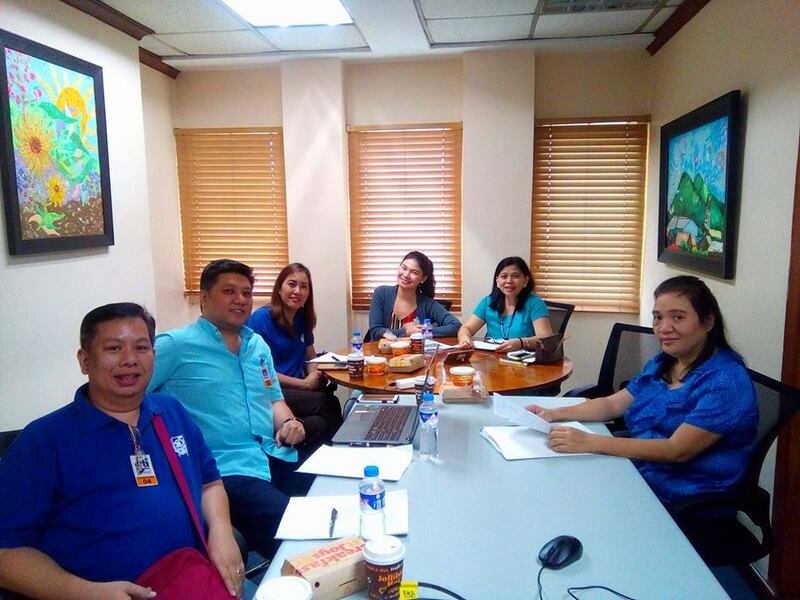 We had another pre-departure meeting at the DTI-EMB office on November 9. 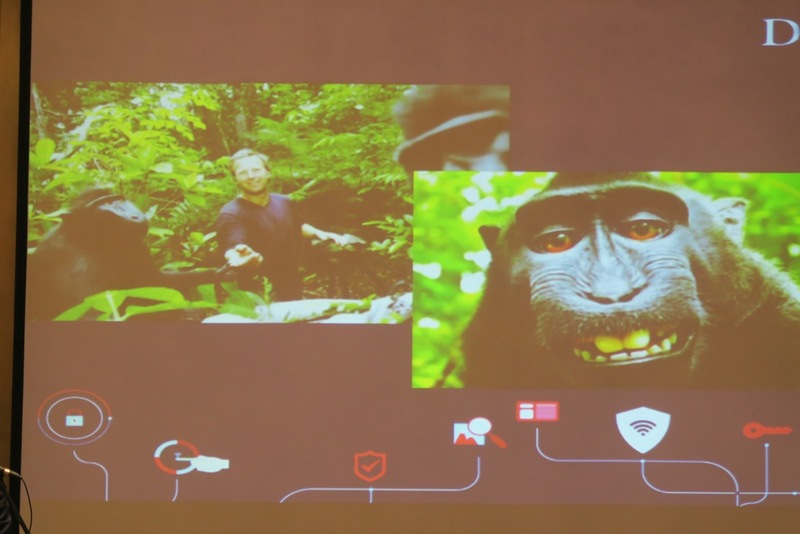 Present were all the representatives of each company, Hajee of Audacity was there via Skype. Mr. John Naranjo of Ingenuity called in sick. 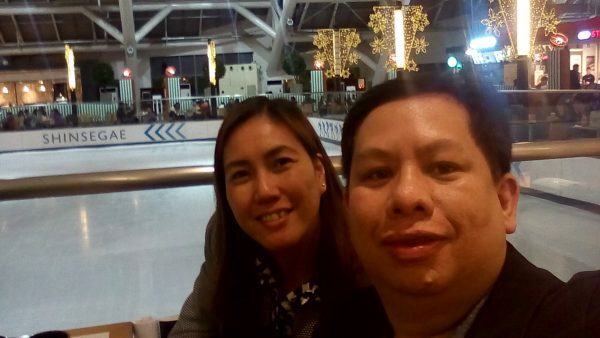 We learned that Hajee had a problem with his Visa documents, which was lost in transit since he applied for his Visa in Cebu, the DTI-EMB promised to help him fix this. 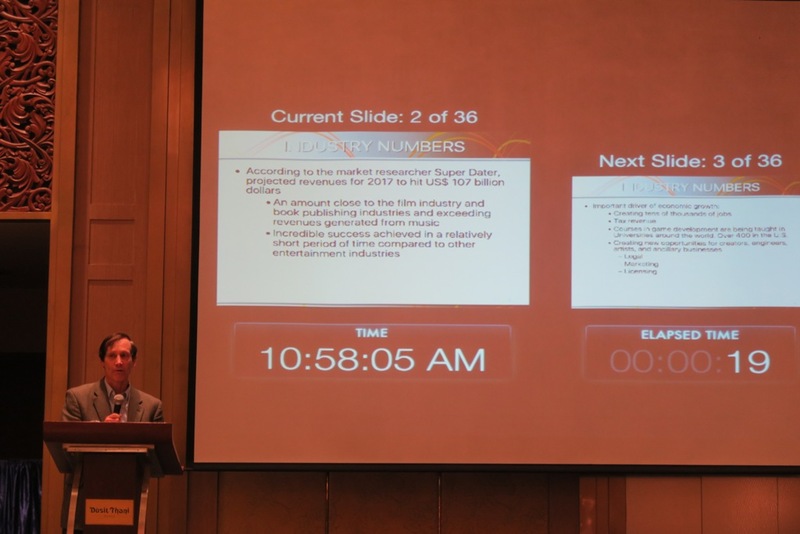 Mr. Eduardo Nilo of Indigo was voted to be the point leader of the delegates since he attended the same event last year. 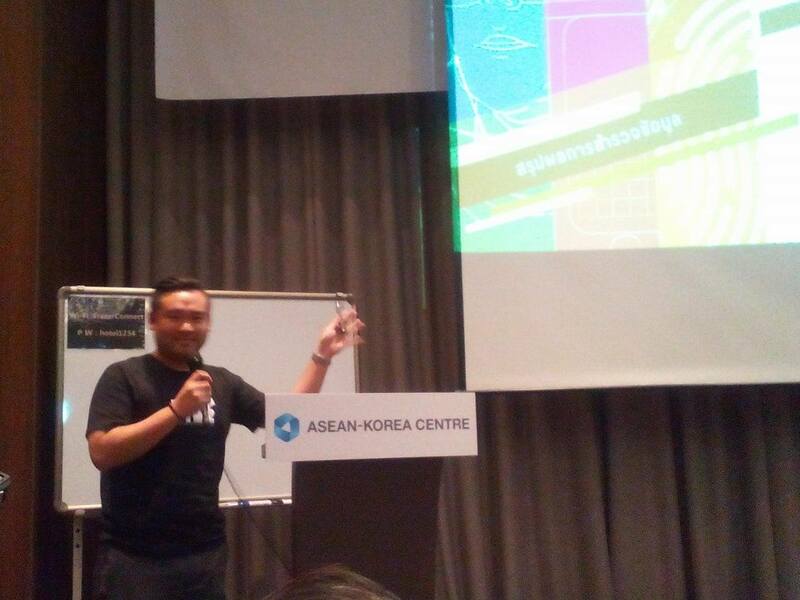 Joemar Albino of Synergy 88 would be doing the presentation for the Philippines, and I was assigned to be the photographer. 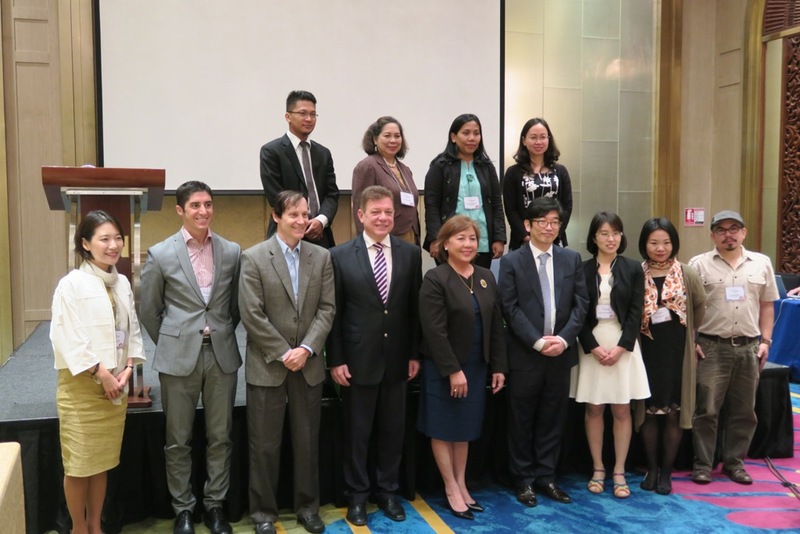 Alstaire (Top Peg), Eduardo Nilo (Indigo), Edith (Top Peg), Sofia Adap (Xurpas), Tess Loring (DTI-EMB), Glecy Cadenia (DTI-EMB). 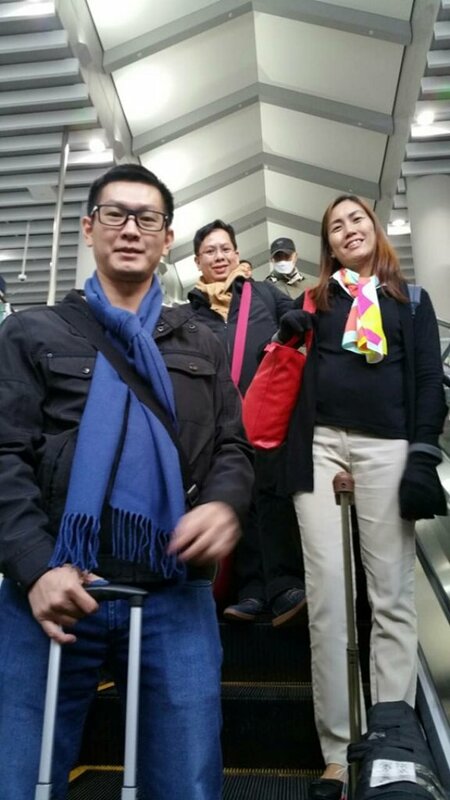 November 13 – Flight to South Korea was at 11:45 pm. 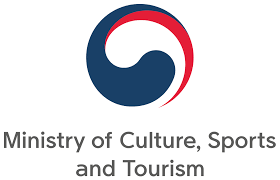 We were informed that Hajee of Audacity that his Korean Visa wasn’t processed in time as it now took 7 days to process the Visa in the province, instead of two days a few years back. He wasn’t able to join the trip. 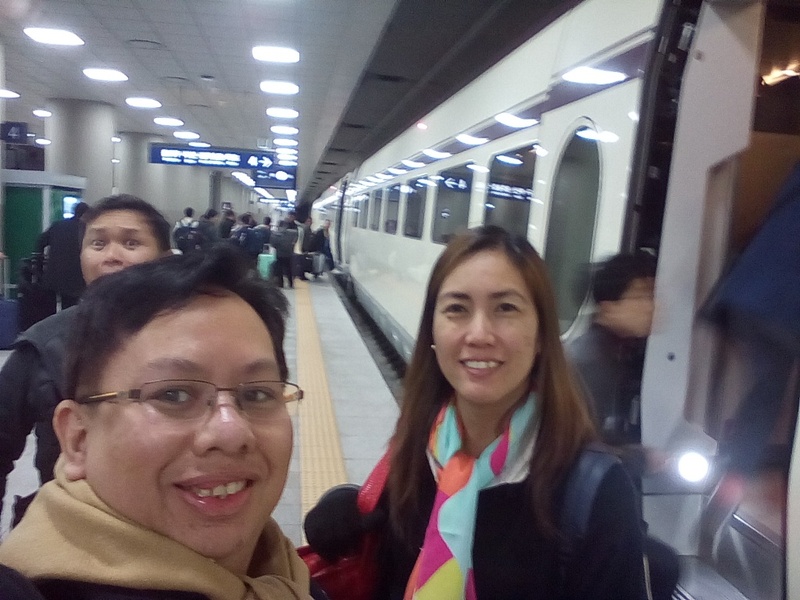 Upon arriving at the airport at around 5:00 am, we purchased a data SIM card so that I will always be online for our viber group. It cost about P1,300 for 5 days. 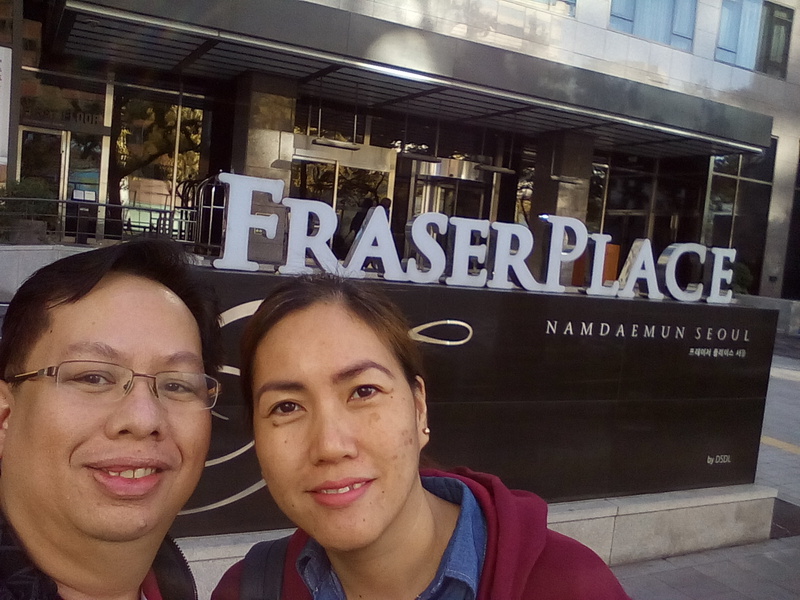 We then took a limousine cab to our hotel, Fraser Place at Namdaemun, Seoul. 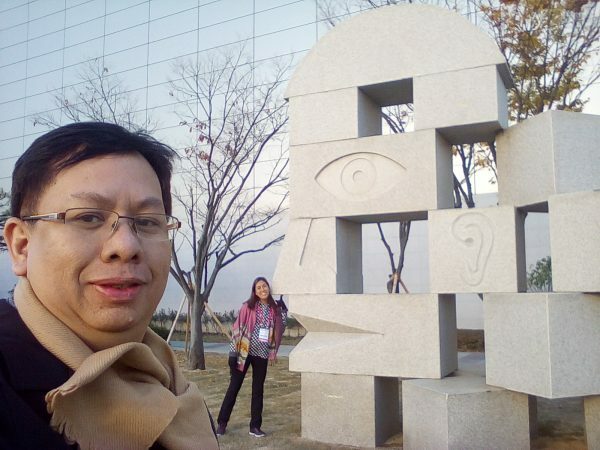 Seoul was clean and it was cold, 3 degrees Celsius. It’s a good thing we brought scarves and gloves. And when the wind blew, we froze because of the freezing air. The hotel room was nice and cozy, but our view was a construction building at the back. 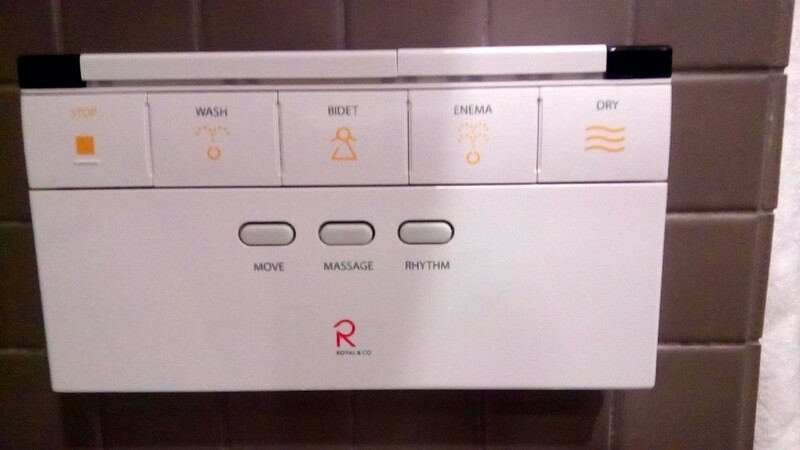 The toilet even had the controls on a tablet like a remote. 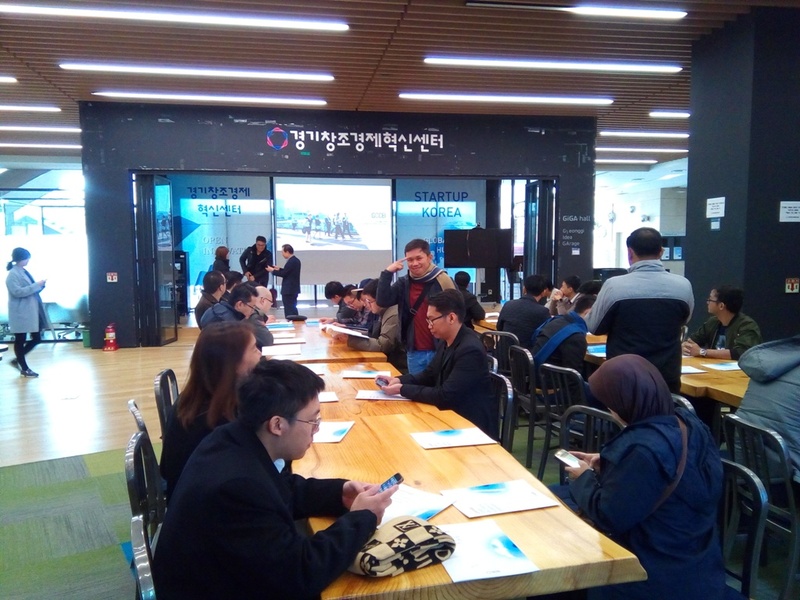 The workshop and presentation of the participating countries would start about 1:30 pm so we had time to stroll and take lunch outside. 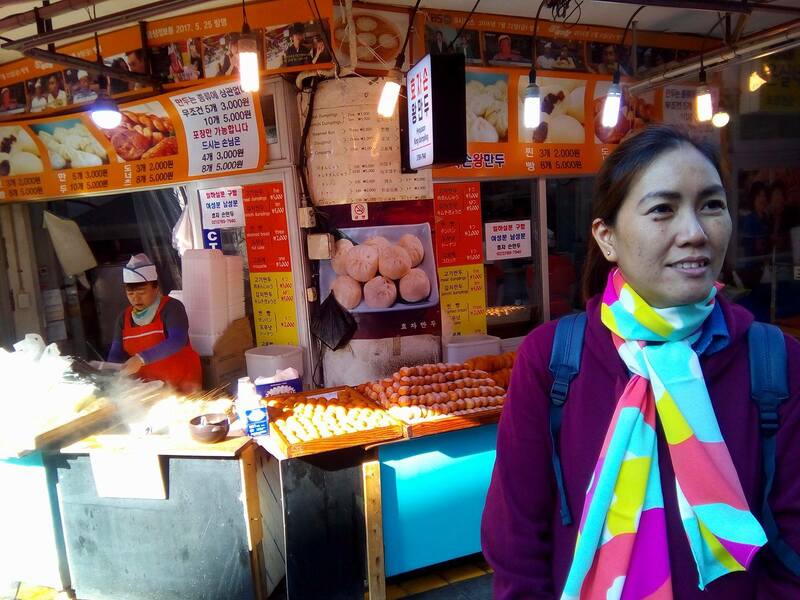 We saw the market, lots of street food and cheap clothes. We had Omurice (Omelette Rice) and Beef Soup which included a lot of side dishes. 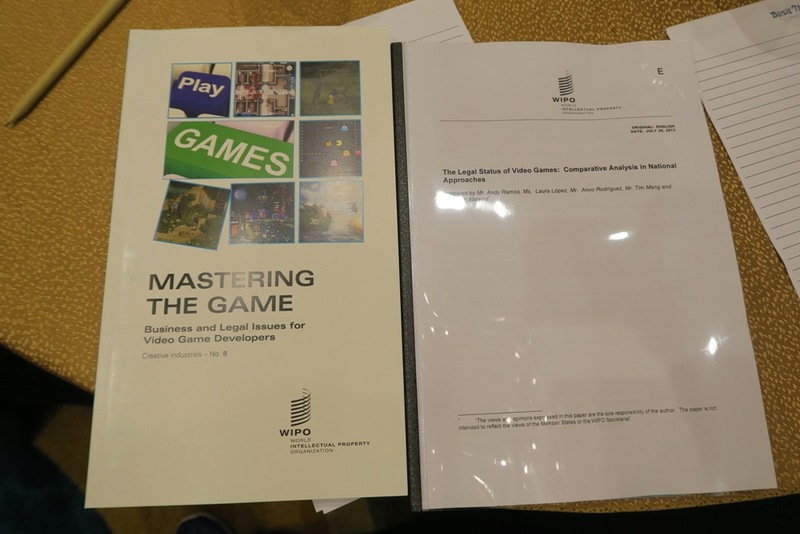 The workshop was held at the Namdaemun function room at the Fraser Place; we were given a copy of the presentations bound like a book. 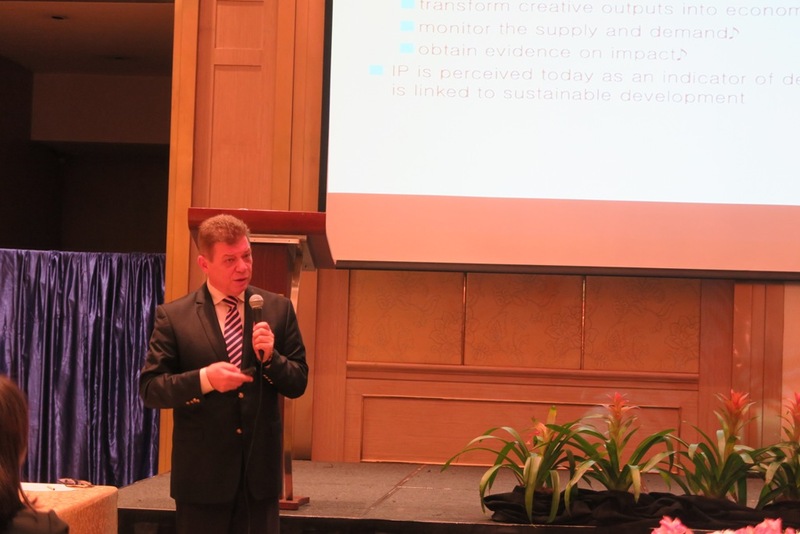 Surprisingly, the Philippines’ and Singapore’s presentation weren’t included. 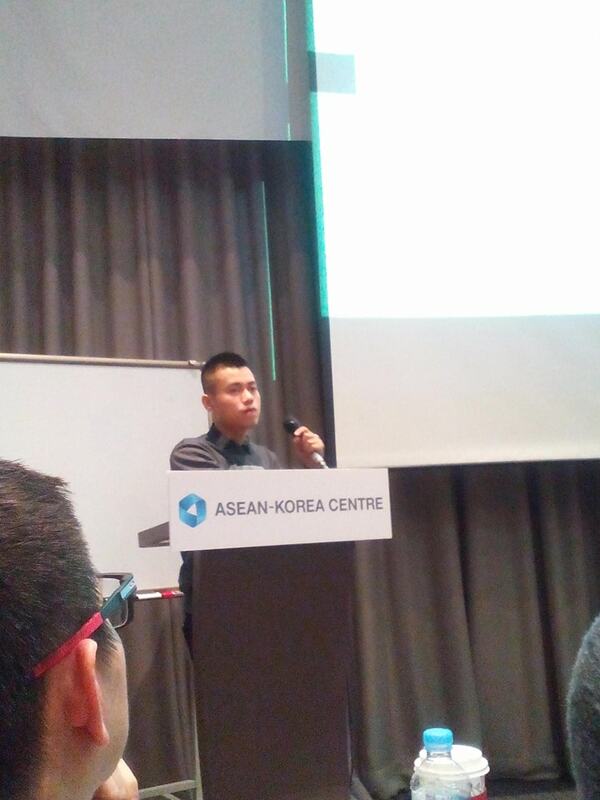 We learned that we weren’t able to submit a power point presentation ahead of the event. We were given a deadline of September, but we weren’t able to comply. 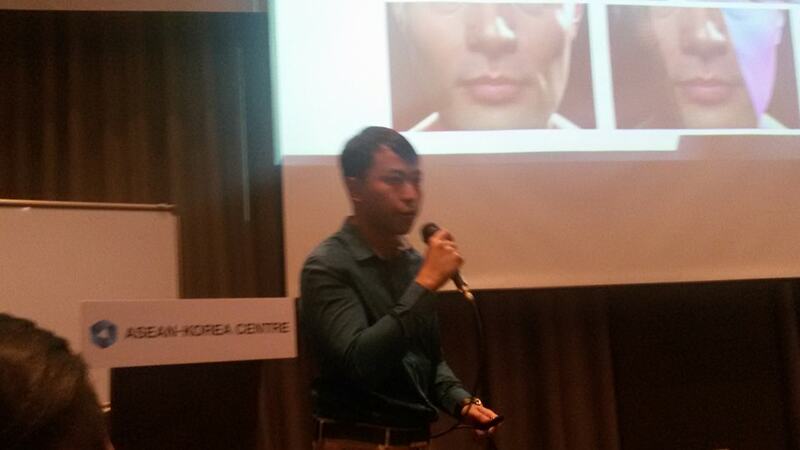 Mr. An-Jin Hun of the Asean-Korean Center (AKC) welcomed all the delegates and showed a video of this event. 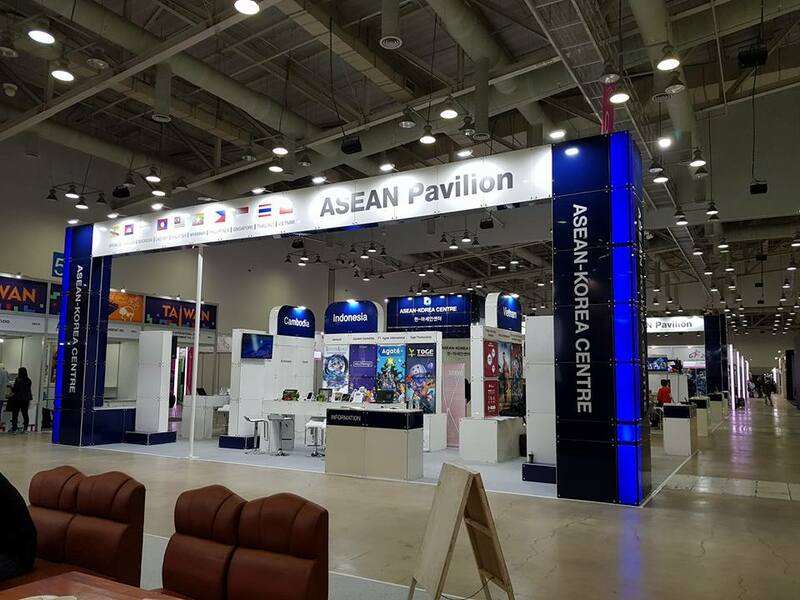 This will be played on a large screen at the center of the ASEAN Pavillion. How to make a No. 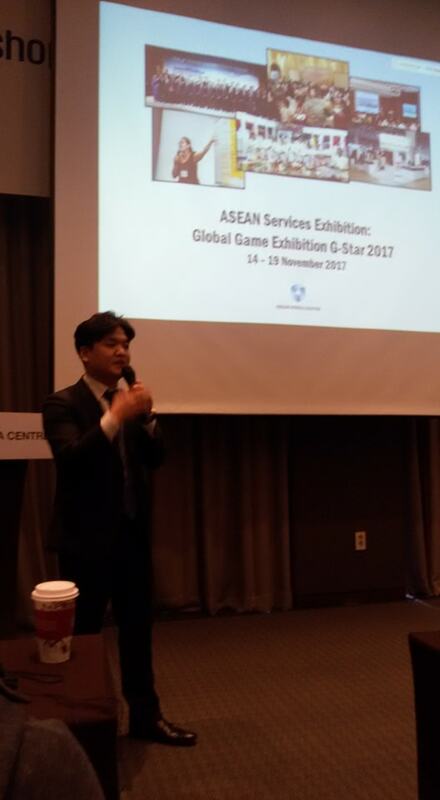 1 game across the globe (actual presentation) by Jung Mu-Sik, Vice President, Lunosoft Inc.
Mr. Jung Mu-Sik of Lunasoft Inc.
I’m not sure why they changed their presentation, but this topic gave me insights on how to market one’s game globally. 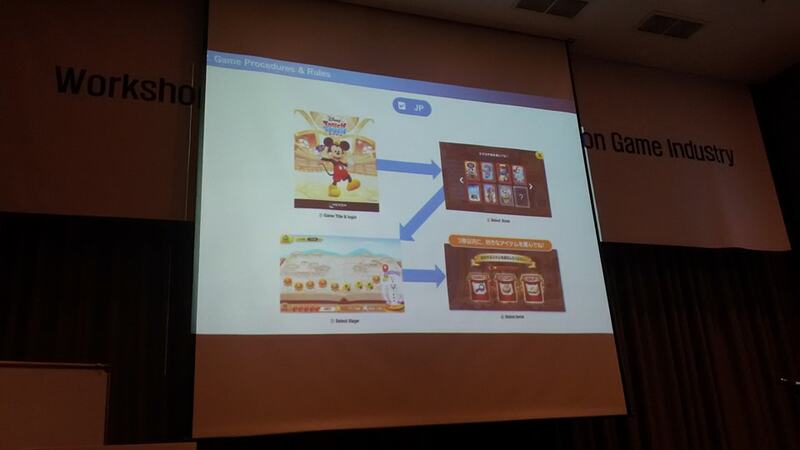 Mr. Jung talked about their partnership with large IPs such as Disney, the game is Disney Catch Catch. It is basically a “Spot the Difference” Puzzle game for iOS. 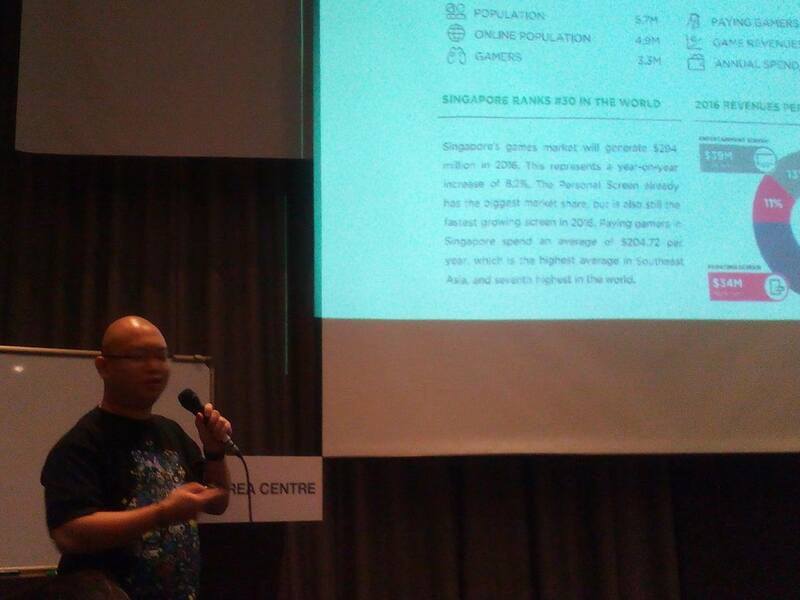 He also talked about changing design styles and gameplay depending on the country you wished to publish. 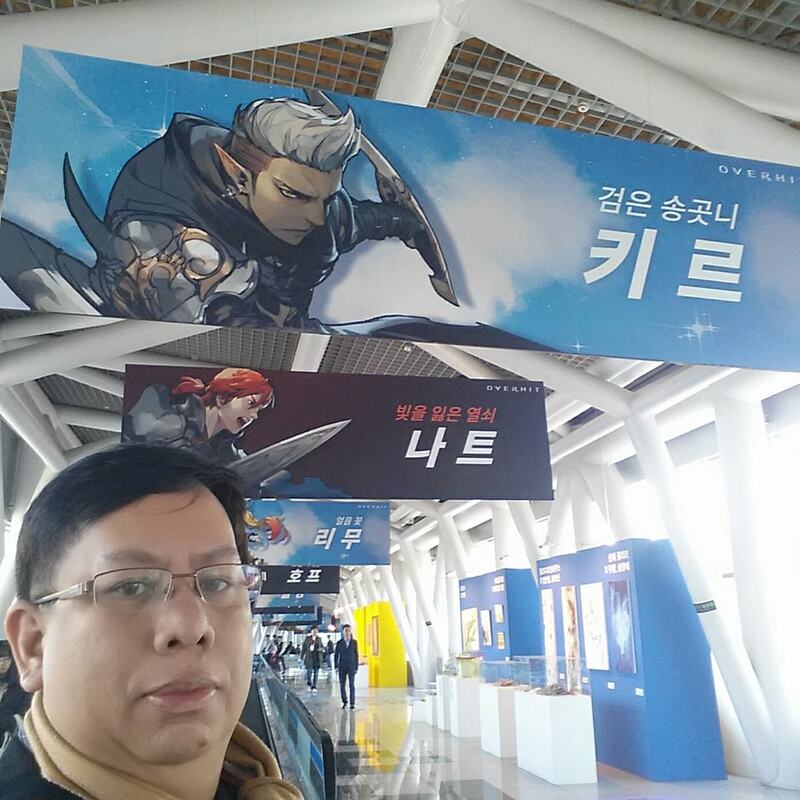 He showed the game that was released in Korea. It has a pirate story as an intro and a pirate ship in the titles. 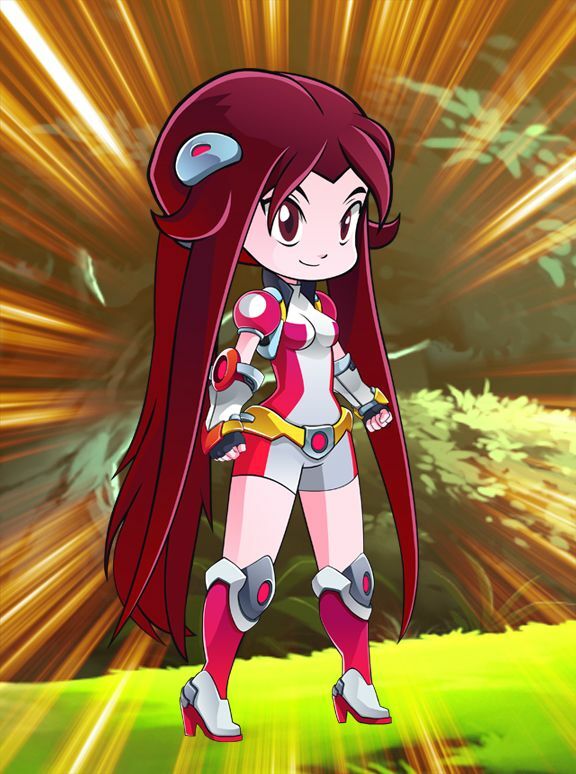 When they released the game in Japan, the pirate ship was changed to Mickey Mouse (who is very popular in Japan), who was not a main character in the game. 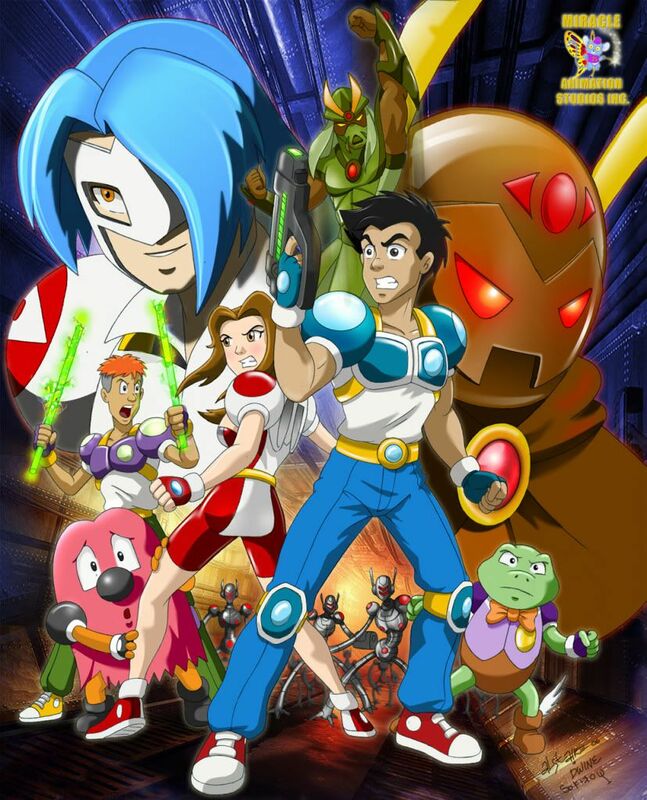 The title was changed to Disney Touch Touch, which they couldn’t explain why. And the pirate story Intro was replaced by a map with levels. Also, the Achievements and Competition modes were removed. 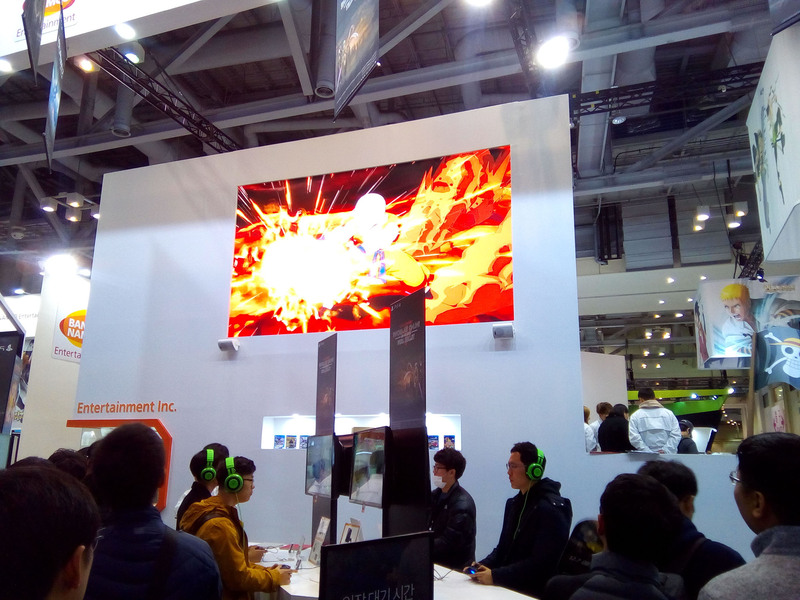 Japanese gamers don’t really like confrontation or match their game score with others, they’d rather play alone, this is according to their data research. 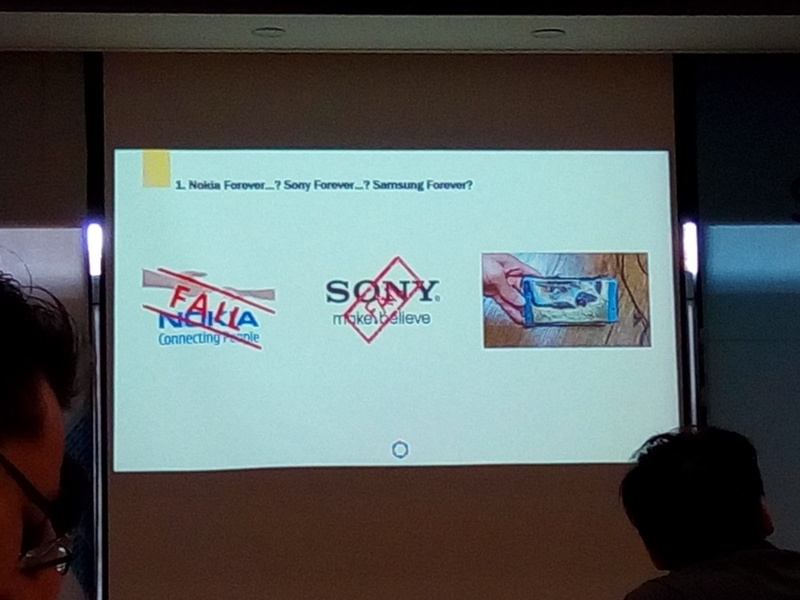 They also showed the difference in business models. 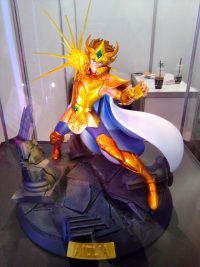 The Korean version had a store where you buy Rubies as currency for In-app purchases, while in the Japanese version, you buy a Gacha, which is an eggshell toy where you don’t know what prize you will get inside. Items for sale were also different, Korean version had different Pirate Ships while the Japanese version had Pens with Disney Character Heads. 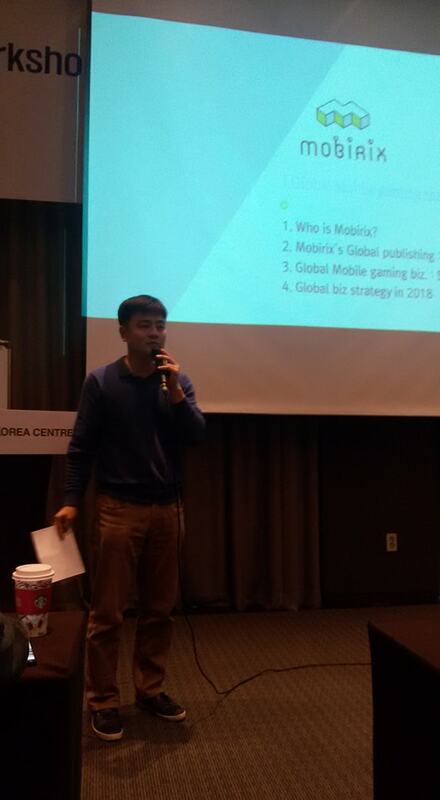 Global Mobile Gaming Market Strategy by Mr. No Hyun-Kwan, Director, Mobirix, Co.
Mr. No Hyun-Kwan showed different business models for the game but showed that the best model for them was the combination of Ads and In-app purchases. 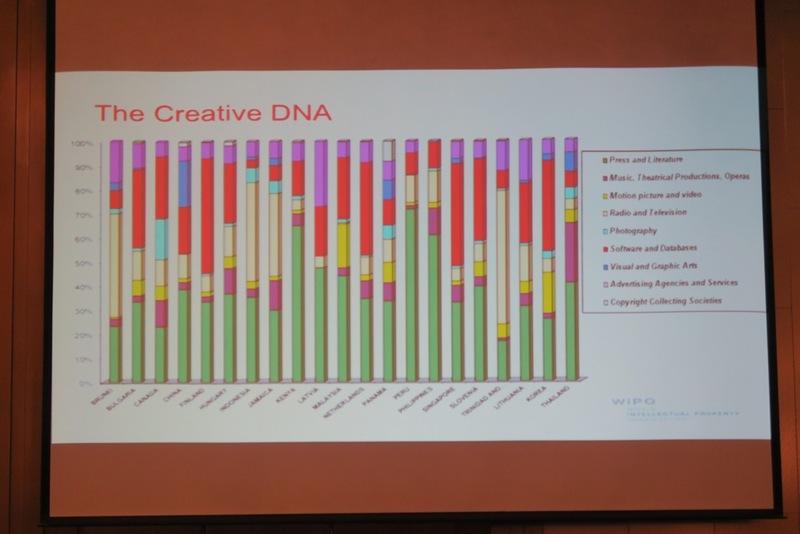 They showed charts on their games’ progress. 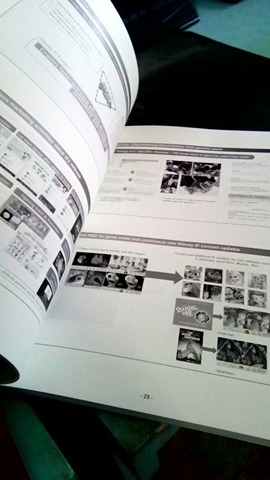 Usually, the life cycle of a new mobile game is a few weeks. After launching, a game gets featured, it gets a few thousand downloads, then it gets forgotten. 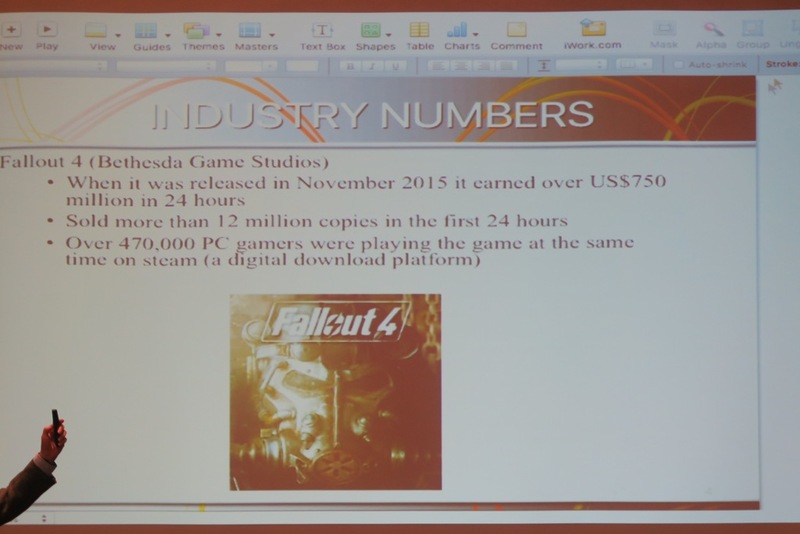 As a business model, developers need to plan on how their game be sustainable for months than weeks. 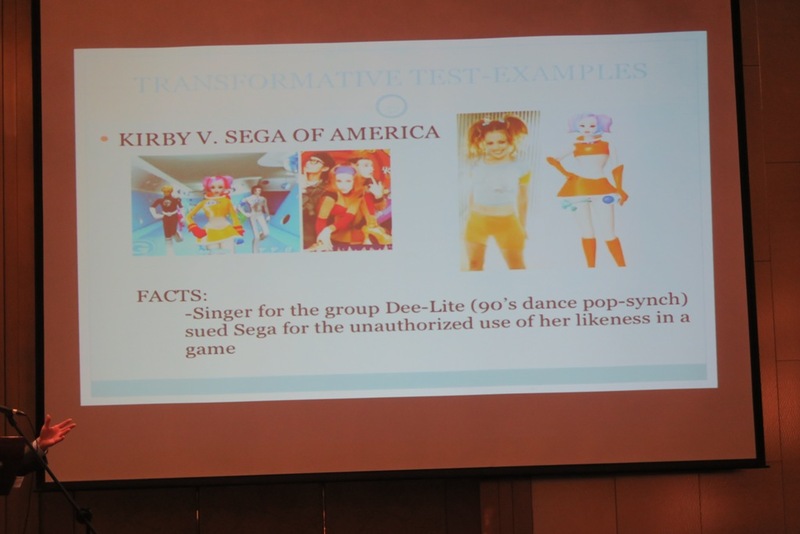 Next, they showed us the business model they apply in their games. 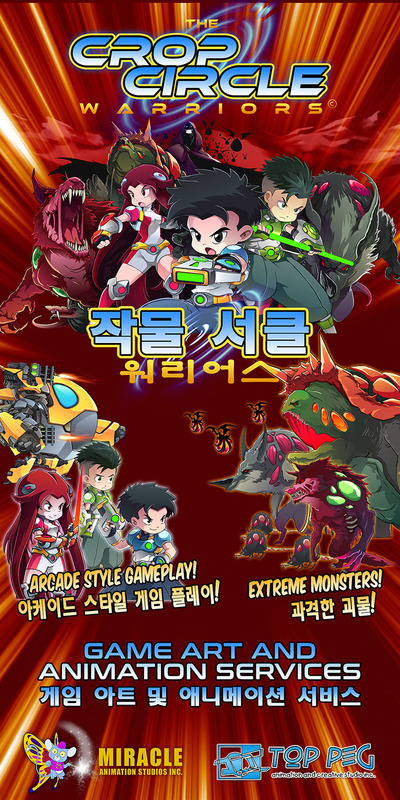 One of their games, Shooting King was launched April 2017, It was a Free to play the game with Ads and In-app purchases. It got featured in Google Play in the same month, then they improved their In-app purchases and Ads by July 2017, and pushed marketing by October 2017. 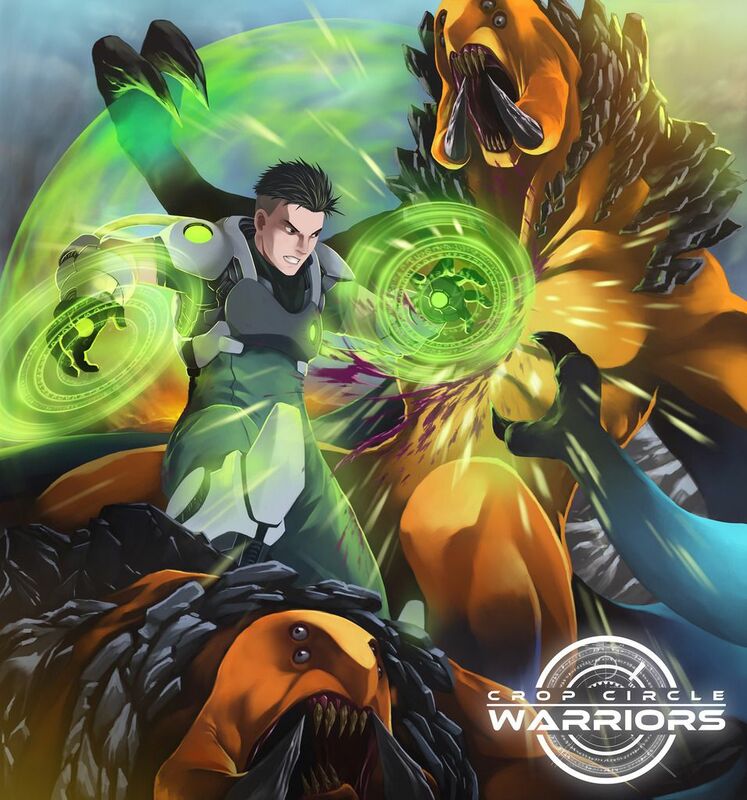 This was done as a plan to sustain the game for several months. 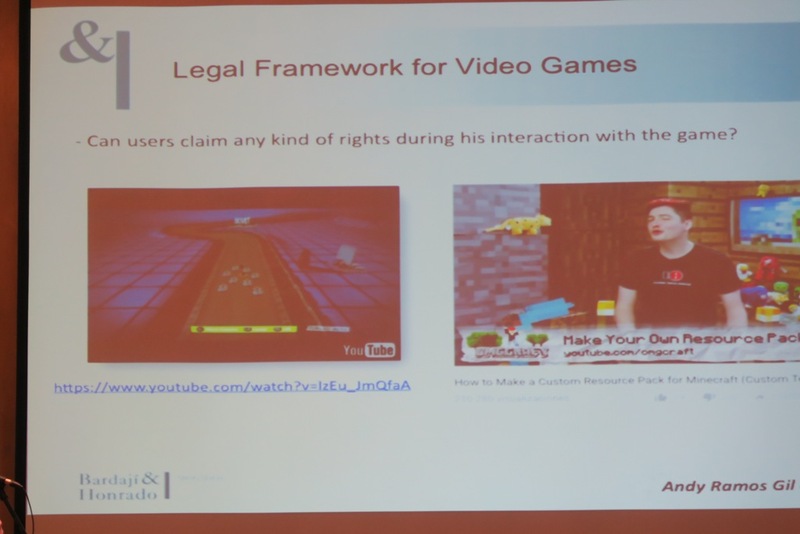 They also said that it is not enough to use social media to market your game. Social media is just 1 of 28 ways to market. Press release, blog sites are other ways. And having a good customer support service is a good strategy to have for your game. 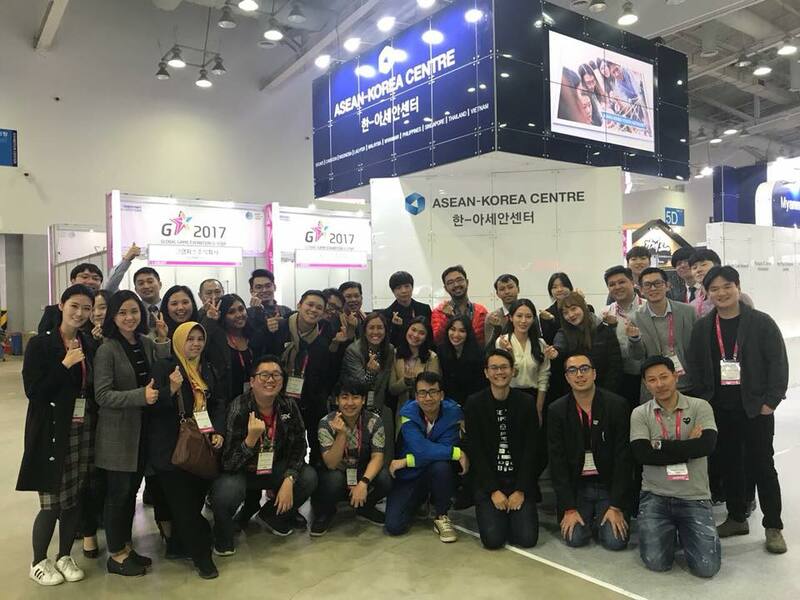 Entering ASEAN Game Market and Related Issues, by Mr. Kim Dong-Sung, CEO, Movegames Co.
Also, he says, aside from mobile, Steam, is a new platform that ASEAN market can tap. 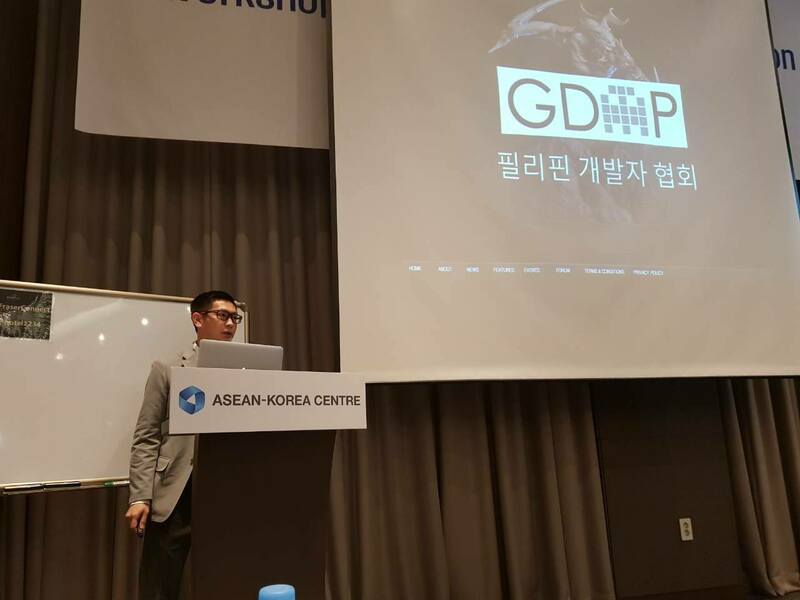 He also said that the PC-Online Game is a huge and growing market, and Korean developers and publishers are entering into Steam. 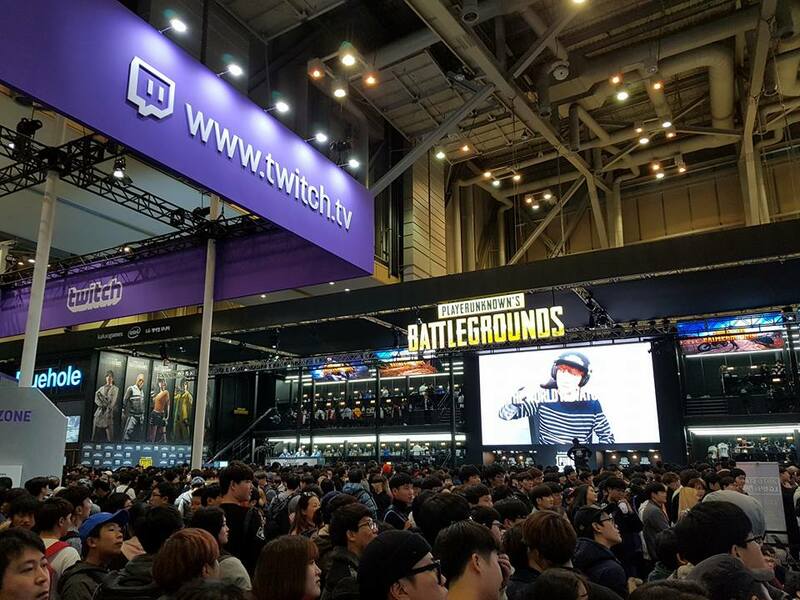 One Korean game that was successful was the “Battleground” game. 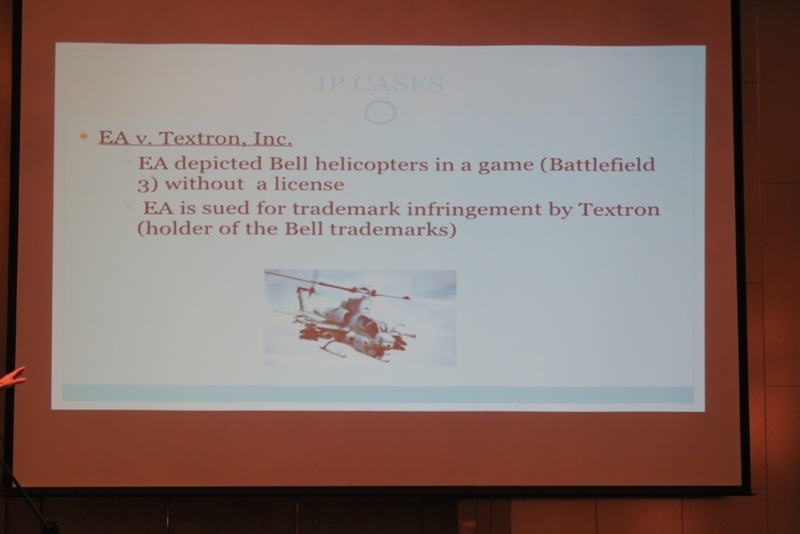 They are also testing out a new business model for mobile games, Animation IP. 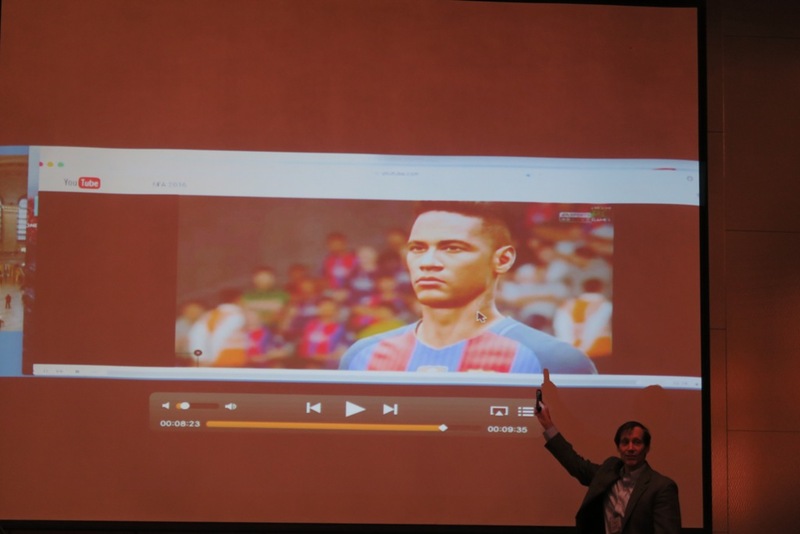 Where the player needs to watch a video (story related to the game) to be able to continue playing. 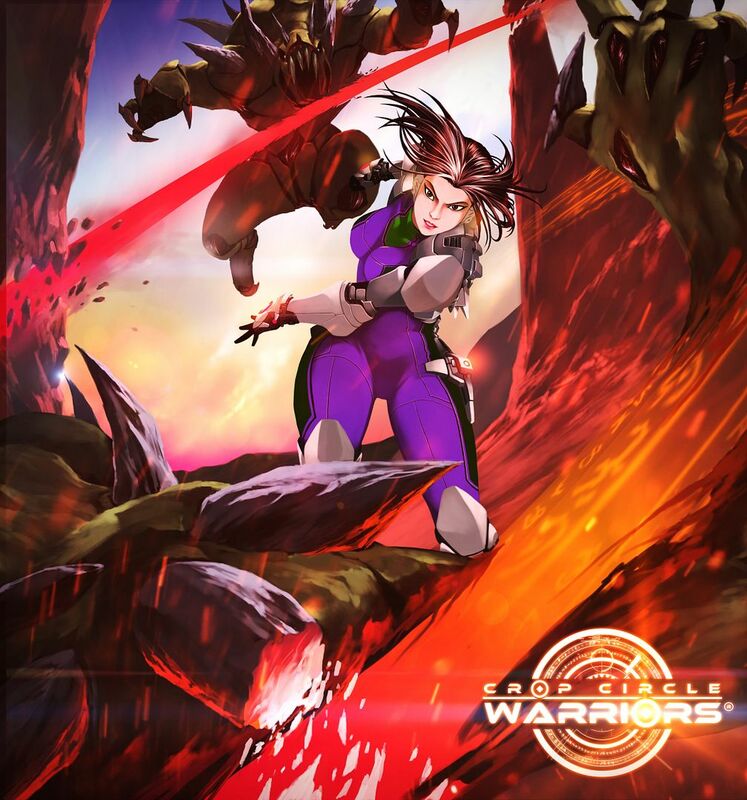 Since most of their games are based on existing IPs such as Power Rangers, this made a lot of sense. This new business model is still in the prototype stage though. Next presenters were from each country. 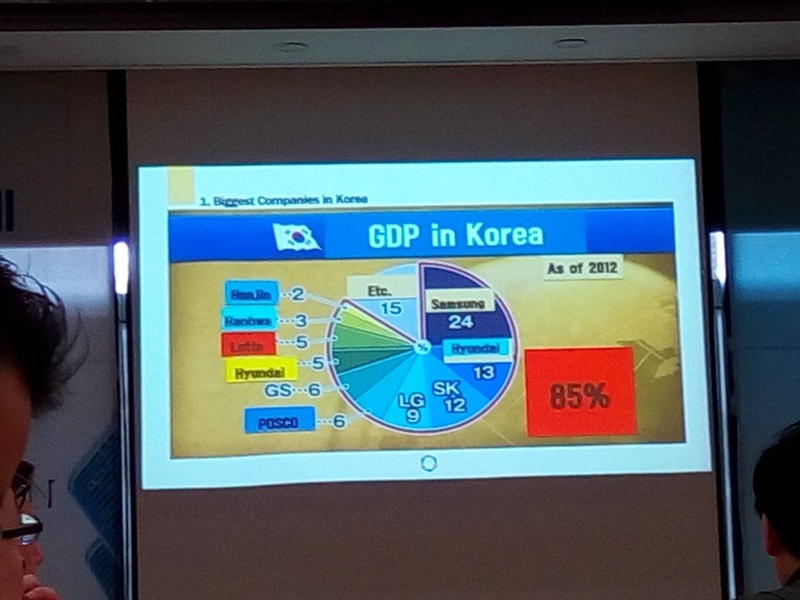 Mostly they showed statistics of their country. I will just list the statistics or if there were some information relevant to that country. 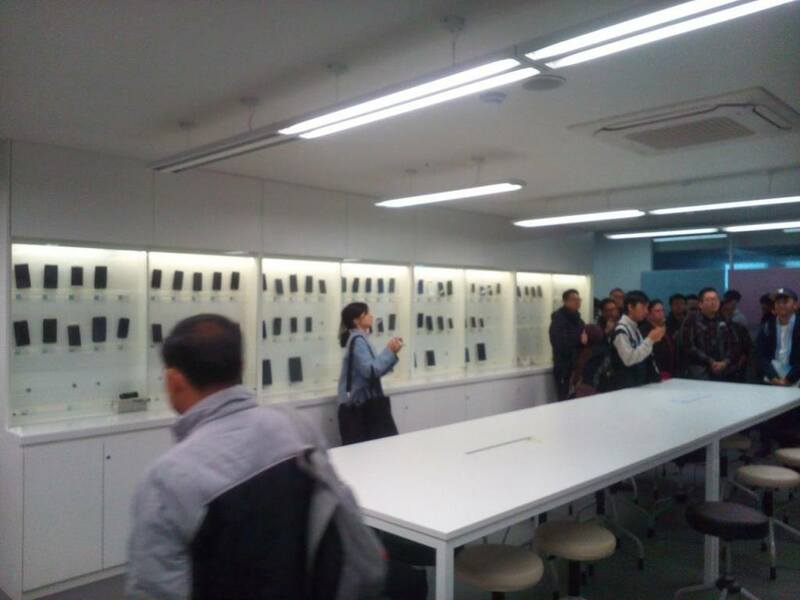 Some people had more than one phone which is the reason that the subscriptions is higher than the population. 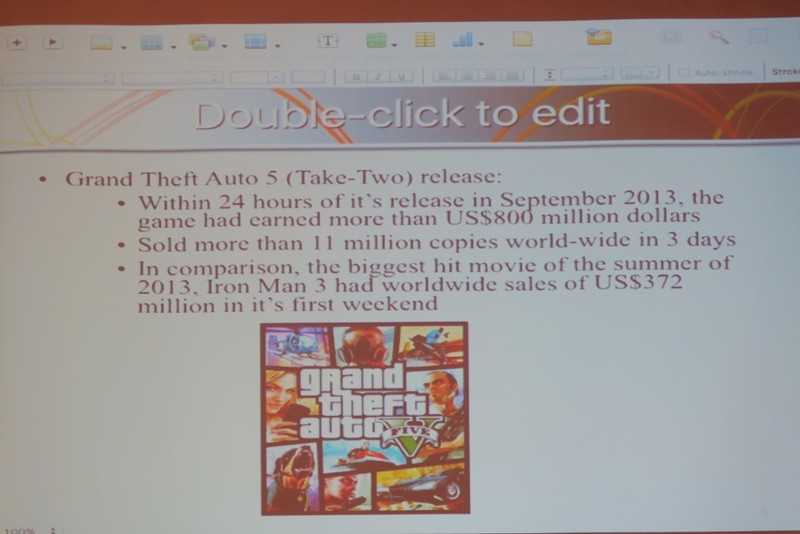 One problem they faced with mobile gaming was the payment system. 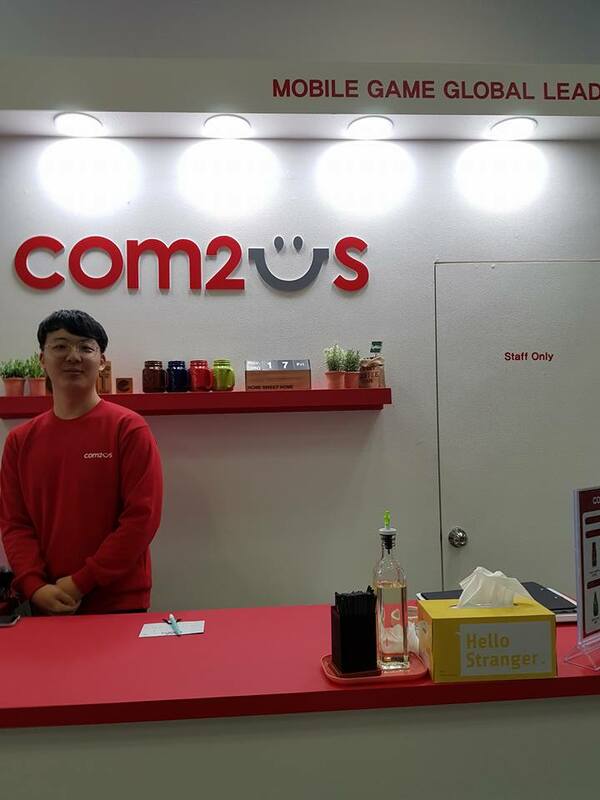 E-payment gateways through local banks are still growing, and recently First Data Merchant Solutions was established. 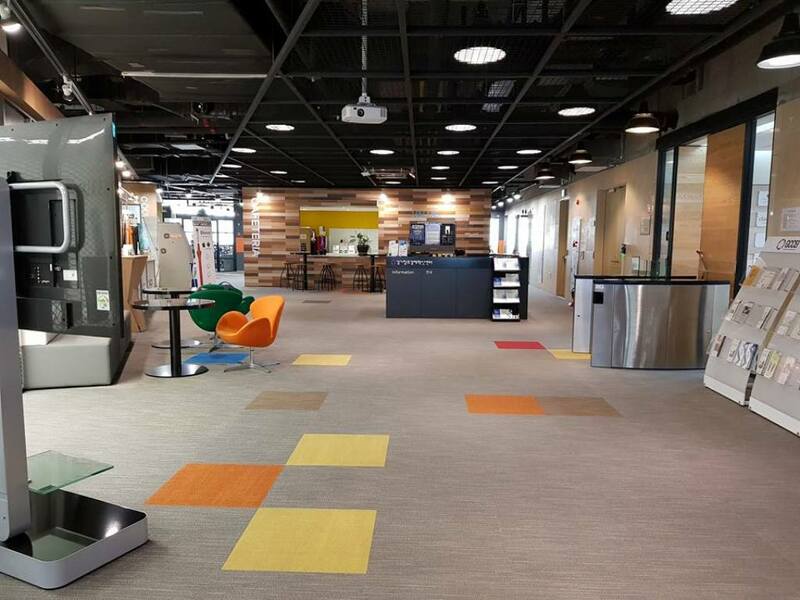 Also, a Korean company FinTech will be setting up a Centre in Brunei. 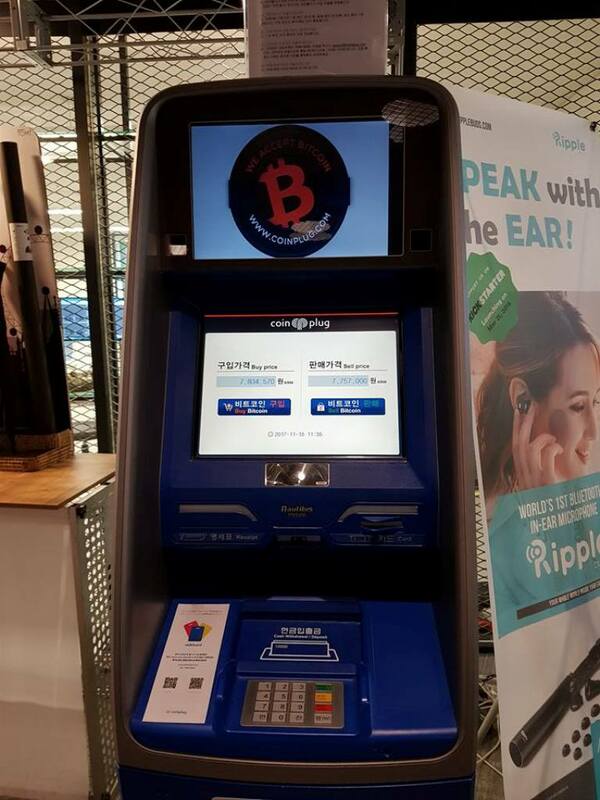 Bitcoin is also being accepted. Hope for a serendipitous hit. 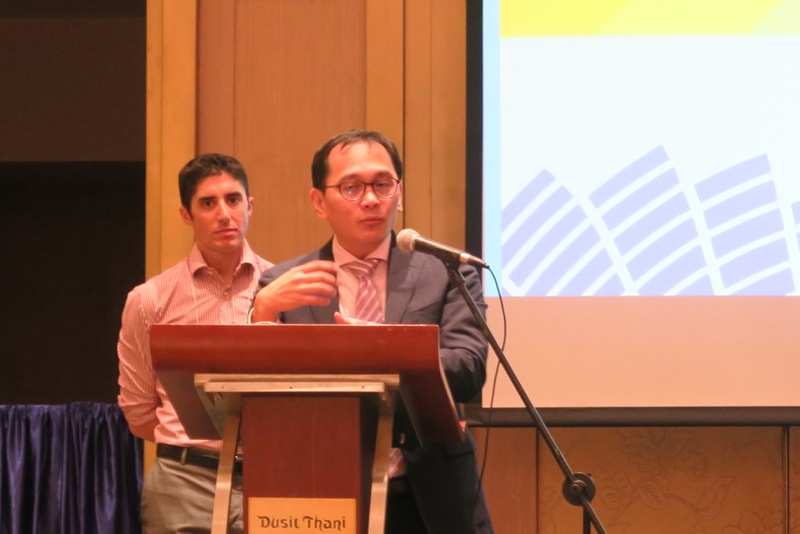 Mr. Fahran is subsidized by the government, according to him, if you do business with him you are basically talking to the government of Brunei. 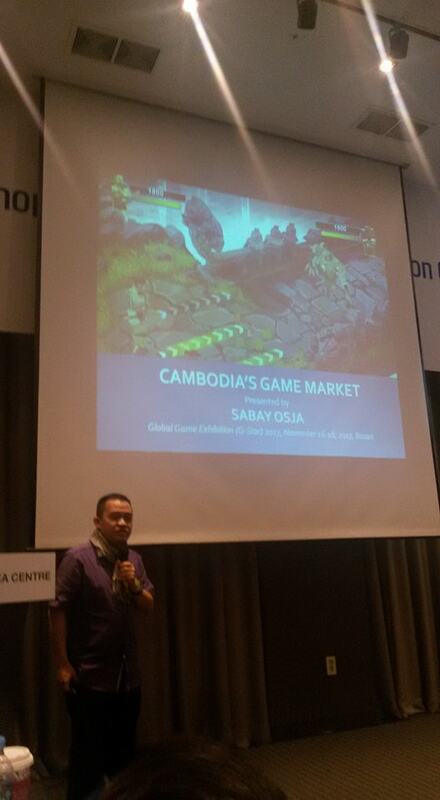 2) Cambodia’s Game Market by Sabay Osja Co., Ltd. 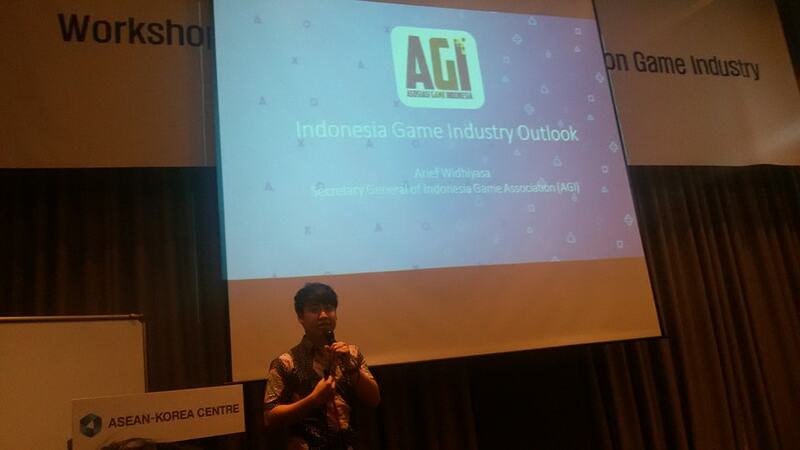 In Conclusion: In general, Indonesia’s gaming market is growing very fast. 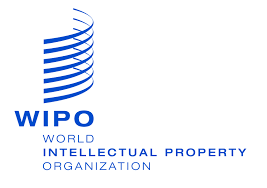 Predicted to be 1 Billion USD by 2020. 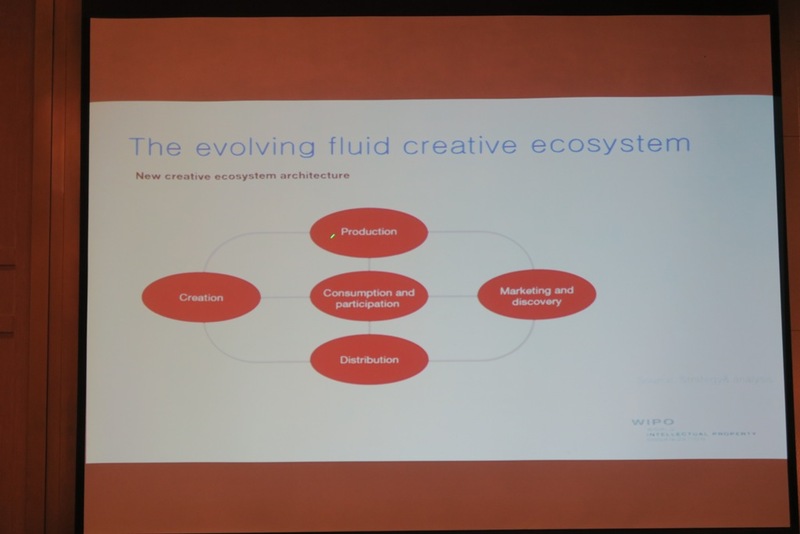 Local game industry ecosystem still very bleak, yet the potential is there. 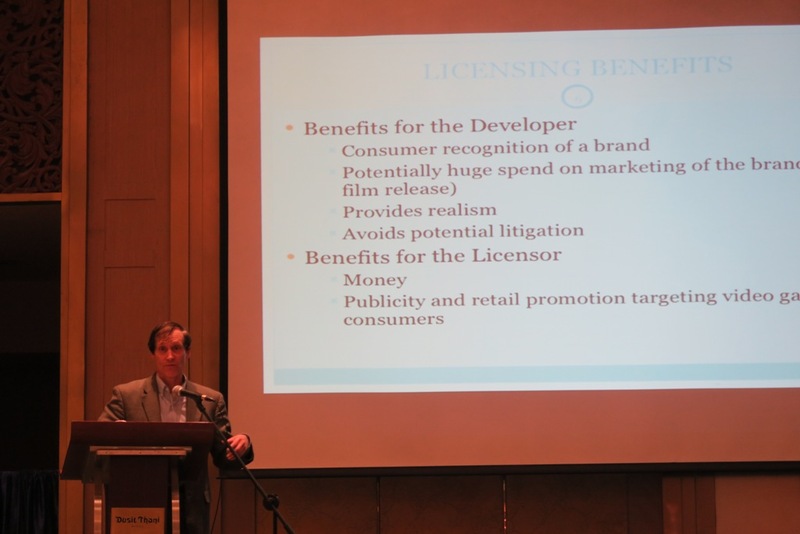 The speaker showed more of Malaysia’s growing achievements in the game industry. 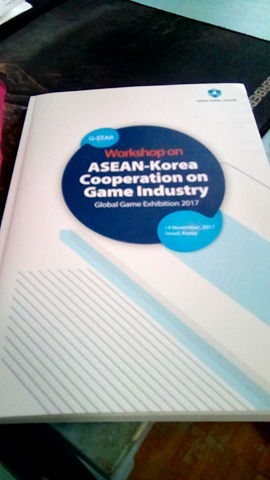 We are not included in the book because GDAP wasn’t able to provide the presentation when the AKC needed it for printing. 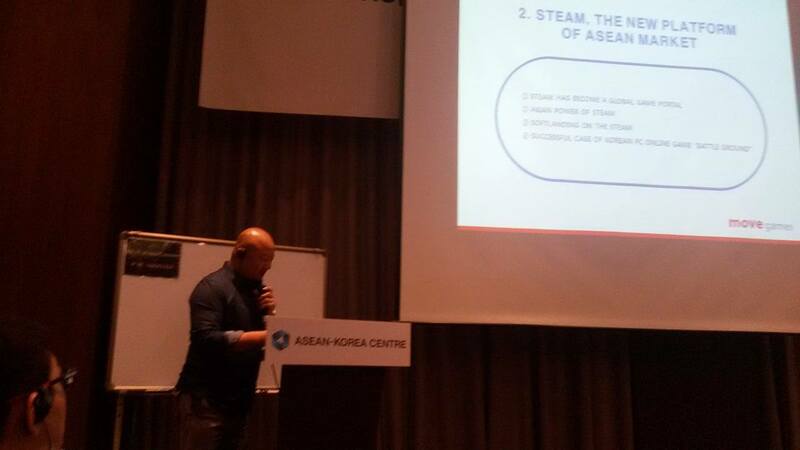 Anyway, Joemar talked about the Philippines being the go to a country for game testing and quality assurance. 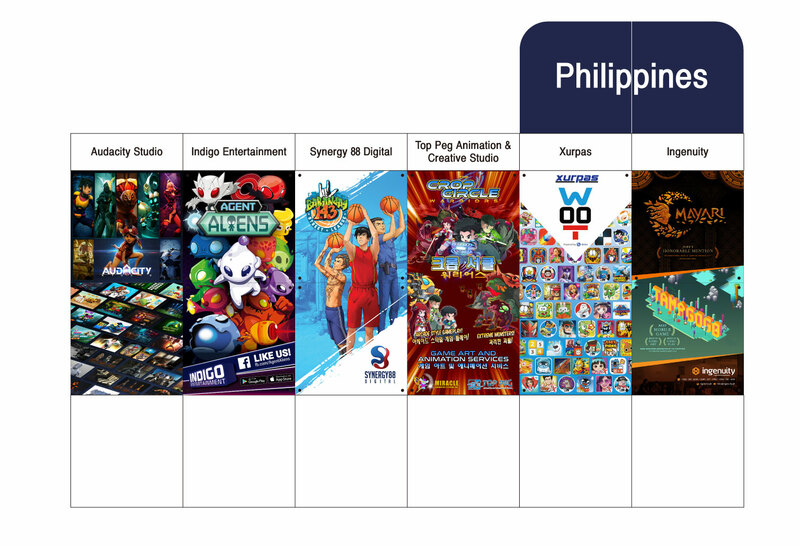 We also have schools that offered game development plus a growing industry of game developers, publishers and more. 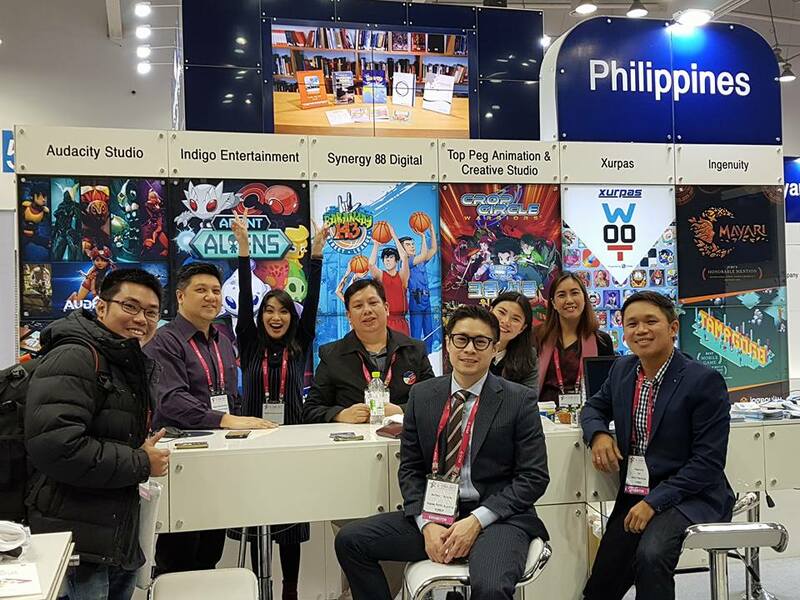 Big companies, such as Ubisoft, are now setting up shop in the Philippines to tap the bountiful talent that is available in the country. 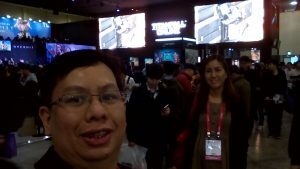 Paying gamers in Singapore spend an average of $204.72 per year, which is the highest average in Southeast Asia, and seventh highest in the world. 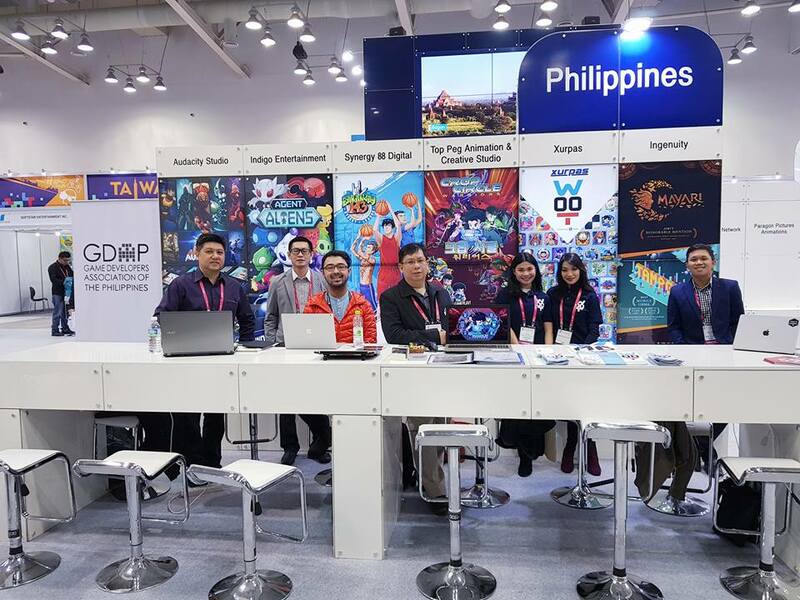 Thailand is in the Top 20 Countries for Game Revenues 2016 at number 20. 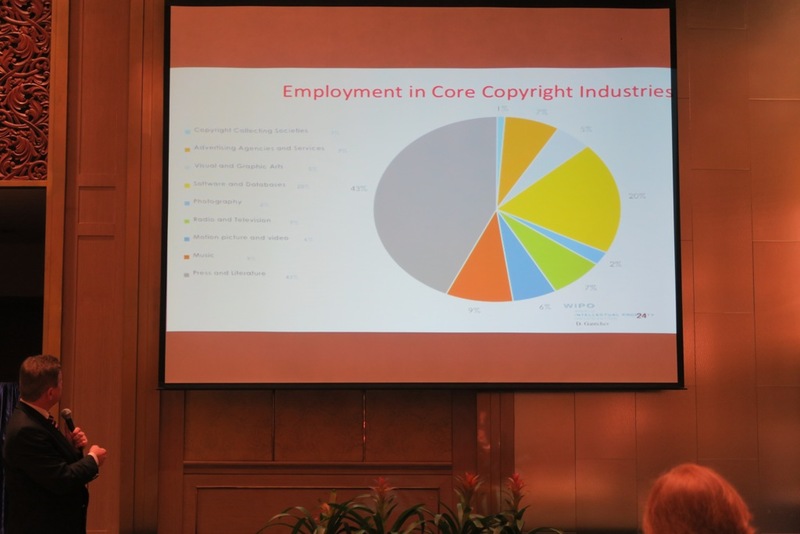 Thailand has Publishing, Art Outsourcing, and Game Outsourcing services. 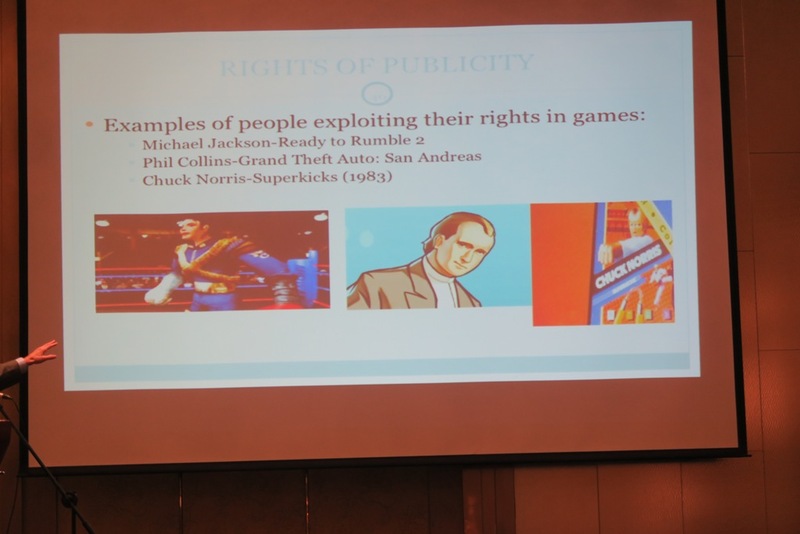 They also have their own IP and won some awards. 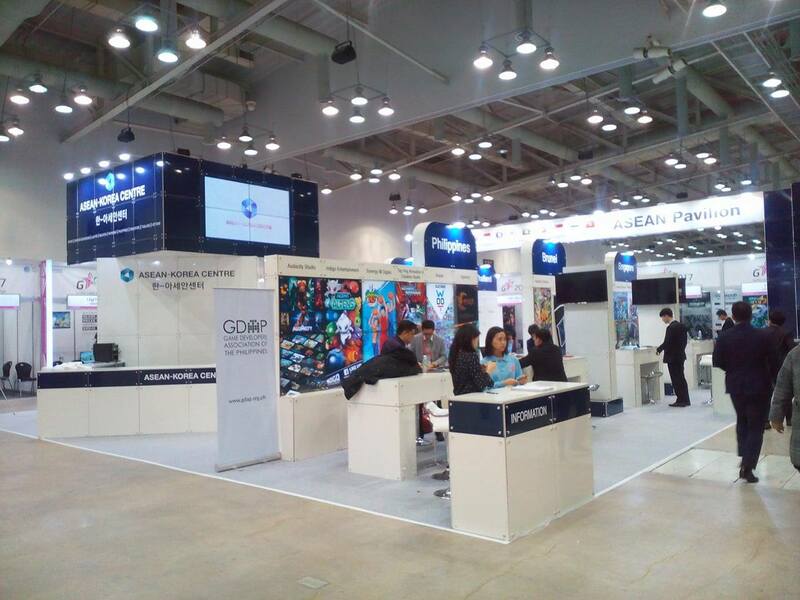 Their primary market is China and Japan. 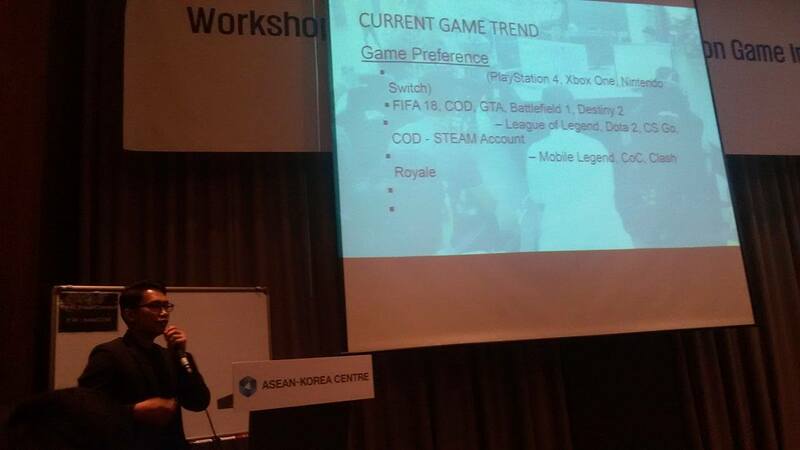 They are planning to target more female-oriented games because women have more mobile phones than men. 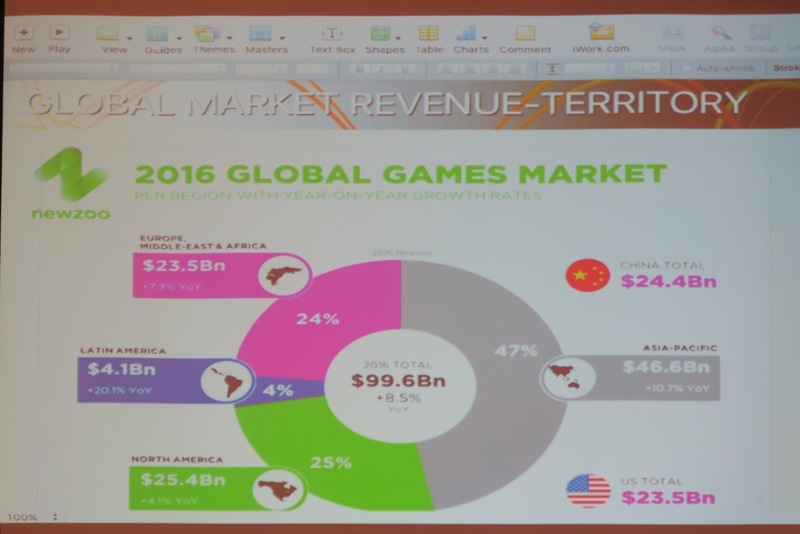 Also, eSports is very popular in their country, hence competitive games are a top draw. 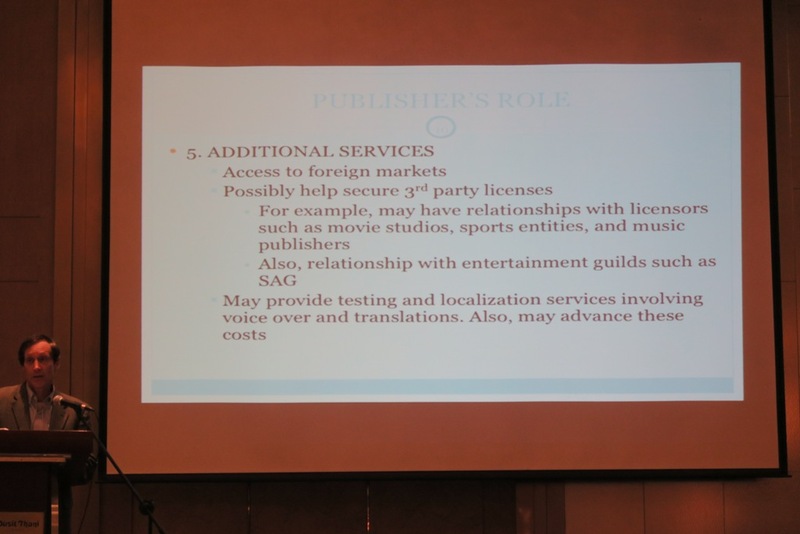 Or better yet, choose the right local publisher in Vietnam. The talk ended about 6:00 pm, we then went out of the hotel to see some of the sights at the market and ate dinner. 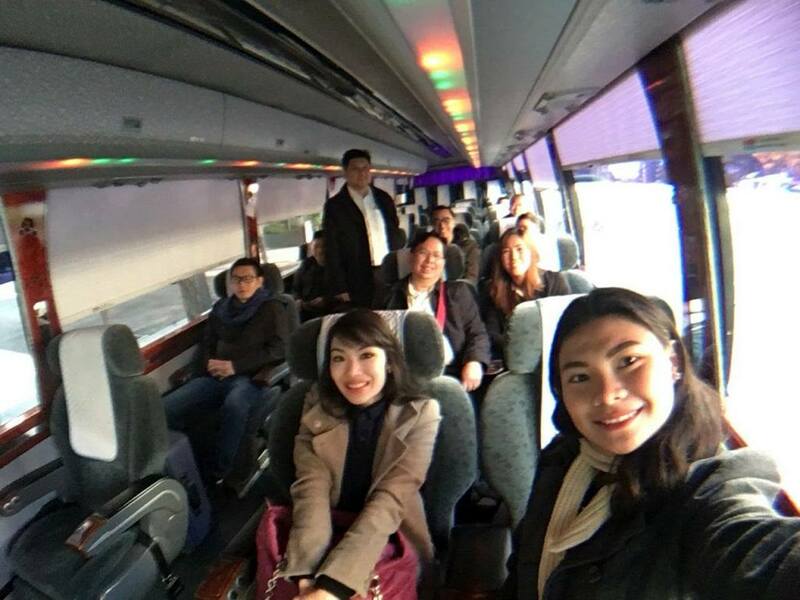 9:00 am – All the delegates regrouped at the Fraser Place lobby for the Industrial Visit; two buses were provided for all the delegates. Bus 1 had Malaysia, Brunei, Myanmar, Indonesia, and Cambodia. We were in Bus 2 with Singapore, Thailand, and Vietnam. 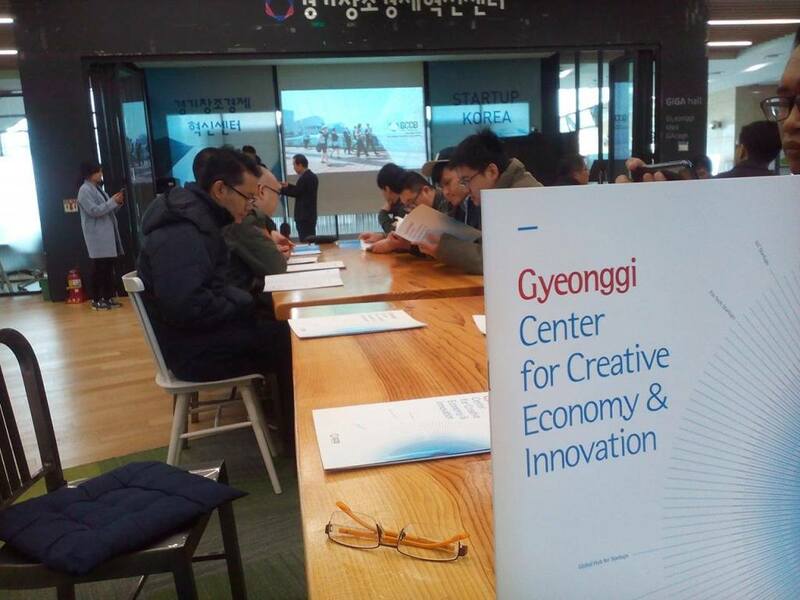 It was a 45-minute bus ride to Pan-kyo where the Gyeonggi Center for Creative Economy & Innovation is located. 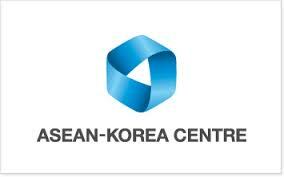 The Center is located in a valley in Pan-kyo, South Korea. 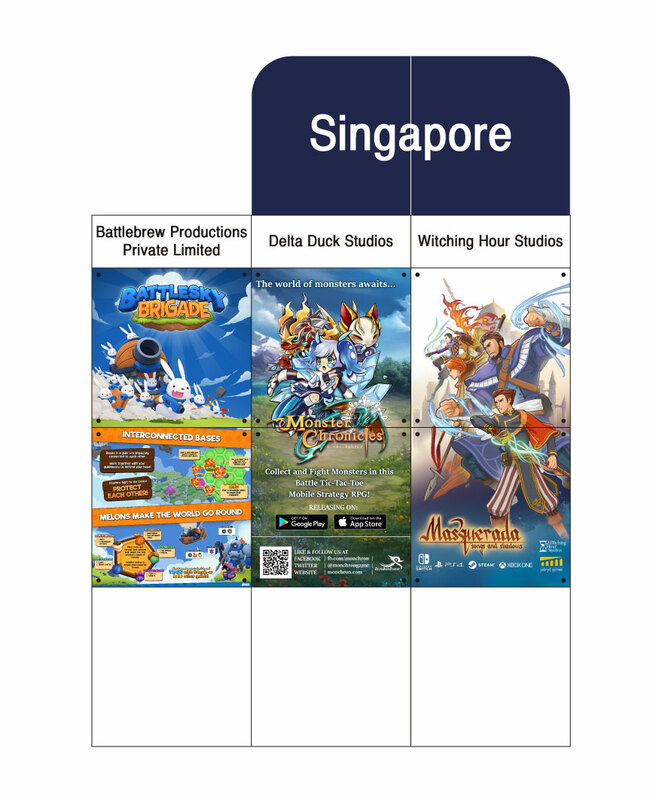 There are several centers here that house game and animation studios, research centers and startup centers. 10:00 am – When we arrived here it was extremely cold, and being in a valley, seemed to create a wind tunnel. 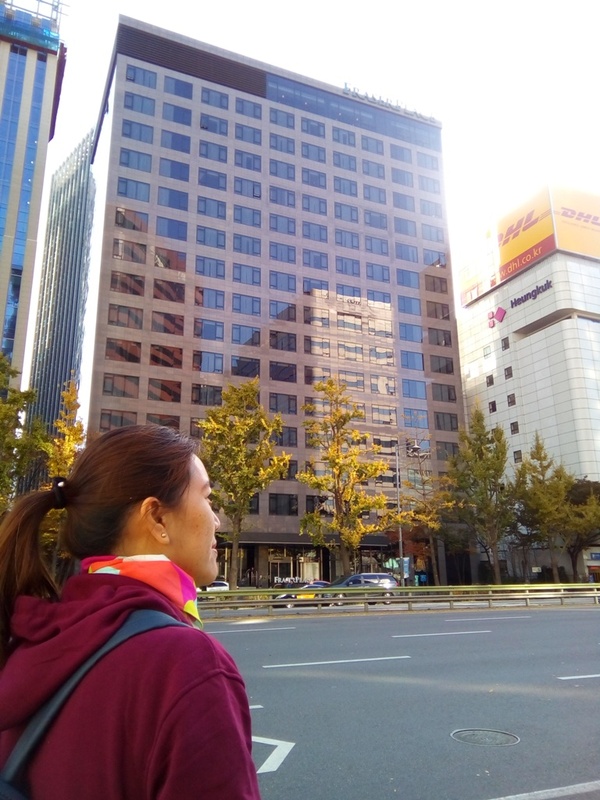 When we turned towards a corner of a building, the freezing wind would make everyone stop. 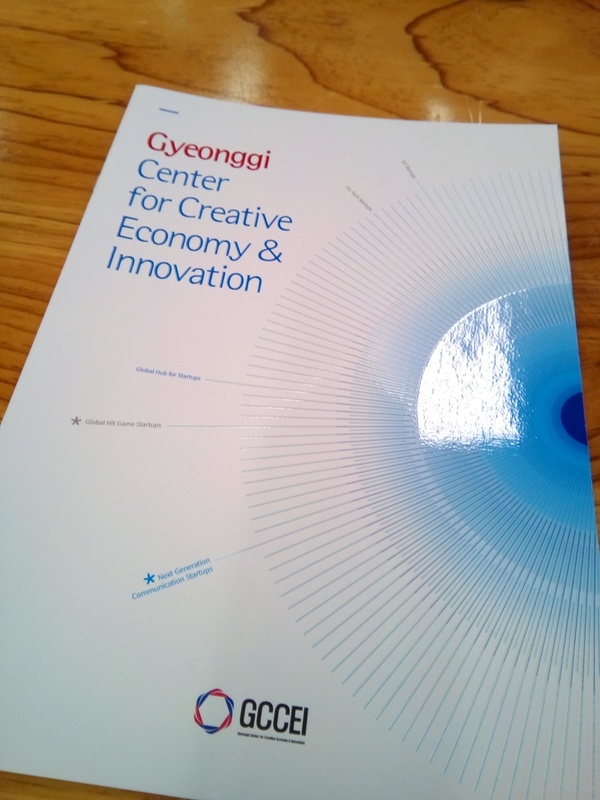 At the Gyeonggi Center for Creative Economy & Innovation, outside the buildings looked like typical office buildings, simple architecture and all gray with glass. Inside though, it looked like modern creative offices such as Google. 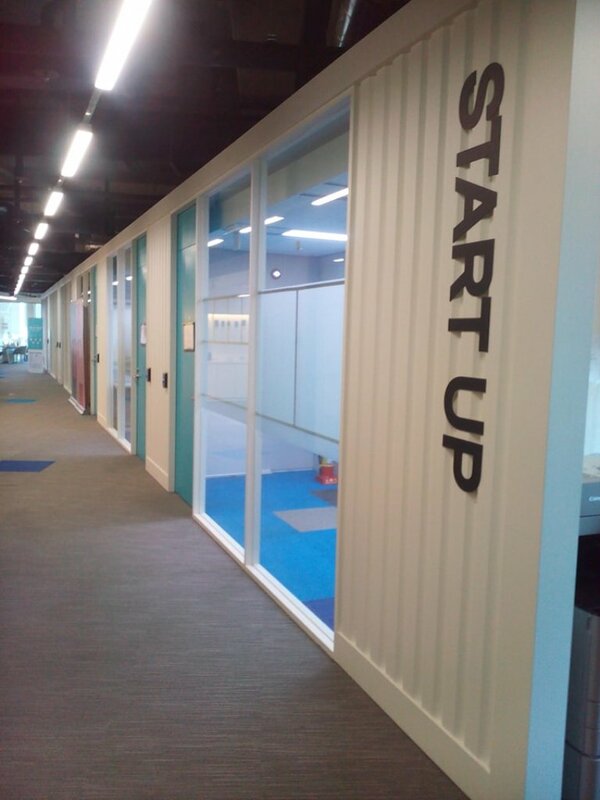 They had Cargo containers converted into modular offices, colorful floors and furniture. 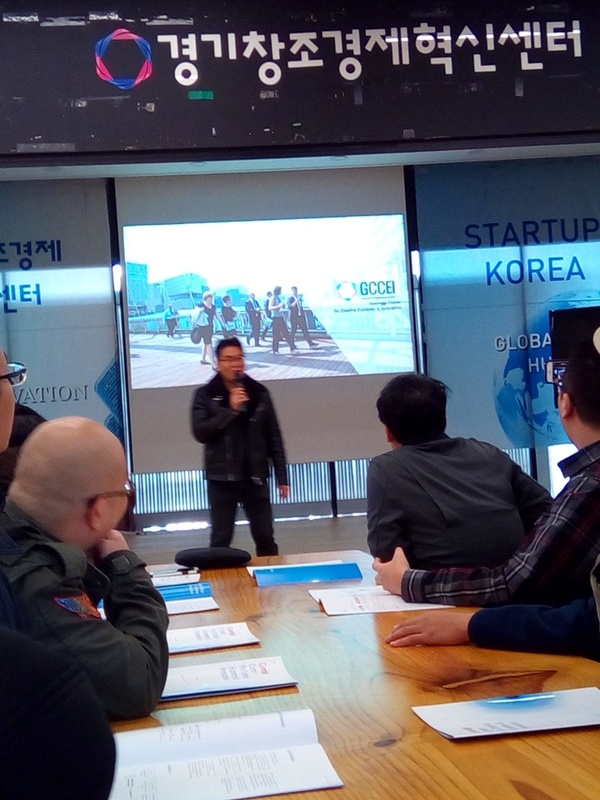 A fellow who called himself David (He said his name is hard to pronounce by foreigners) did the presentation about South Korea. 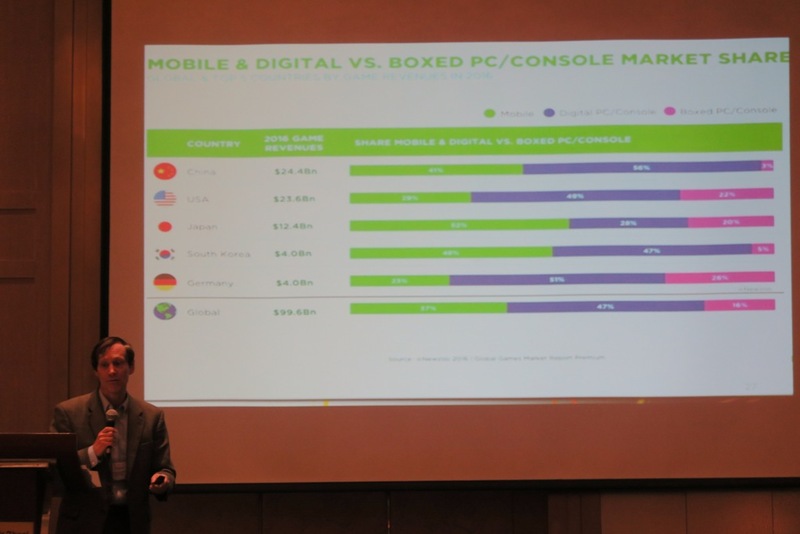 Samsung is now the 2nd top-selling device when it comes to mobile phones and appliances. 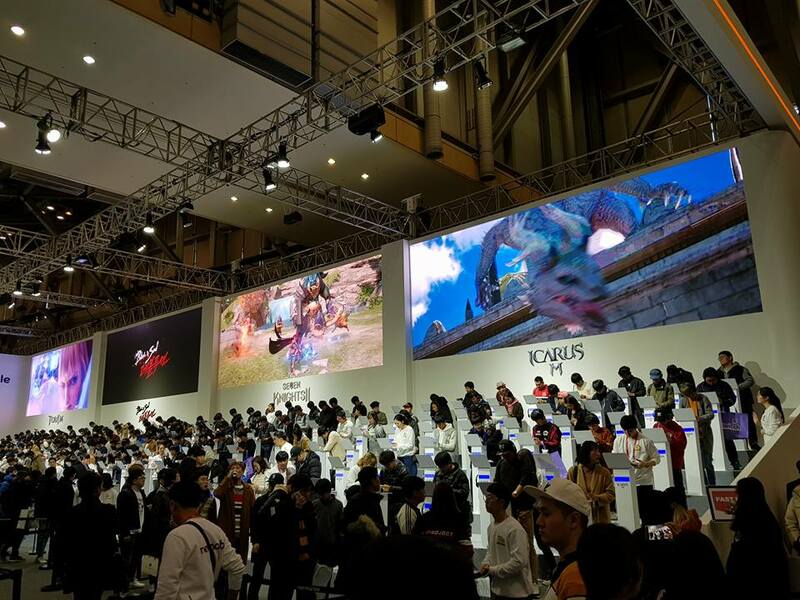 It has surpassed both Nokia and Sony. 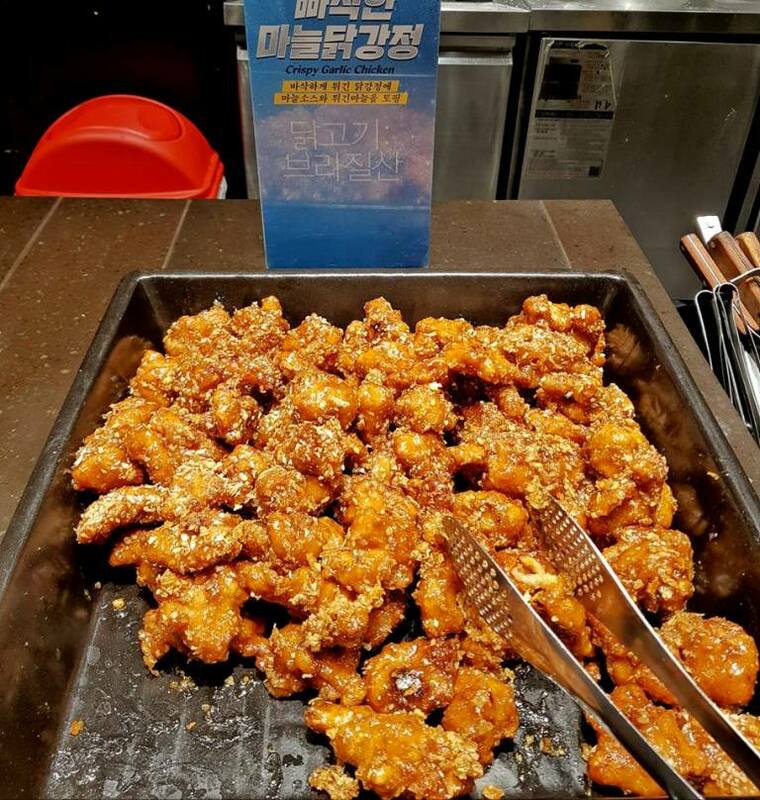 There are more Fried Chicken restaurants (36,000 as of 2014) in South Korea than there are McDonald’s (35,429 as of 2014) around the world. The government supports the people who want to start-up a company, and most unemployed people suggest a fried chicken restaurant. 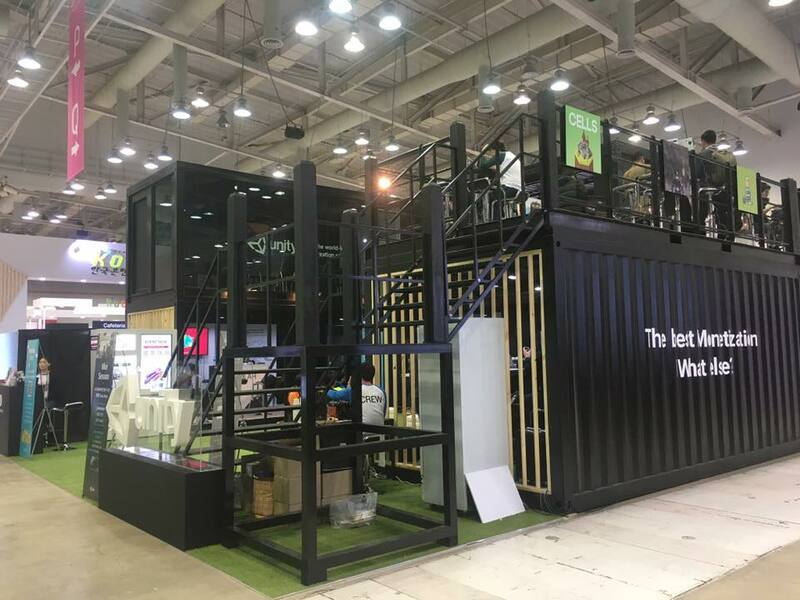 An example was someone wanted to start a wine shop, but the government has a law that they won’t fund a startup that has alcohol as their main product. So the person made his shop, Chicken, and Wine. 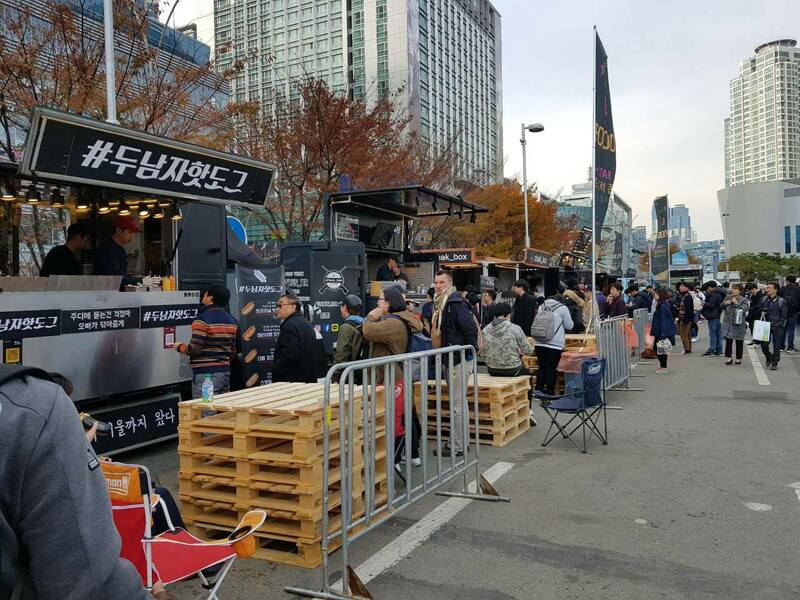 In fact, the Korean government knows that unemployment is on the rise when there are more chicken restaurants this year than the prior year. 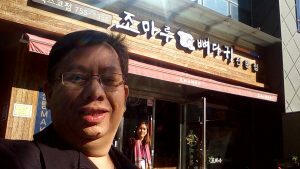 We asked them which was the most popular chicken restaurant, they said it was Kyo Chon, which is also available in the Philippines. We did not get to try it though because most of the shops had Korean text so it would be hard to find. 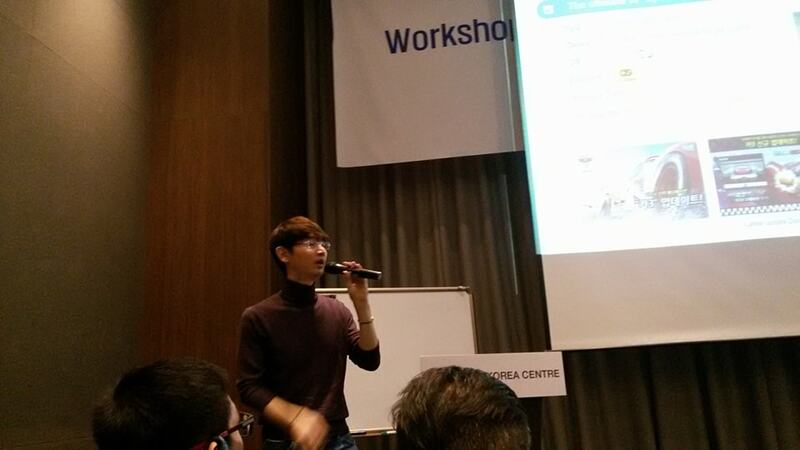 David also talked about the Korean Startup Landscape. 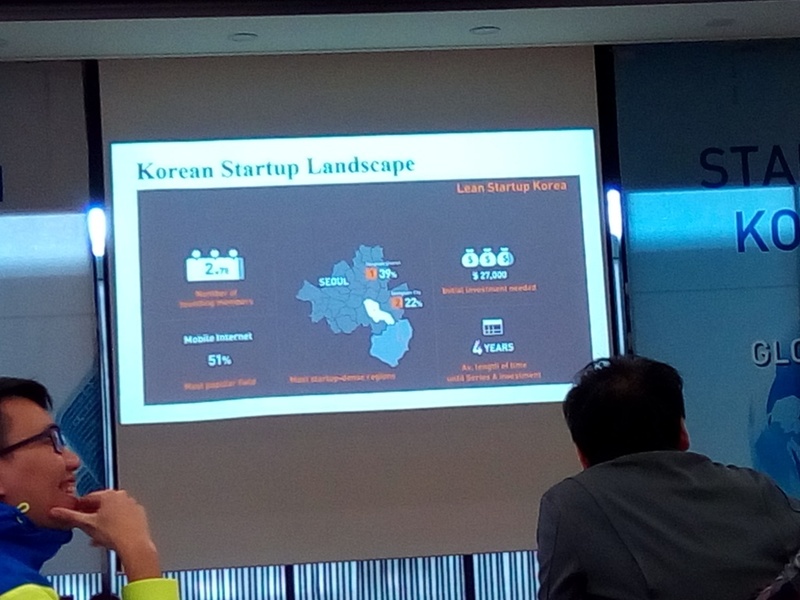 There are a number of IT-related startup companies in the Pan-kyo valley. 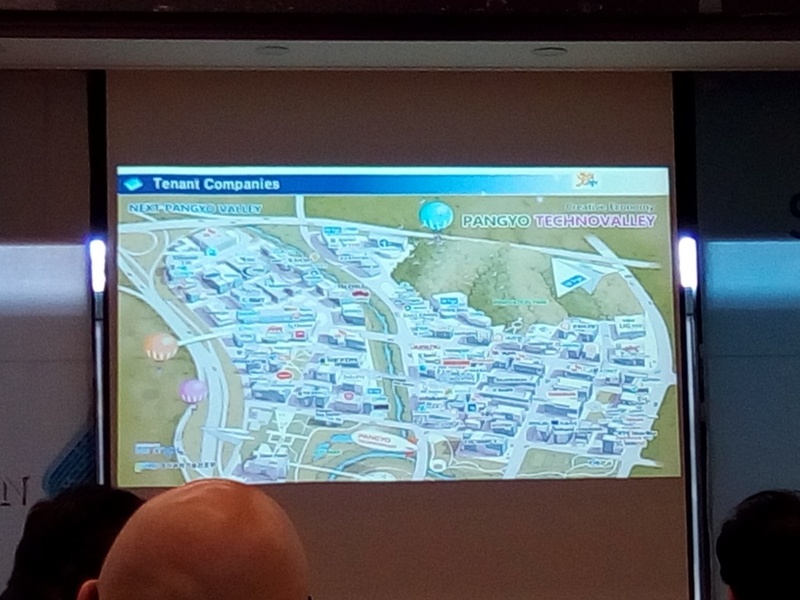 Below is the whole area of the techno-valley which is similar to the techno hub that was built in Sta. Rosa, Laguna here in the Philippines. 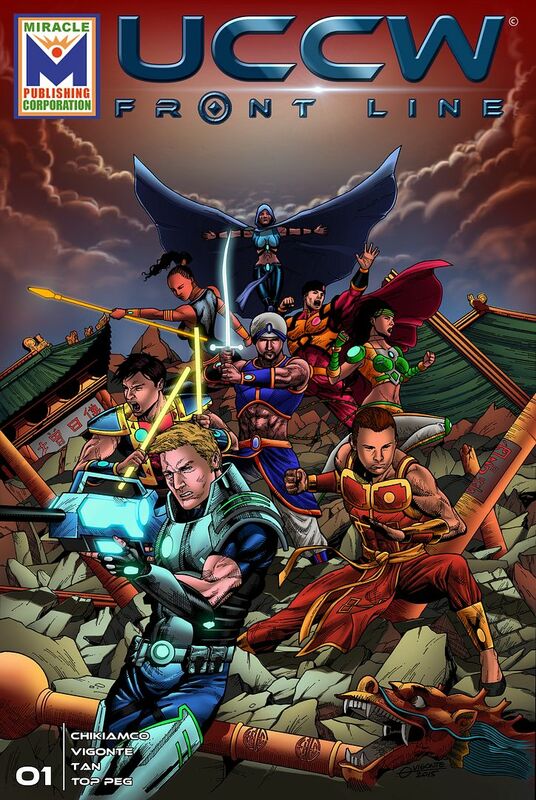 This one though is much larger. Below is the map, and we are in just one building. 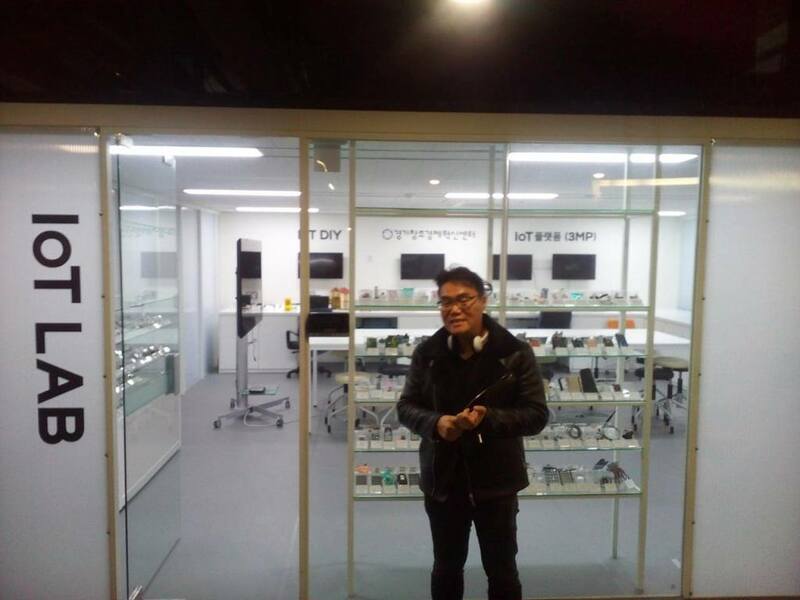 He next gave us a tour of the startup offices and research labs. We went up to the 7th floor via elevator. 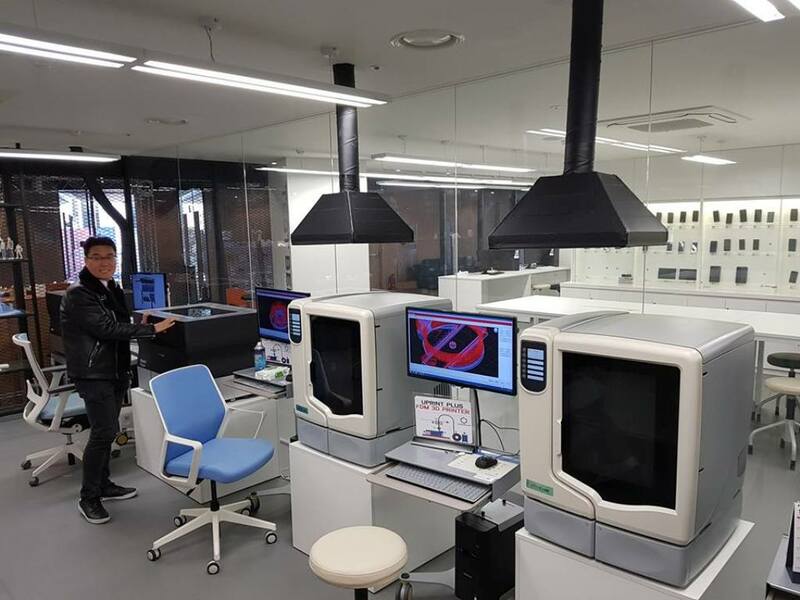 He even showed how advance the security system is here, with retina scanner to open doors. 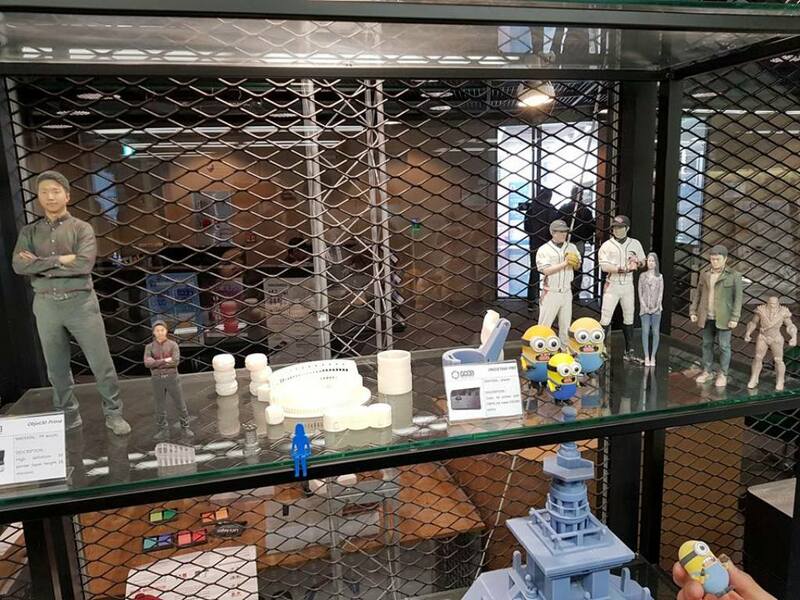 They showed a 3D Lab where they print different prototype items and figures, a Mobile Lab where they test different kinds of mobile devices. 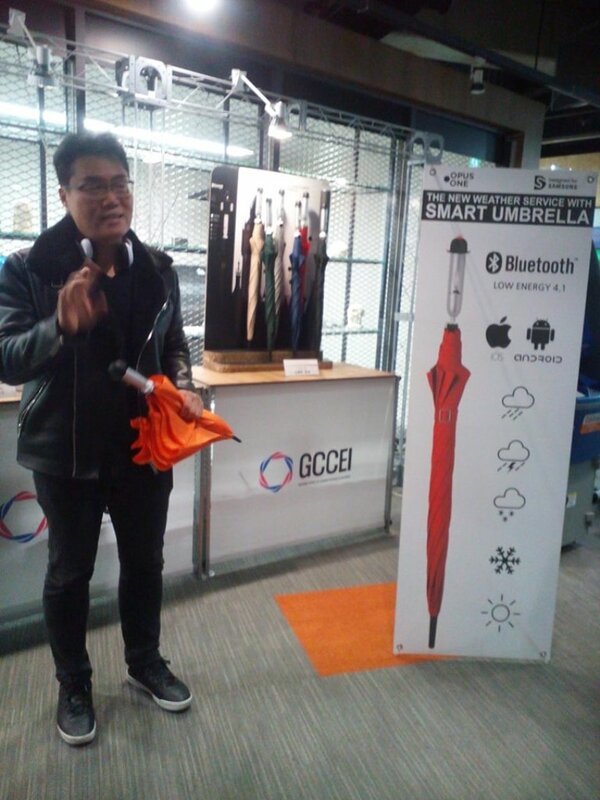 And they showed us different devices that they came up with like the Smart Umbrella. This umbrella has a built-in barometer so it can communicate with your mobile phone to show how the weather will be, including temperature, humidity and wind velocity. 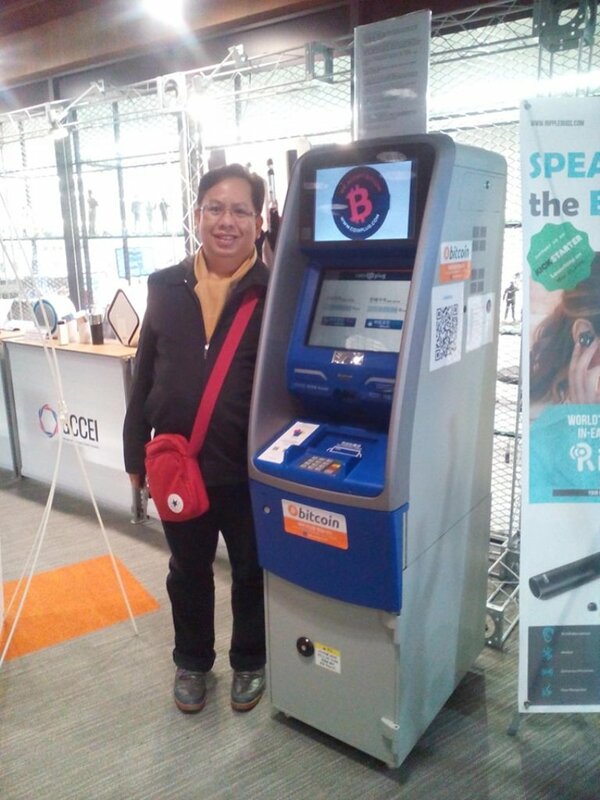 There was a bitcoin atm machine, as they are one of the countries that have accepted bitcoin as a currency. 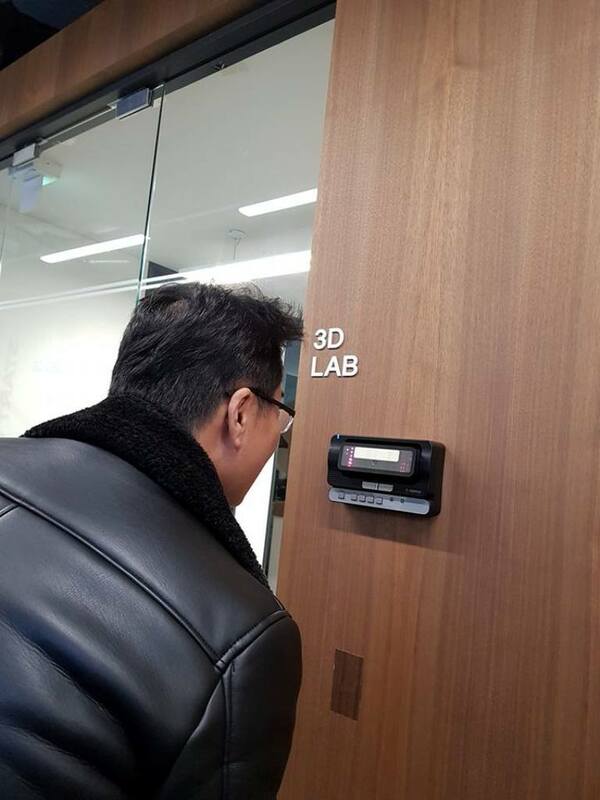 They also showed us where they develop and test Virtual Reality apps and games. Joemar, Alstaire, John, Sofia and Hannah. Going down they made us take the stairs. 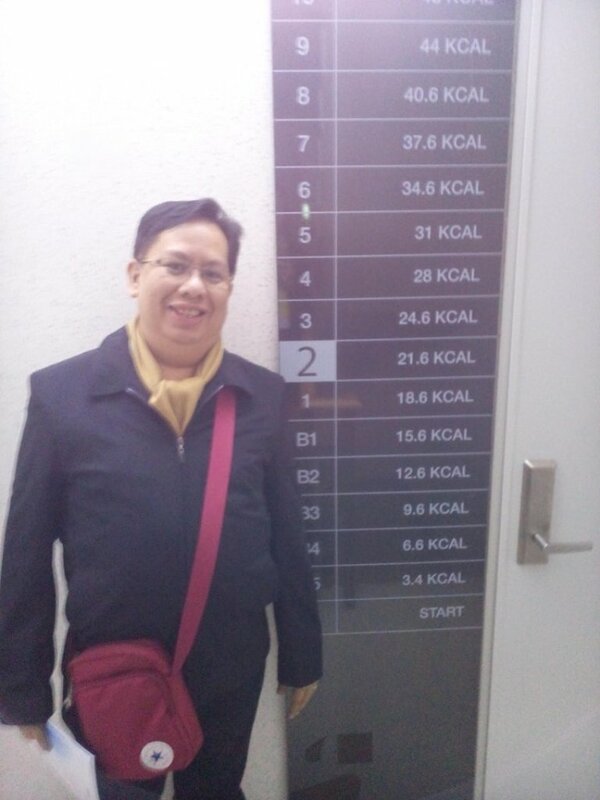 It was cool that the calories that you burn are shown on the stairwell. 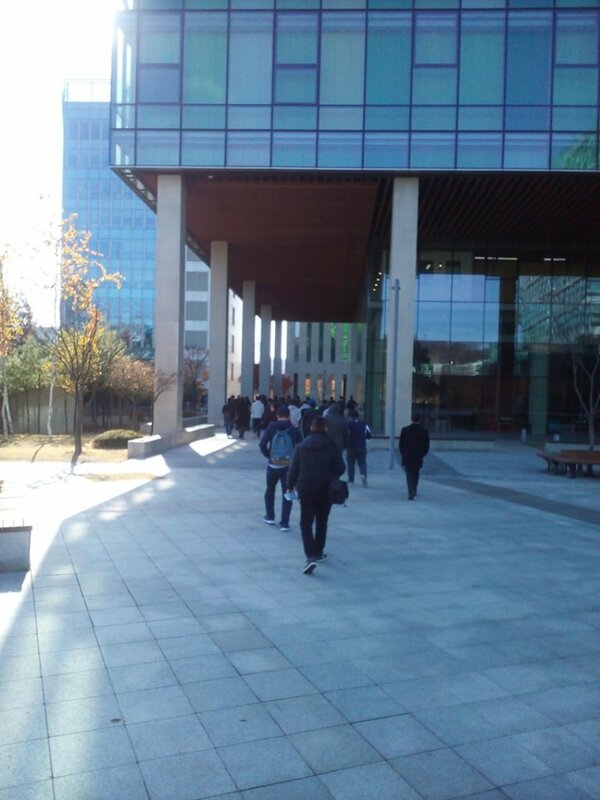 He then showed us the other buildings that included an animation and game studio. The buildings all looked alike and there were no signs. It was really freezing but he invited us to a bridge that crosses a creek in the valley. 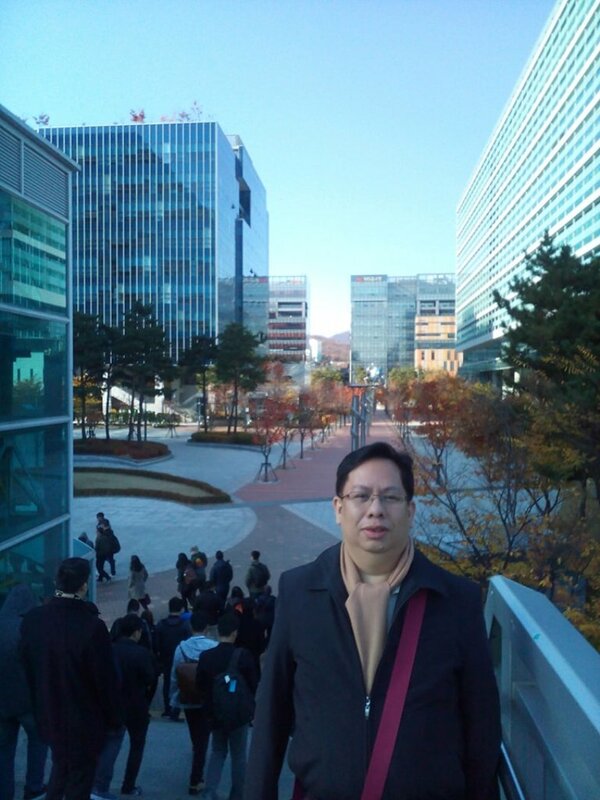 All the delegates were not comfortable with the cold weather but we were able to take a few snapshots. 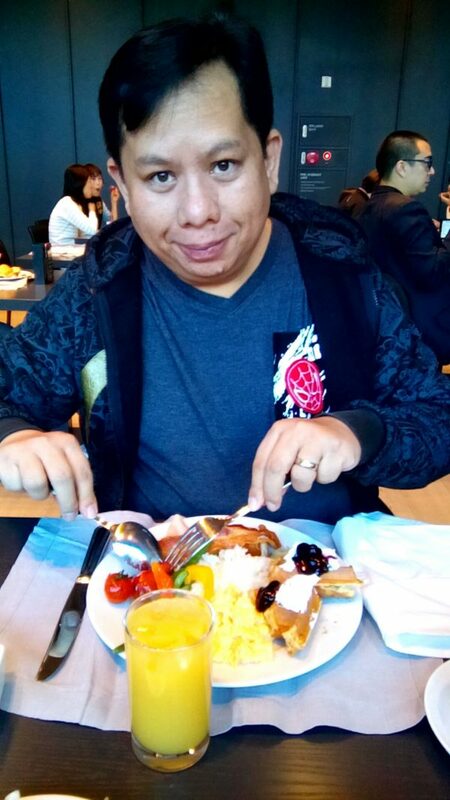 12:30 pm – After this, we took the AKC bus to a mall for lunch, it was a buffet lunch but it was small compared to the buffet restaurants in the Philippines. It was mostly Korean dishes but it was cozy. 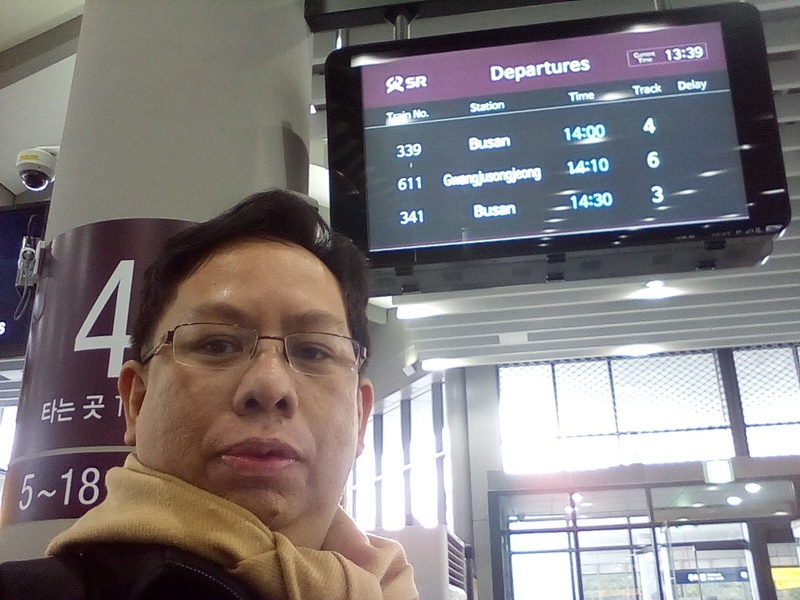 We only had 45 minutes for lunch because the train that we would take to Busan had a 2:00 pm schedule, if you miss it, it would take another hour to wait. 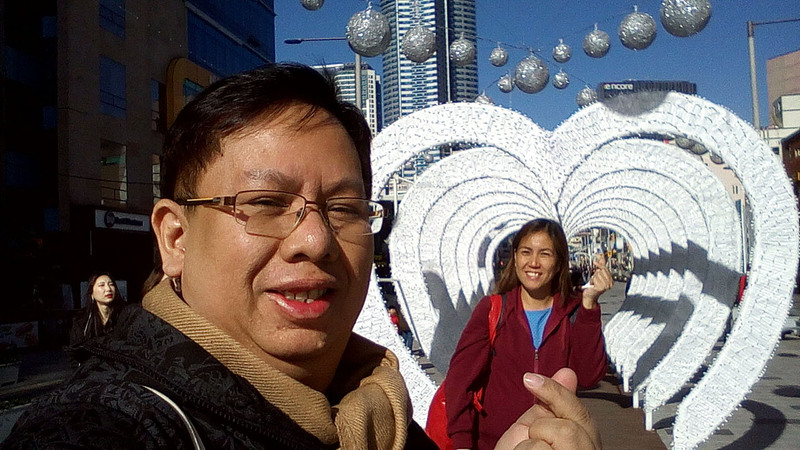 1:30 pm – The bus then took us to the train station which is a 10-minute drive from the mall. 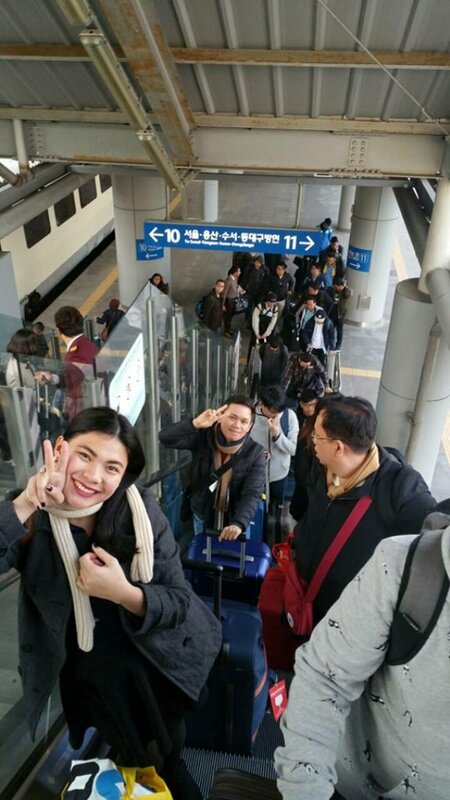 At the train station, everyone recognized the place at it was featured in the movie – ‘Train to Busan’. 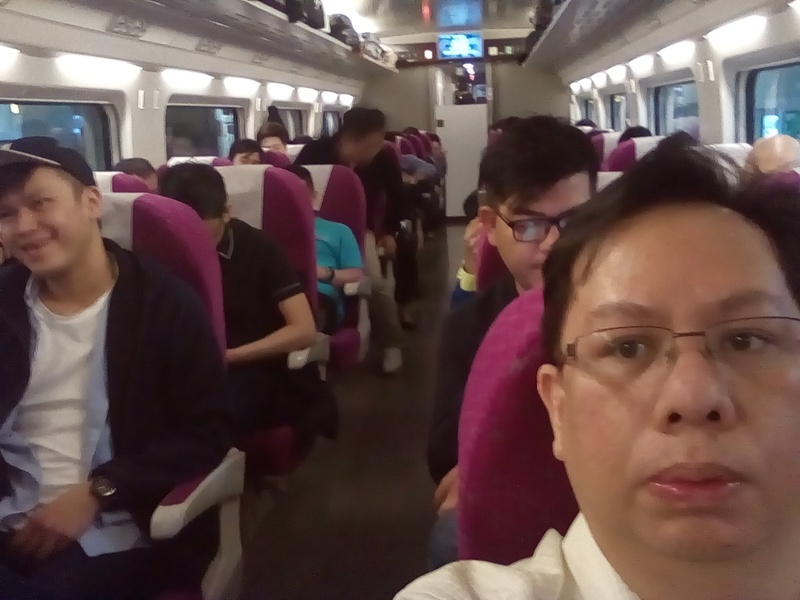 Everyone had selfies at the station, at the train and also near the tracks. This is me checking if there are zombies at the back. 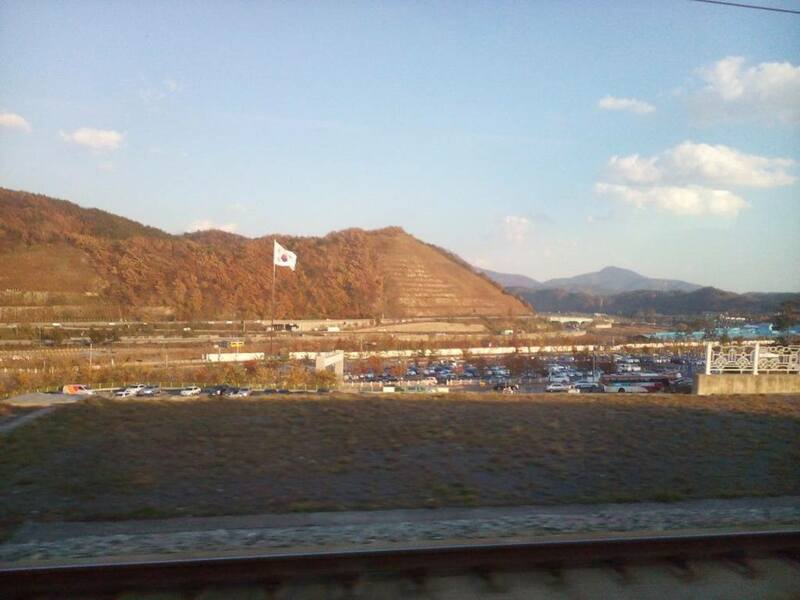 It took about 2.5 hours by train passing through the provinces. 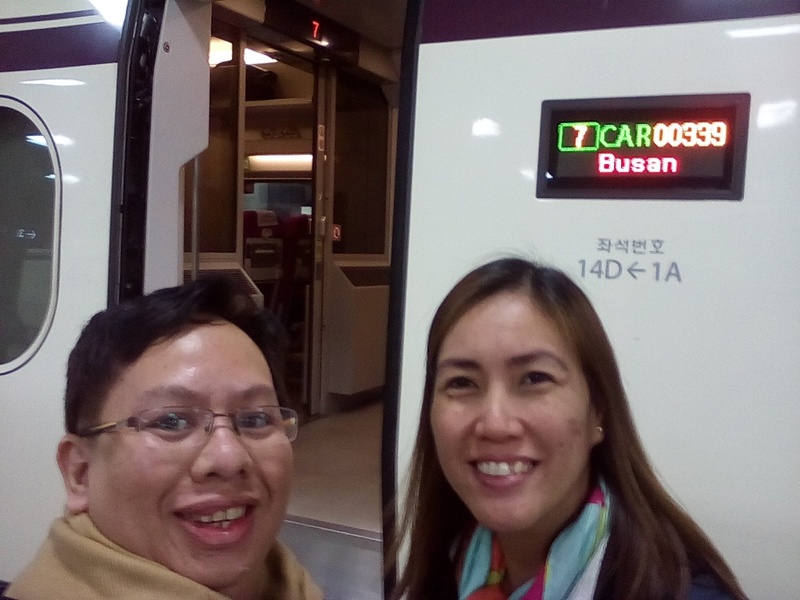 4:30 pm – we arrived at the Busan Train Station; there were 2 buses again provided by the AKC waiting for us at the station. 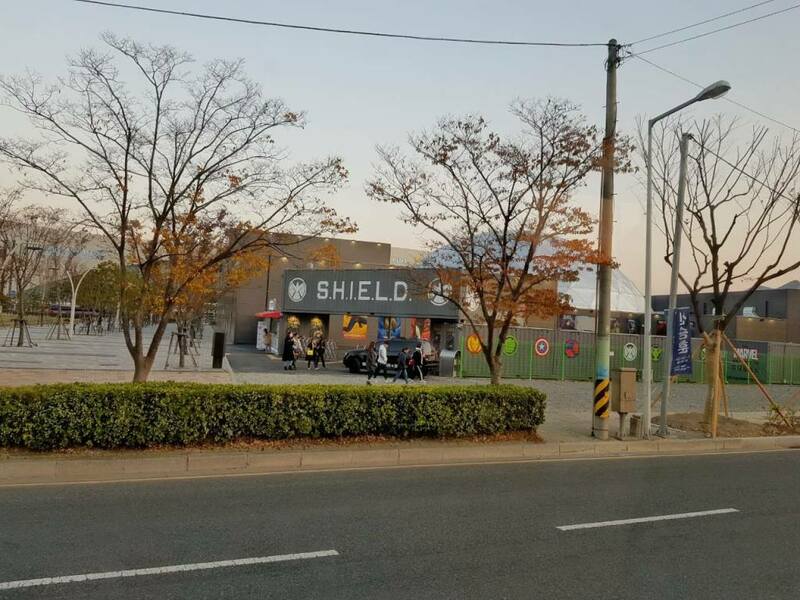 There was a Marvel Shield Theme Park beside the train station in Busan. 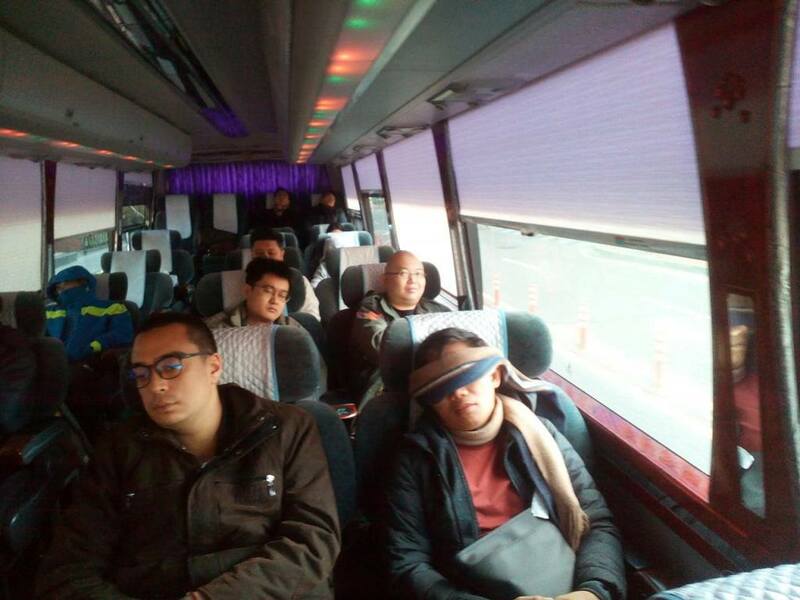 Everyone was asleep on the bus, tired from the train ride. 5:30 pm– It was a bit traffic, so we arrived 30 minutes later than our schedule. 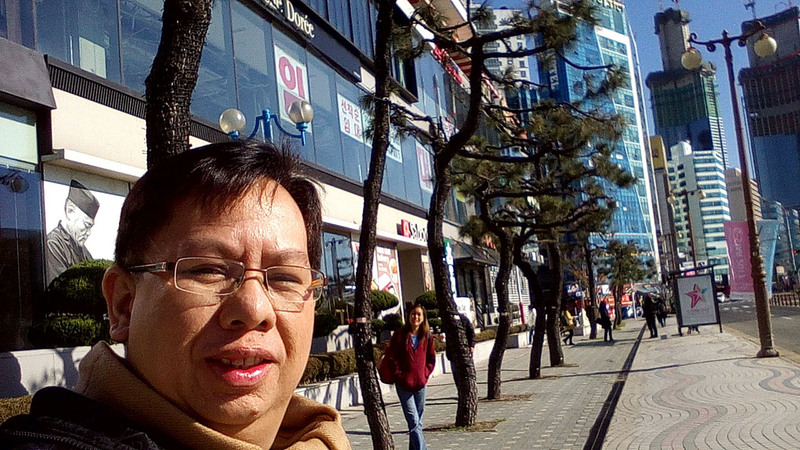 Busan was less cold than Seoul at 10 degrees Celsius but still cold, it was like San Francisco – a bay area. 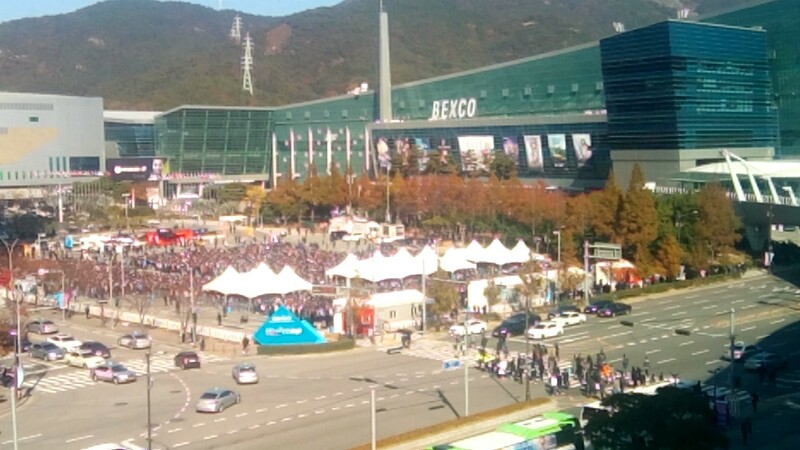 We took another bus to the Busan Exhibition & Convention Center or BEXCO, for the ingress. 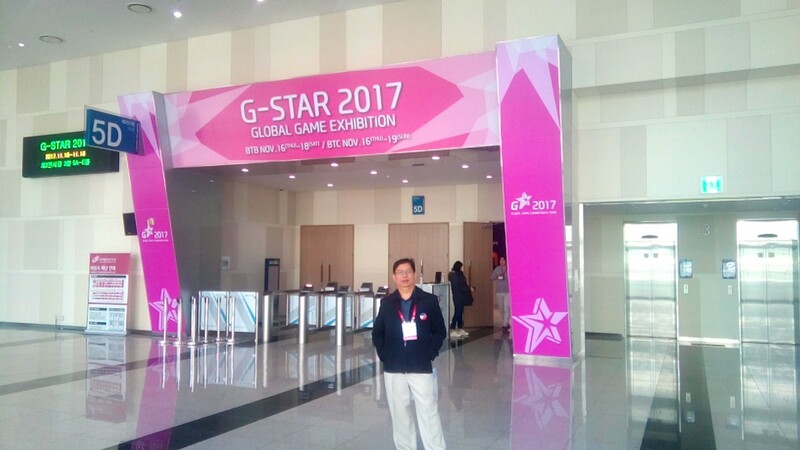 When we got there we first saw the ASEAN Pavillion and then everyone started to prepare their booths for day one of G-Star 2017. Here we met Josh (in orange jacket), the other representative of Synergy 88. 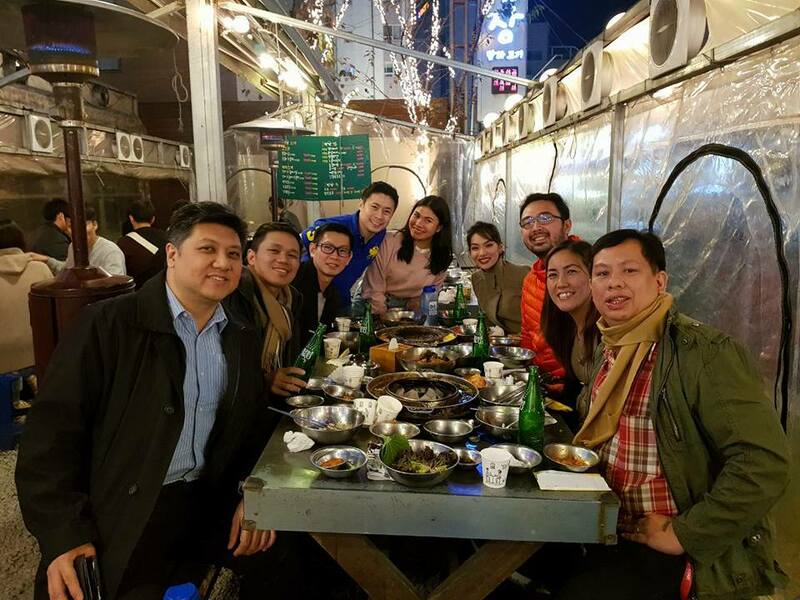 He took a flight straight to Busan because of prior engagements. 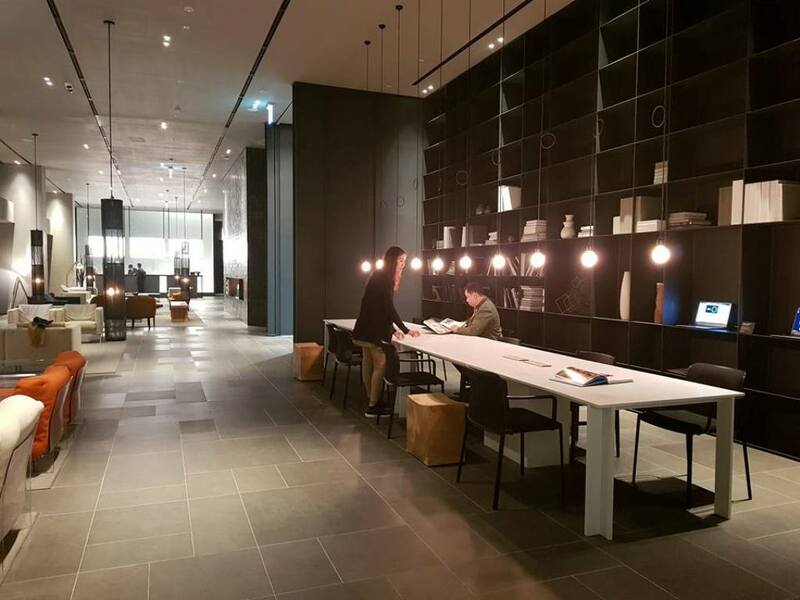 6:30 pm – We then took the bus to our hotel – Shilla Stay. 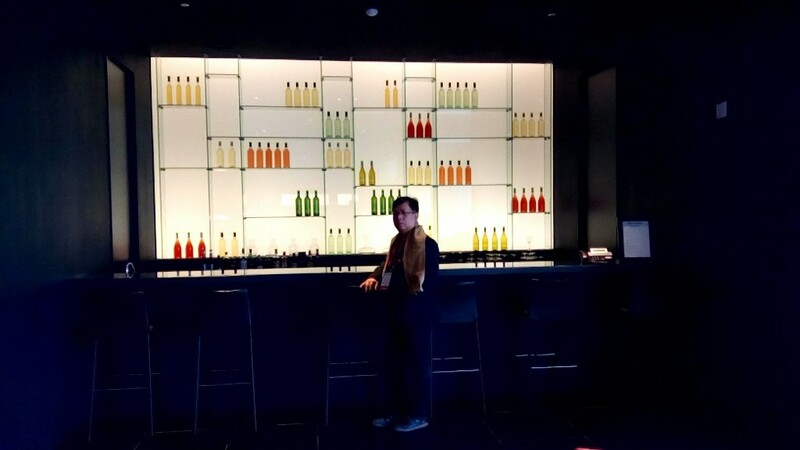 It was a smaller hotel but had good architecture and interior design. 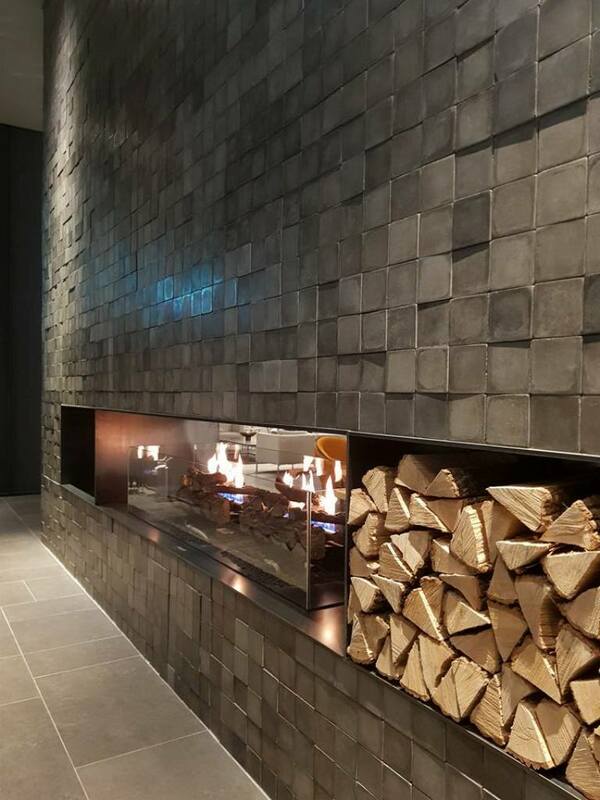 There was faux fireplace, since the wood was just for display and the fire came out of a gas burner. 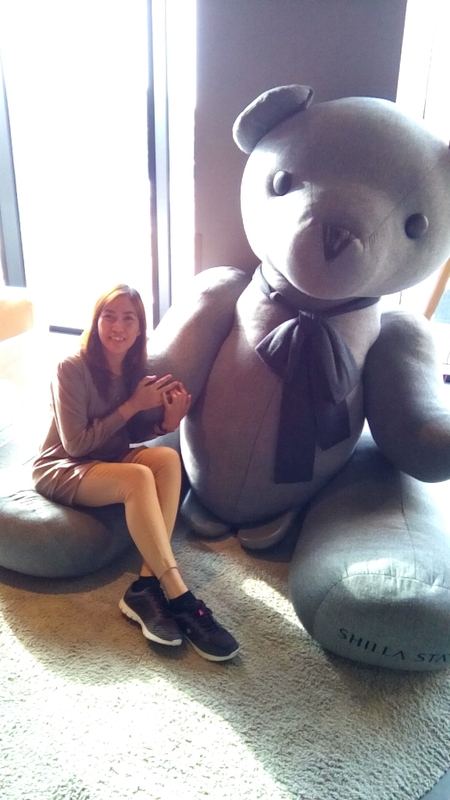 A faux bar, with no liquor, a giant teddy bear and a business area with a long table with books about design and architecture. 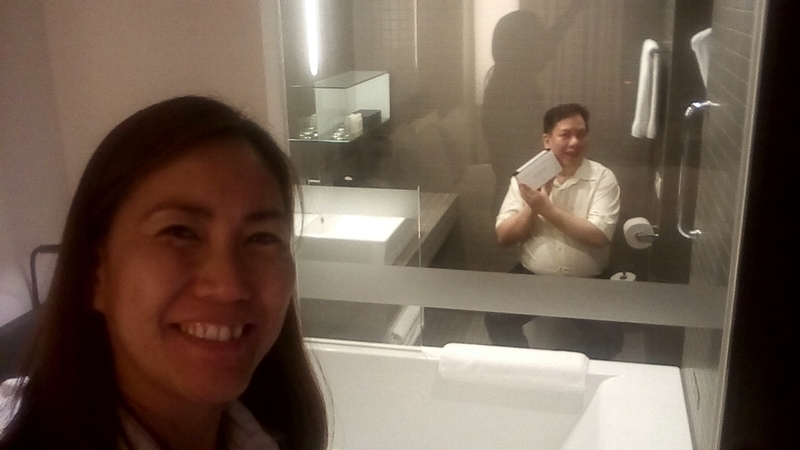 Our room was simple but had moving dividers that expose a glass window to the bathroom. 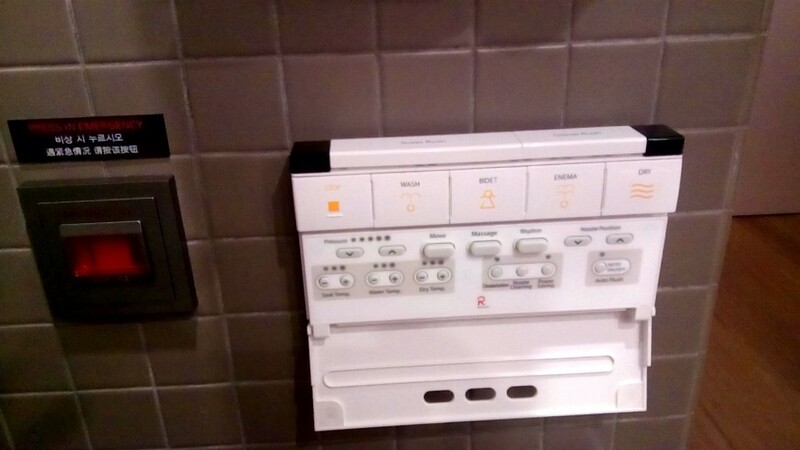 It also had an advance remote control for the toilet. This time I took pictures. What was funny was that there was an emergency button beside the remote, maybe when you run out of batteries. 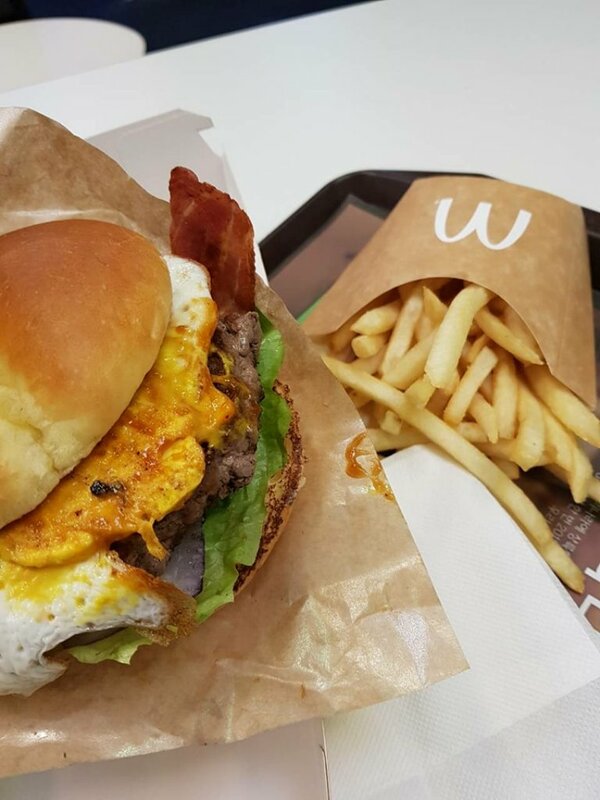 8:30 pm– We took a late dinner at a McDonalds close to the hotel with John Naranjo of Ingenuity. 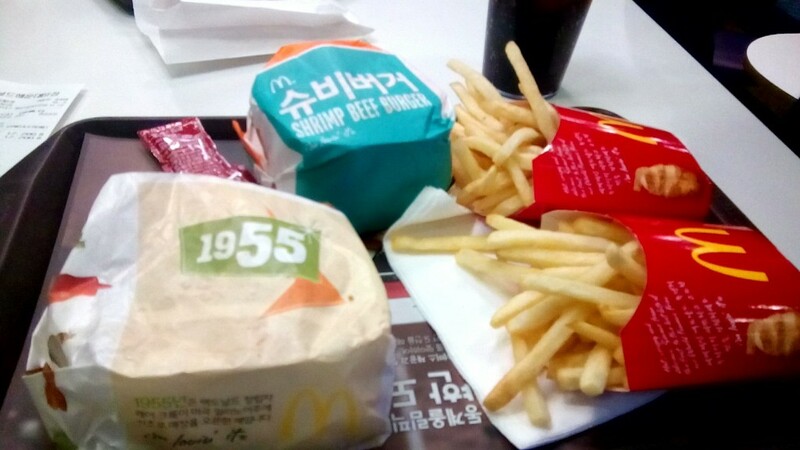 The burgers were different; I got a 1955 burger, Edith got a Beef and Shrimp Burger and John got a Grilled BBQ burger. There was no small size only big, and it cost about P300 for each meal. 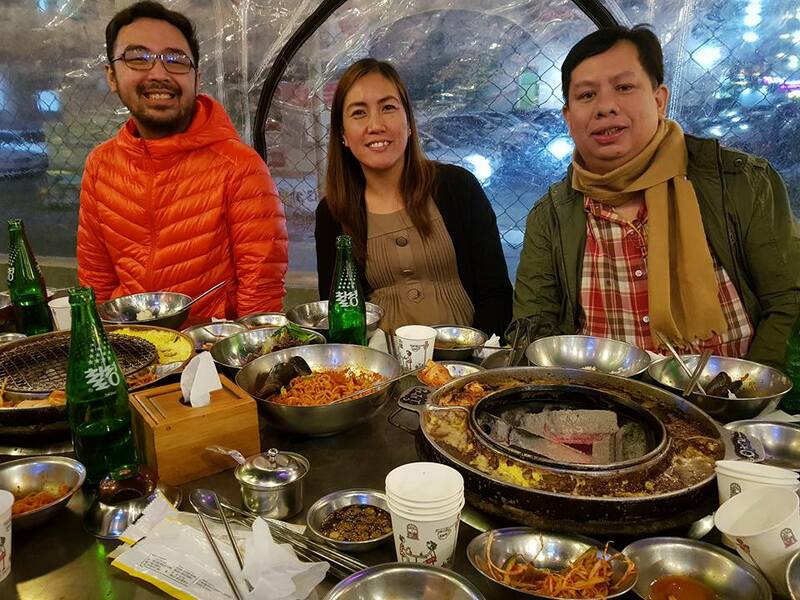 We also needed to clean up after eating which we almost did not do until we saw the cashier’s eye widened in disbelief with our ‘uncivilized’ behavior of not cleaning up the trash after eating. We immediately noticed her reaction and cleaned up after. After this, we went back to the hotel to get ready for the next day. 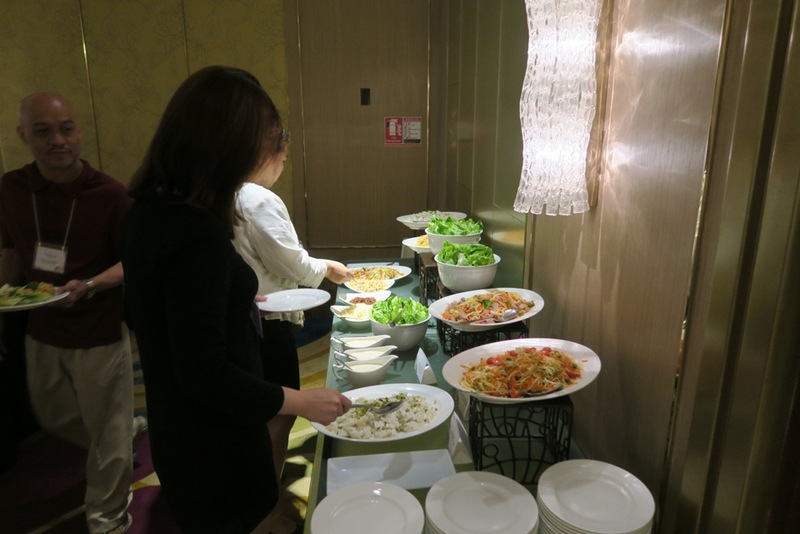 I tried the breakfast buffet at Shilla Stay Hotel, and it was the typical breakfast buffet Korean style. There was an egg station, bread station, ramen station, bacon and cold cuts, and roasted veggies, plus coffee, juices, and tea. 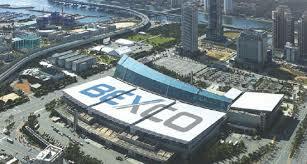 We took the shuttle bus from the hotel to BEXCO at 9:20 am. 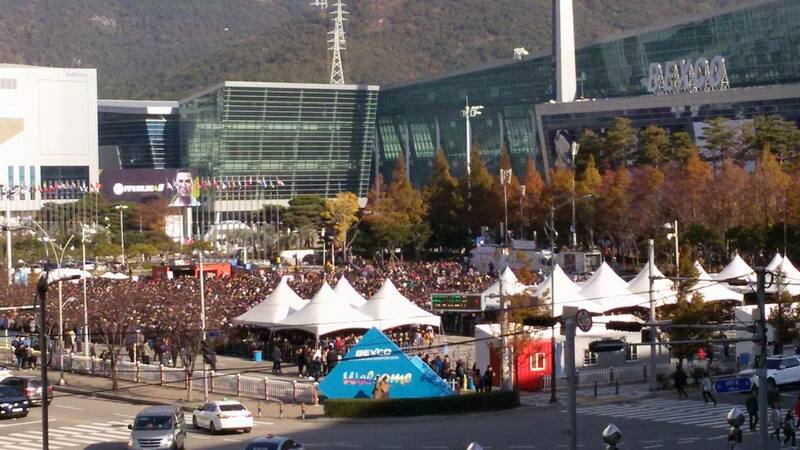 When we arrived there we saw the huge line forming outside. 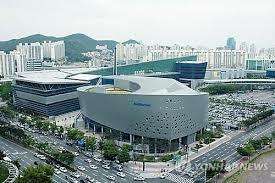 The business meeting is held at a different building from the exhibition hall for the public. 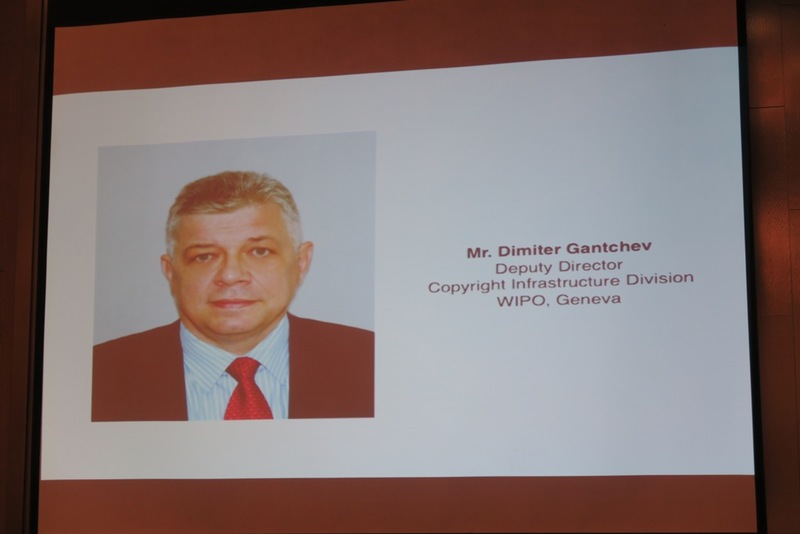 The general public is not allowed to enter the business meeting area. 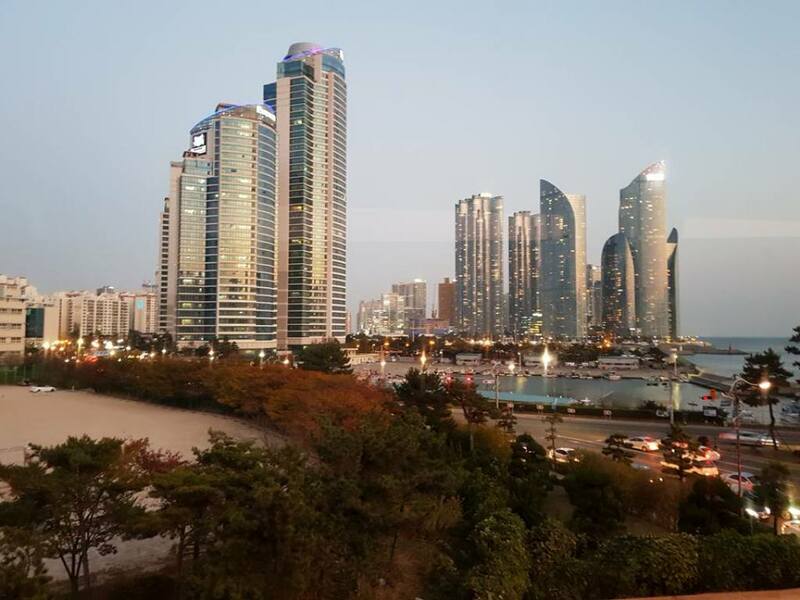 The picture below was taken from the third floor of the business meeting building. 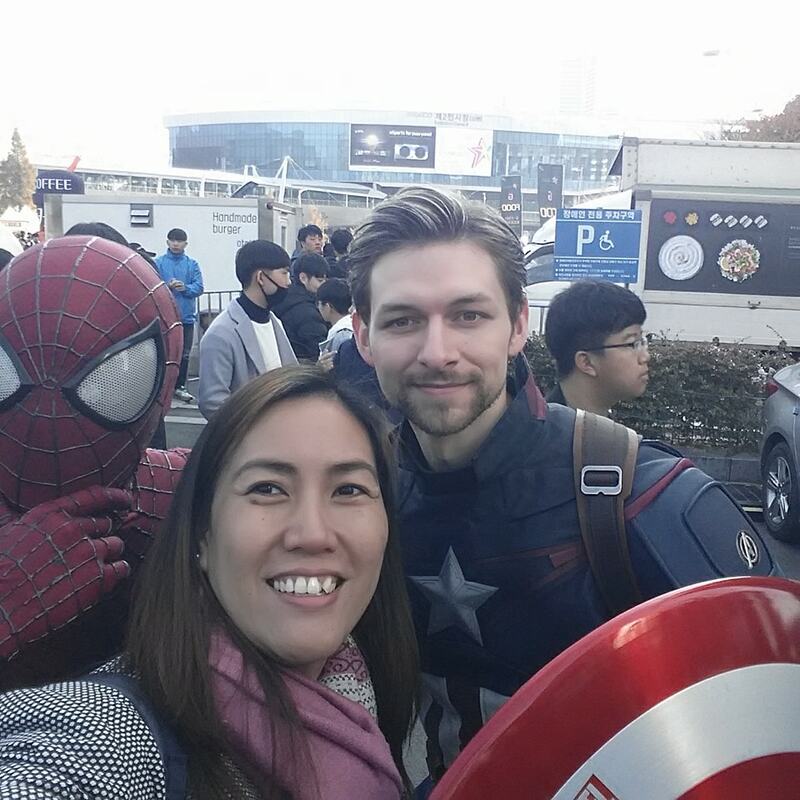 We noticed that there were no cosplayers, unlike in Manila where most of the attendees were in full costumes. Inside we started to prepare our booths. 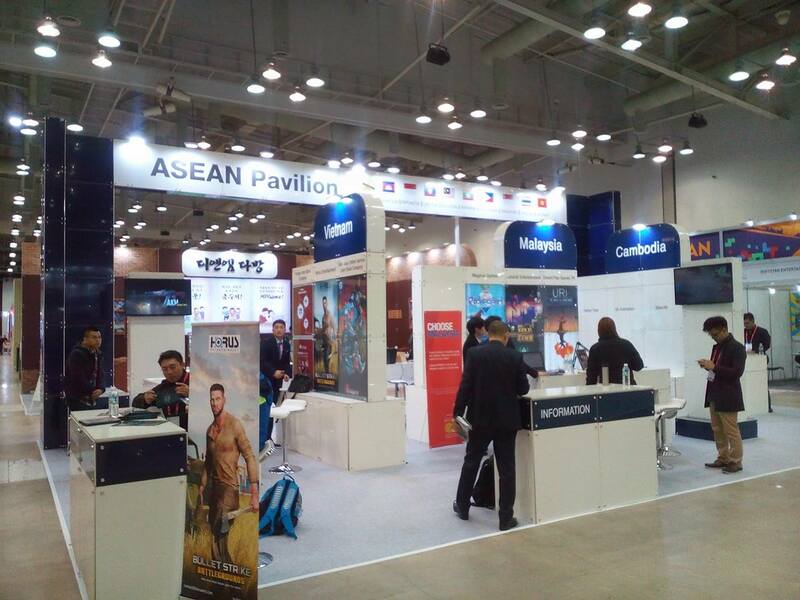 The other delegates too were busy attending to their booths. 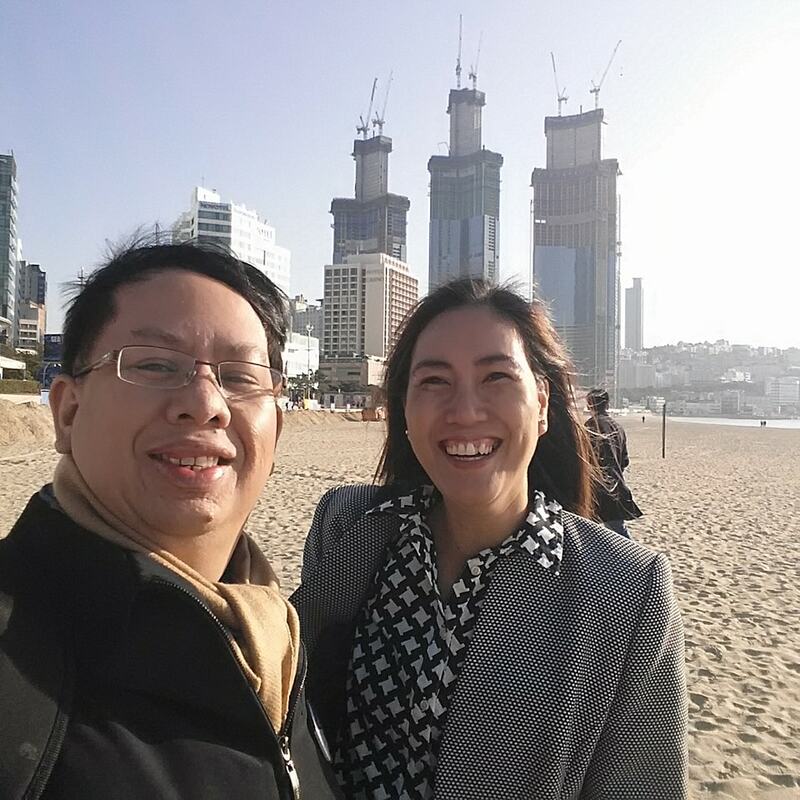 We finally met Mr. Emmanuel W. Ang (Emman for short), Commercial Counselor of the DTI-PTIC Seoul. He was happy we were there but he was disappointed that Hajee of Audacity couldn’t make it. He said it would be an issue with the AKC since they have fully paid for the flight and accommodations. 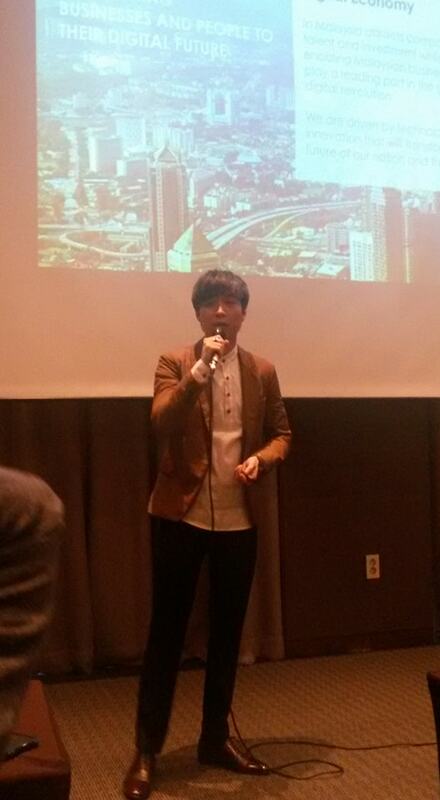 He said that this will be brought up at a post-meeting for G-Star. 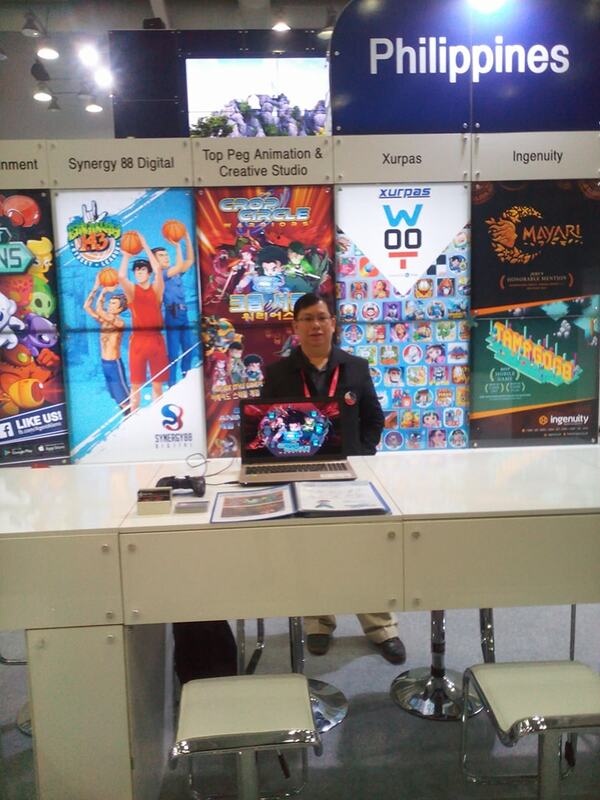 We were also surprised to see Mr. Joebert Yu, organizer of the E-Sports and Gaming Summit (ESGS) in Manila. 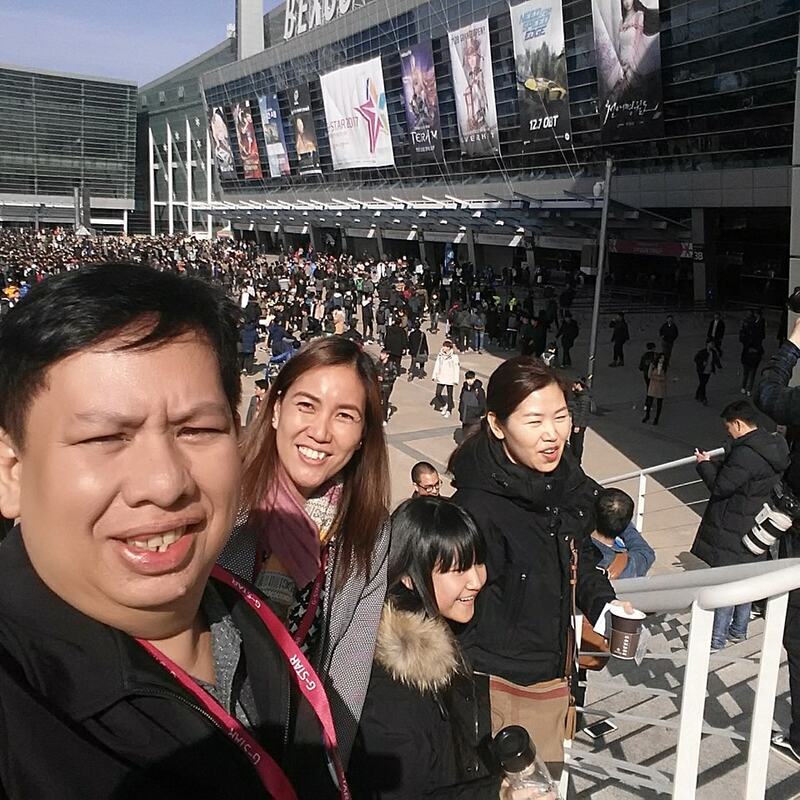 He was looking for potential exhibitors for next years ESGS. 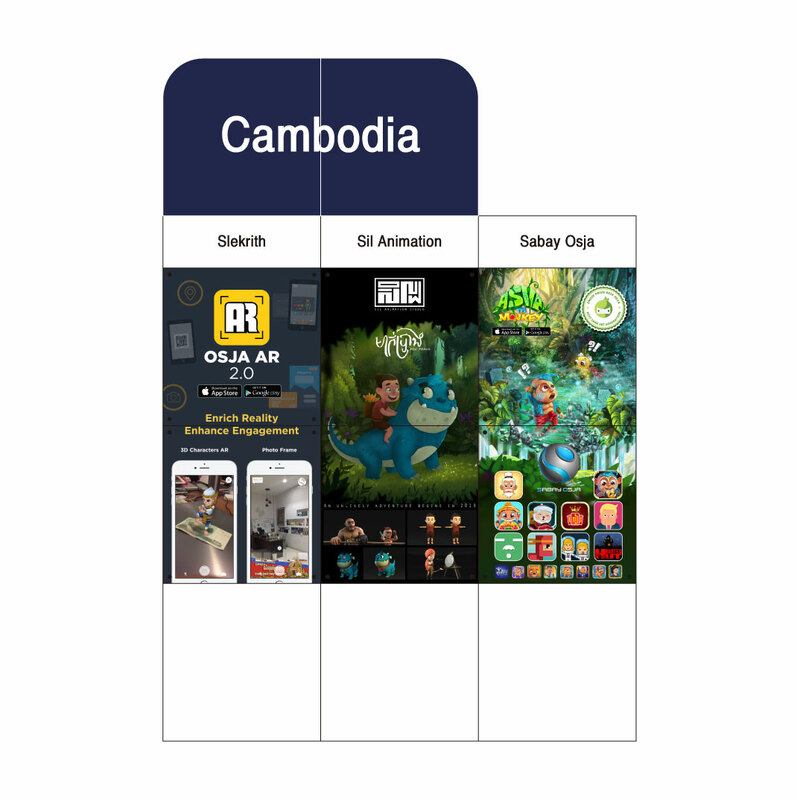 When the doors finally opened we were greeted by different companies for publishing, mobile game stores, customer support, advertising, etc. We then started our business meetings. 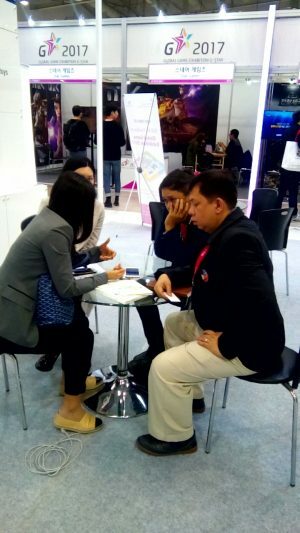 We met with those that we scheduled at their website, and also some who were walk-in from other companies. 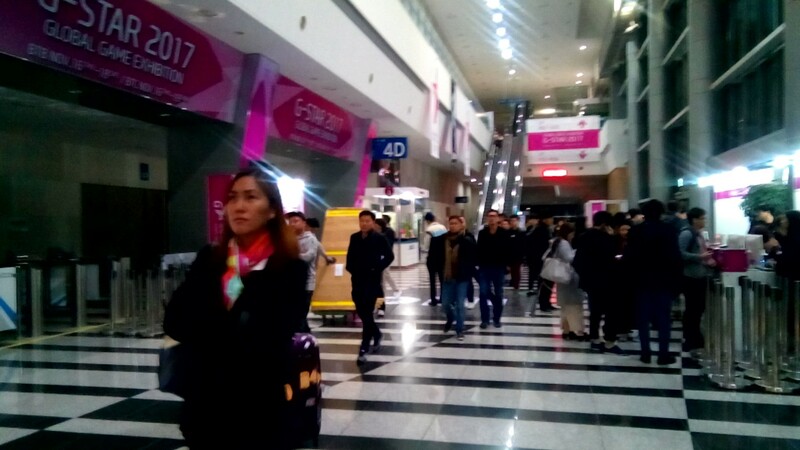 Since this was the first day, we didn’t get to go around the exhibition hall that much. 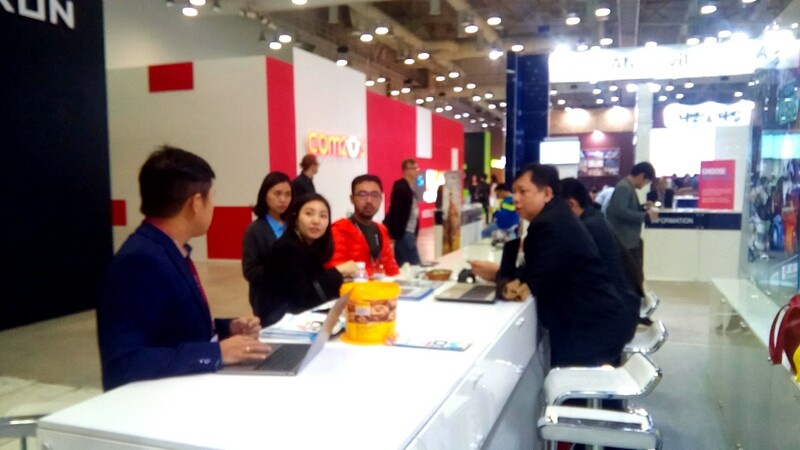 We agreed that we would take lunch at intervals so there would always be representatives at the Philippine booth. Edith and I went to lunch at around 1:00 pm. 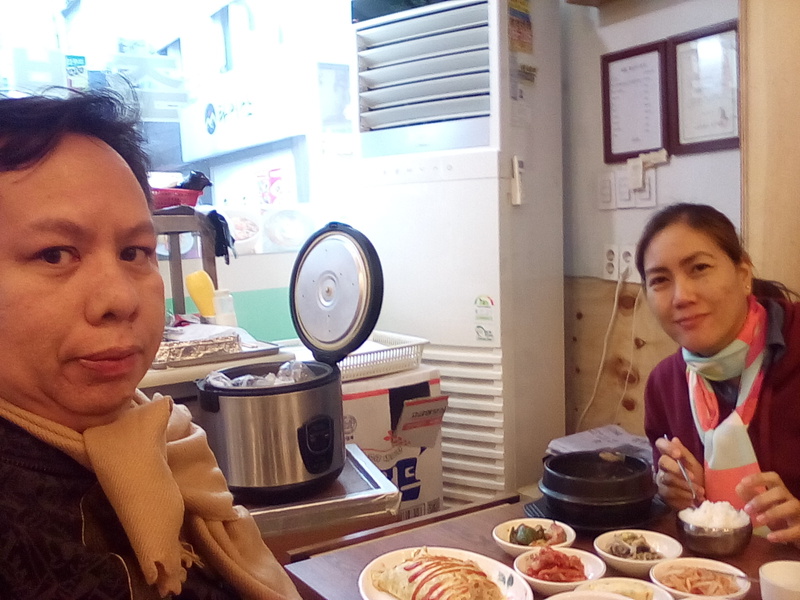 We looked at and entered a nearby restaurant where a number of people were eating. 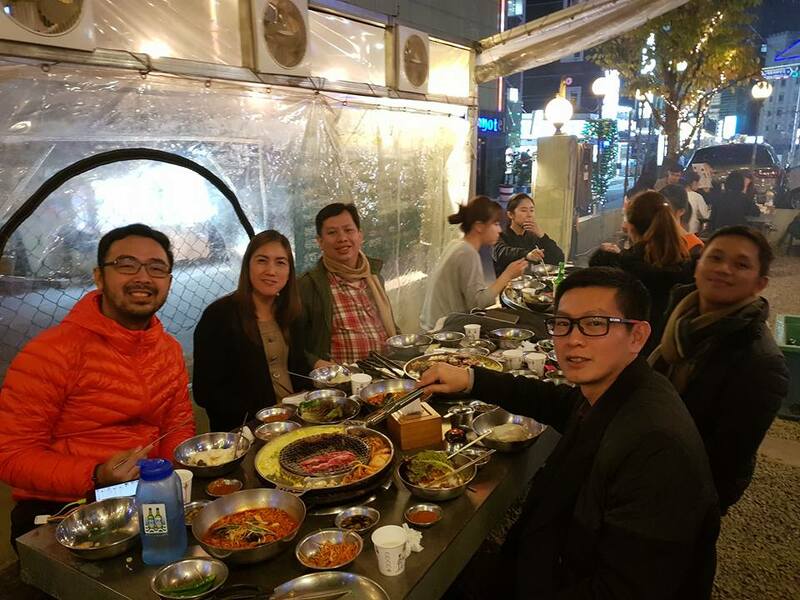 We saw that the people there were eating a hot pot of pork ribs and veggies, unfortunately, the menu was in Korean. We saw a picture with small, medium and large sizes. Thinking that the people eating there ordered the small size, we thought of ordering a medium then splitting it between ourselves. 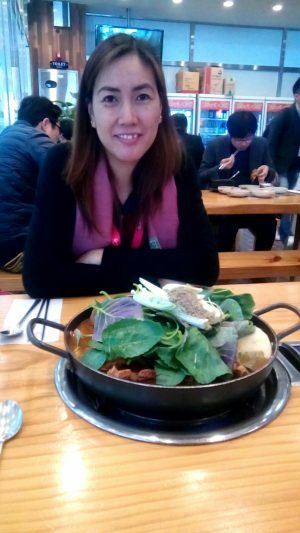 When our food arrived, we were surprised at the size of the hot pot. We ordered the group meal instead of the solo meal. It had 7 slabs of pork ribs and lots of veggies. We messaged the other delegates and told them our problem, that we mistakenly ordered and we could not finish it alone. But they already have eaten their lunch, so we just ate what we could. 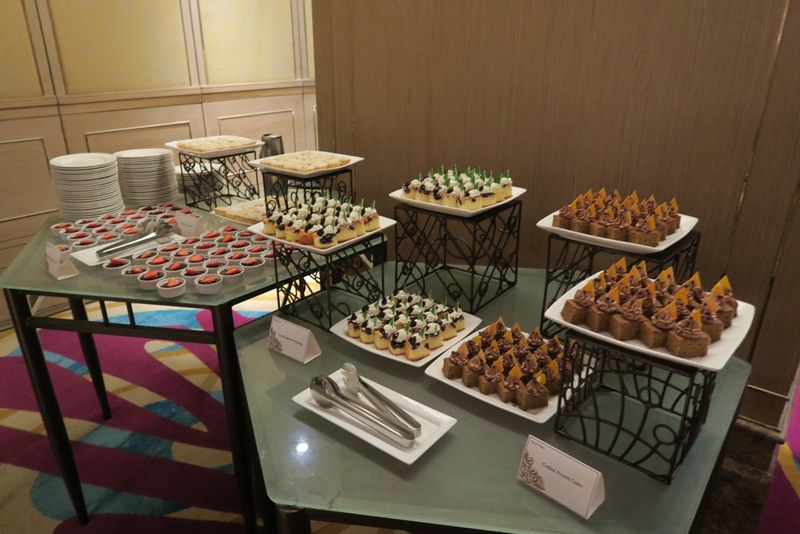 The medium size meal cost around P1,400 instead of the P380 for the solo meal. 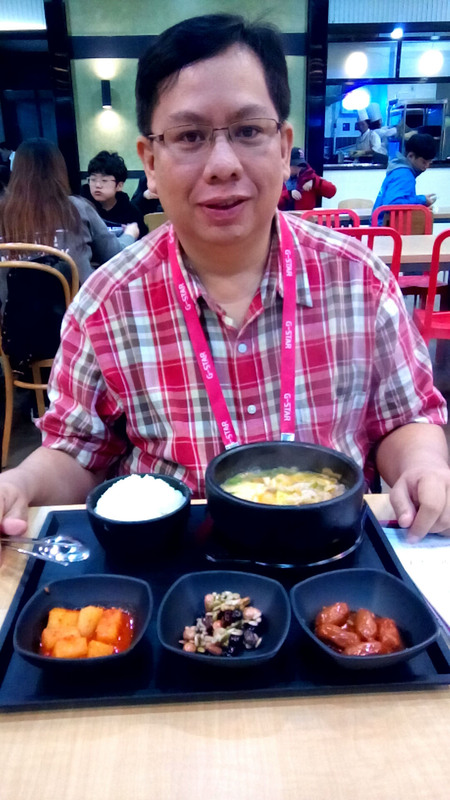 The soup was a bit spicy and the ribs were very tender, this was the perfect food for the cold weather. 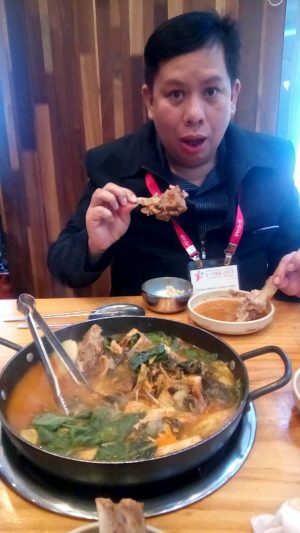 They called the soup Gamjatang or Haejang-guk or Hangover soup. 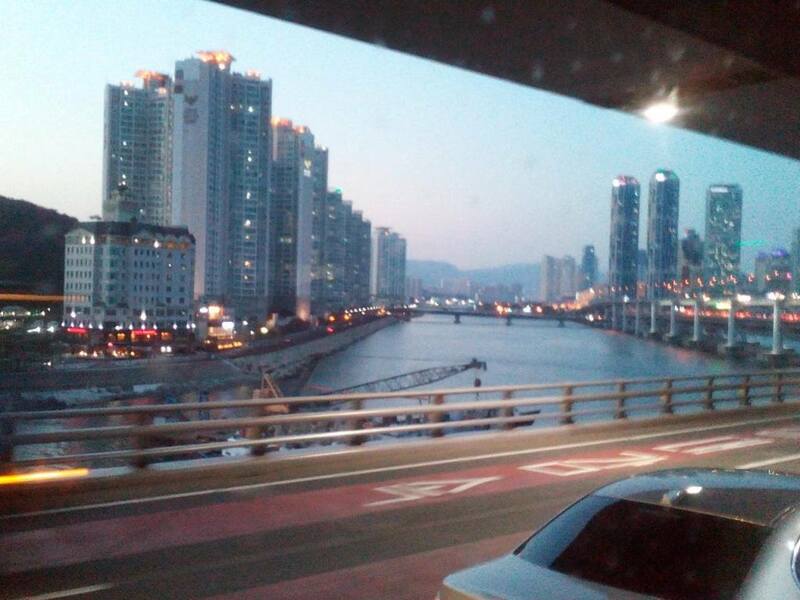 We went back to our hotel at 6:20 pm. 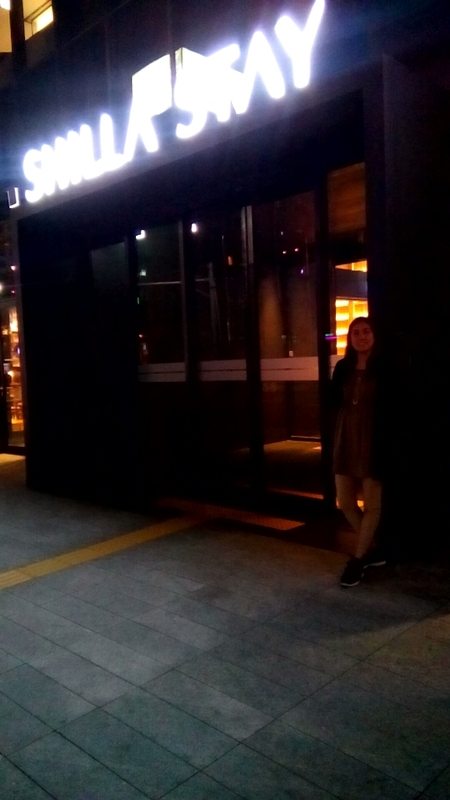 We were invited via online to the G-star welcome party but we learned that it was going to be at a bar named Devil’s Door. So Edith and I passed and said we will attend the next party since the organizers said that there will be others. 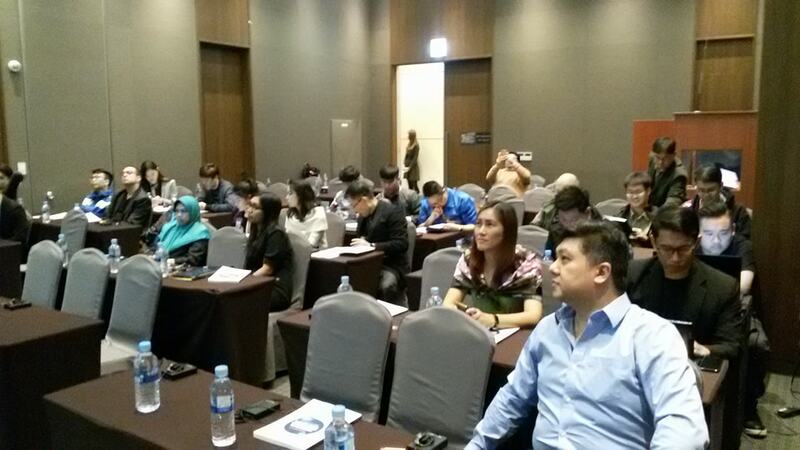 I was able to get pictures from the other delegates who attended. 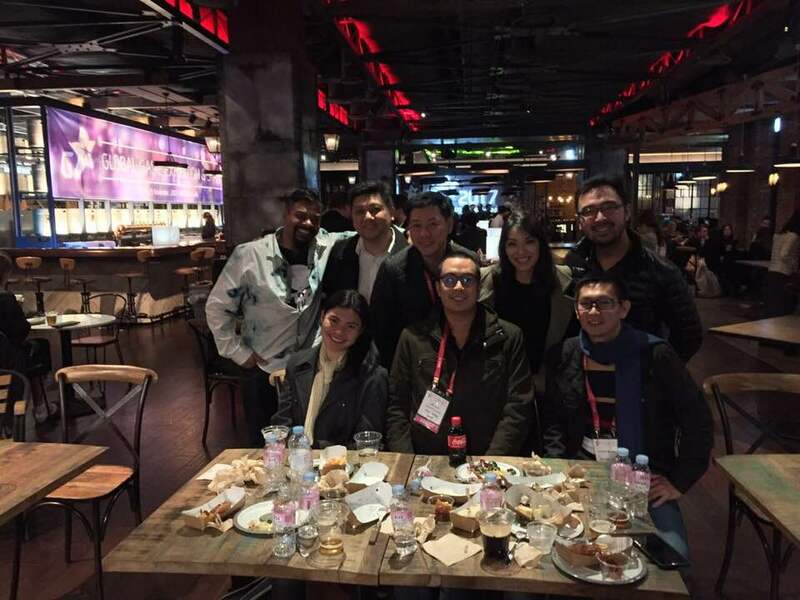 The other delegates said that they attended 2 parties, and they got home at about 2:00 am. Edith and I didn’t eat dinner because we ate too much at lunch and we need to conserve our budget. 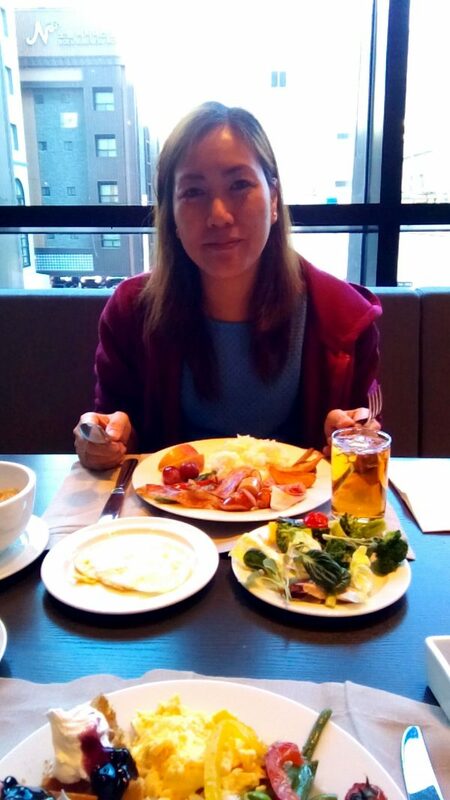 I again took the buffet breakfast, Edith passed because we would need to pay extra P700 for the extra head since the AKC only booked for one head. 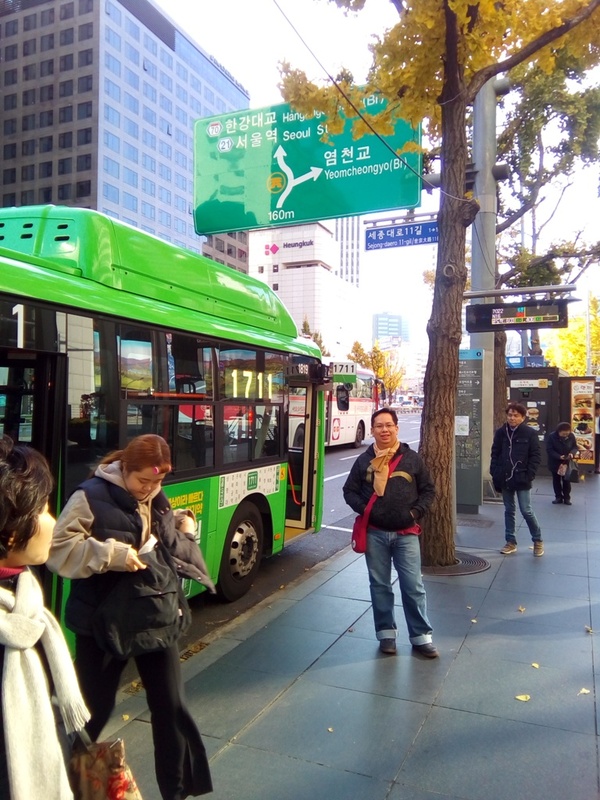 We again headed to BEXCO by bus at 9:20 am. 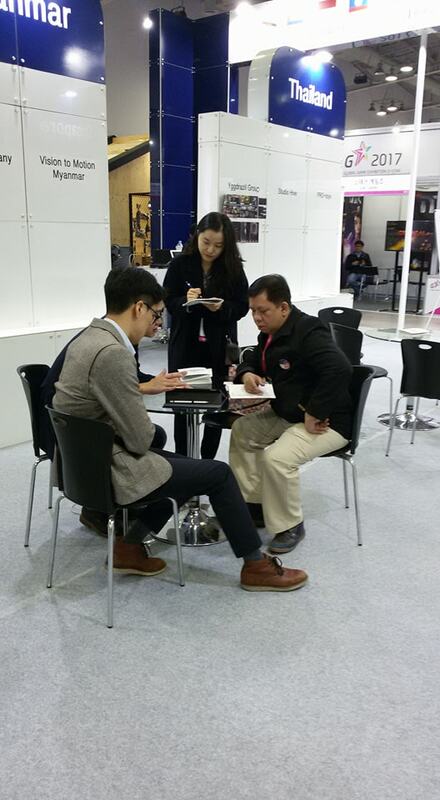 The business meetings continued with other firms. 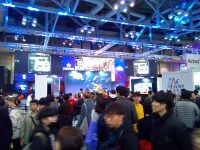 This time we went to the other booths, we saw the other Korean companies as well as some big developers. 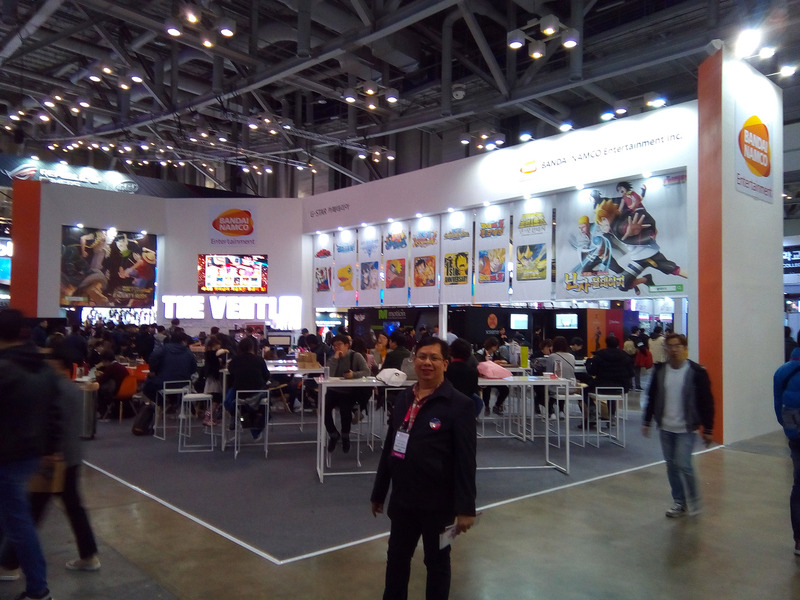 We also went to the B2C booths, this the convention area and it was located in another building connected with where we are staying by an elevated walkway. 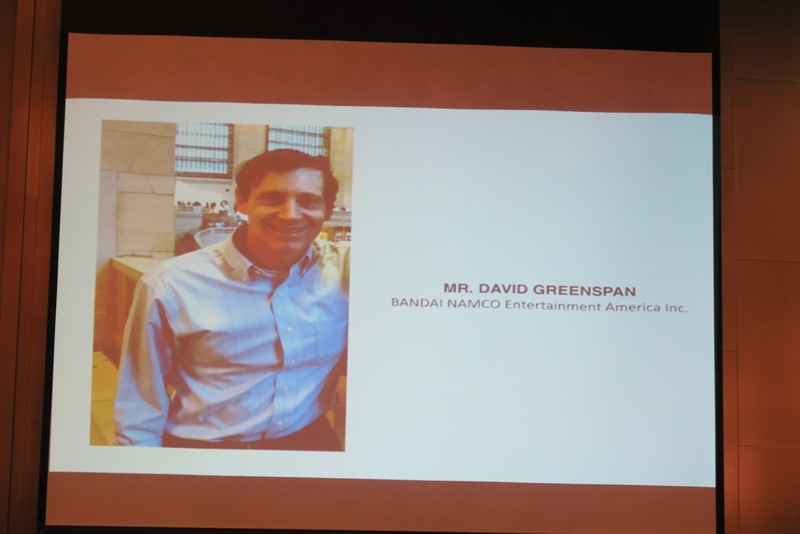 The majority were Korean game companies and I noticed only one Japanese game company the Bandai Namco. 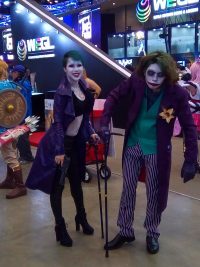 There were a few cosplayers unlike at the Tokyo Game Show or even compared to our local game conventions, where there are hundreds of cosplayers. 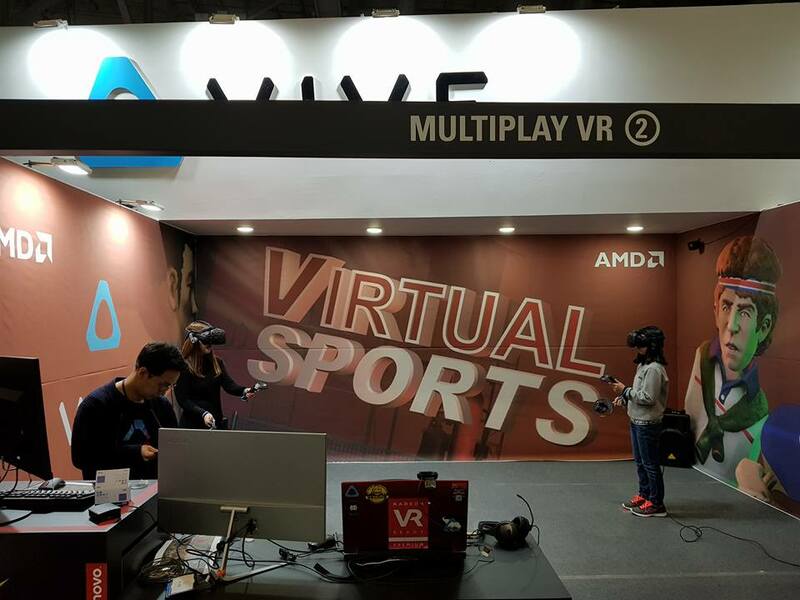 There were also virtual games. 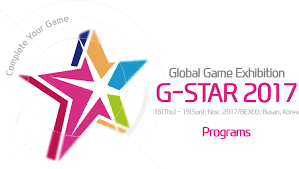 The highlight of G-Star is the eSports. 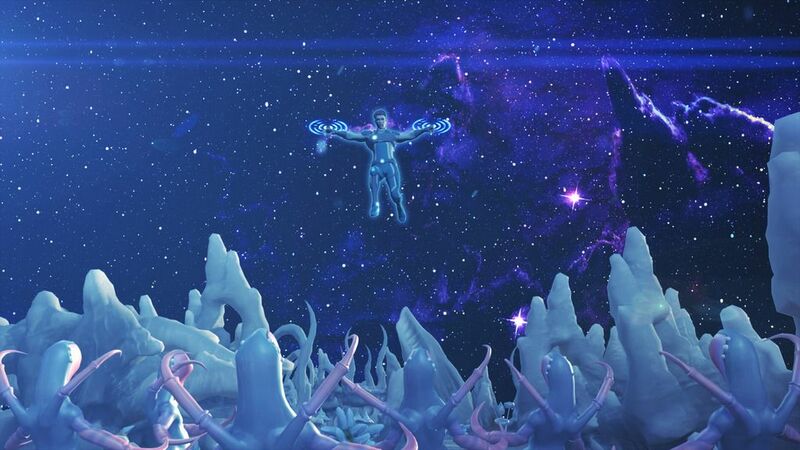 These are games where a lot of players compete with each other until there are only 2 players left who compete for the grand prize. 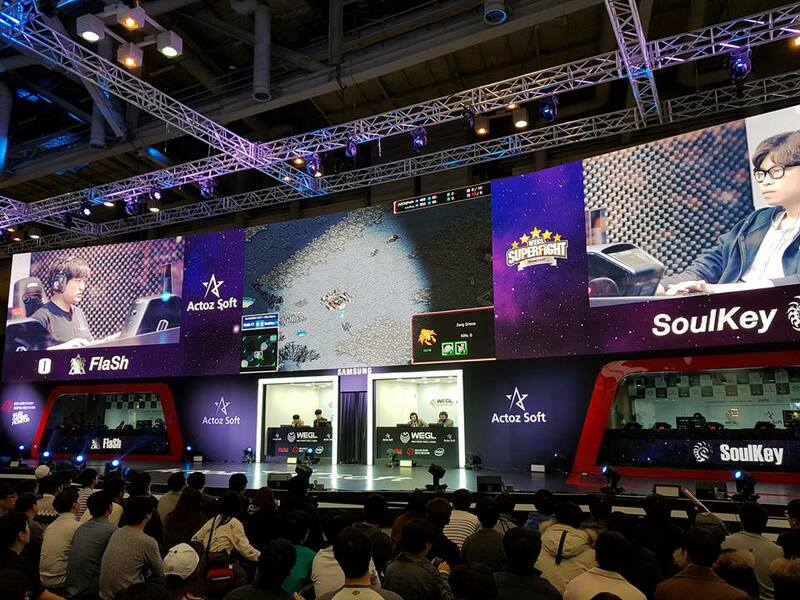 This is similar to the format of the ESGS, where there are a number of eSport games, like FIFA Online, which is a soccer game, Battlegrounds, Icarus and Starcraft. 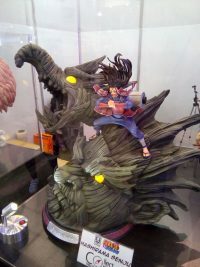 We also saw some Korean game character statues on display. 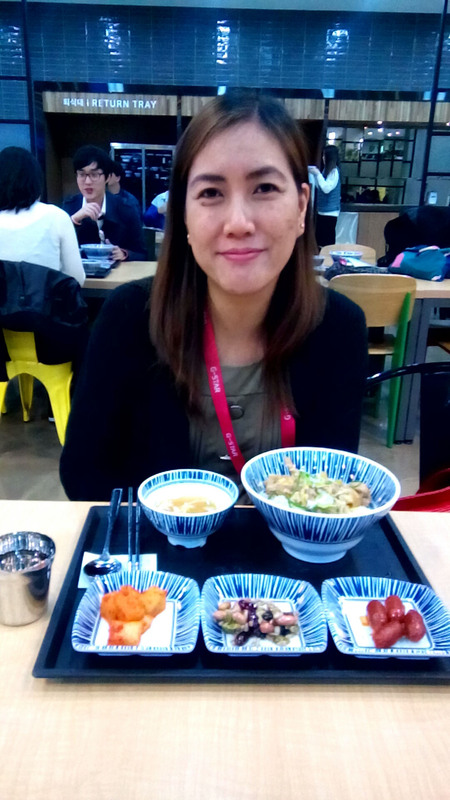 At lunchtime, we tried the food court at BEXCO. 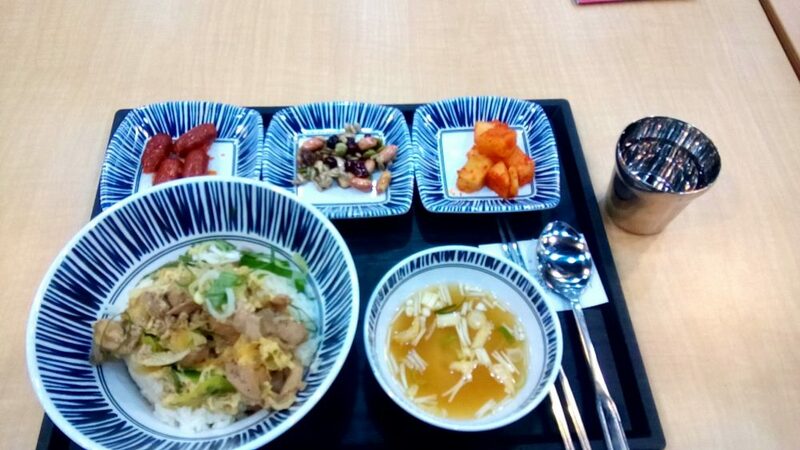 Here they only serve 2 types of dishes: the Pork Rice Topping and the Beef Soup. 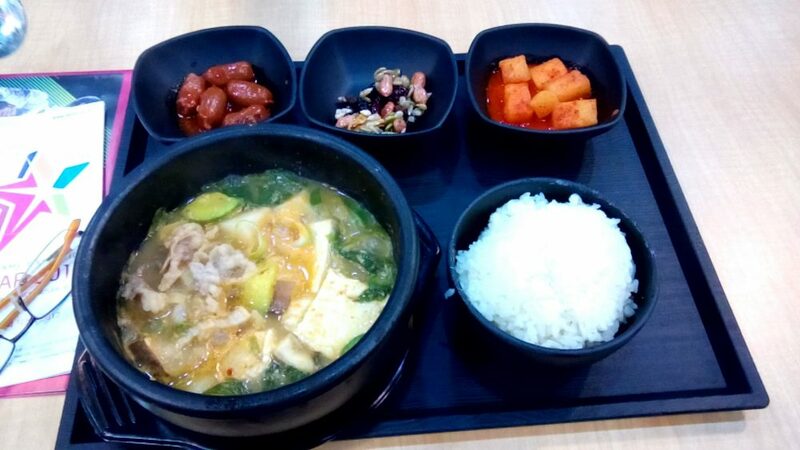 Edith ordered the pork toppings, it had a lot of side dishes for free while I had the beef soup. 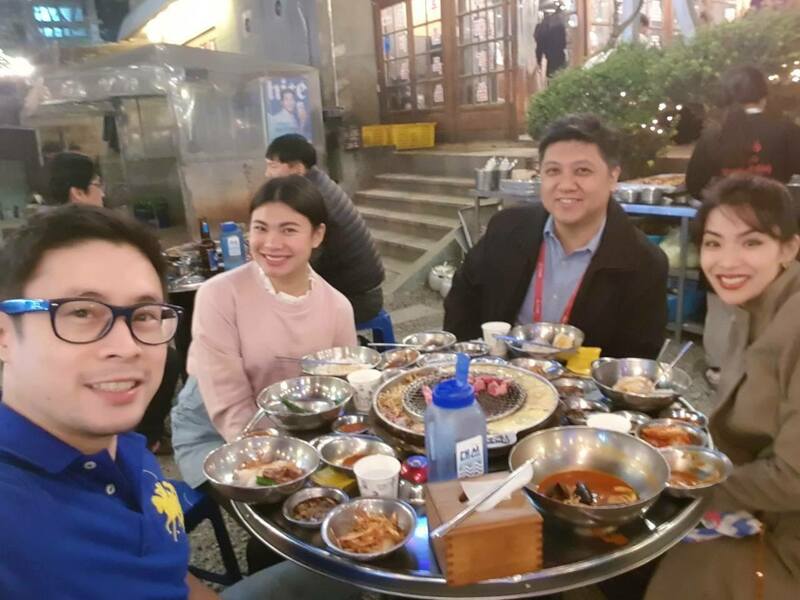 At dinner time around 7:00 pm, we were invited by Mr. Emman Ang for an authentic Korean barbecue about two blocks away from our hotel. 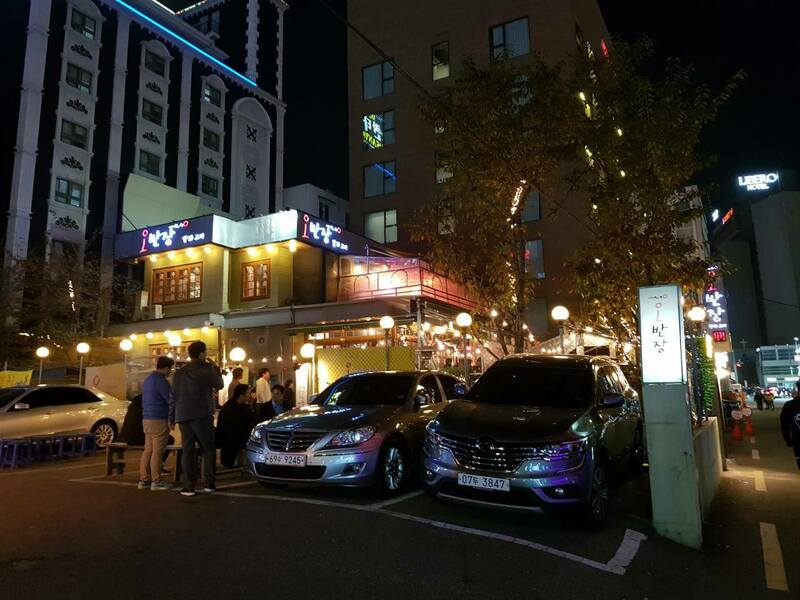 We went to this restaurant where the parking lot doubles as an outdoor dining area where we seated behind the cars. We sat on a long table with 2 grills. Emman was on another table with the girls from Xurpas and Dokes. 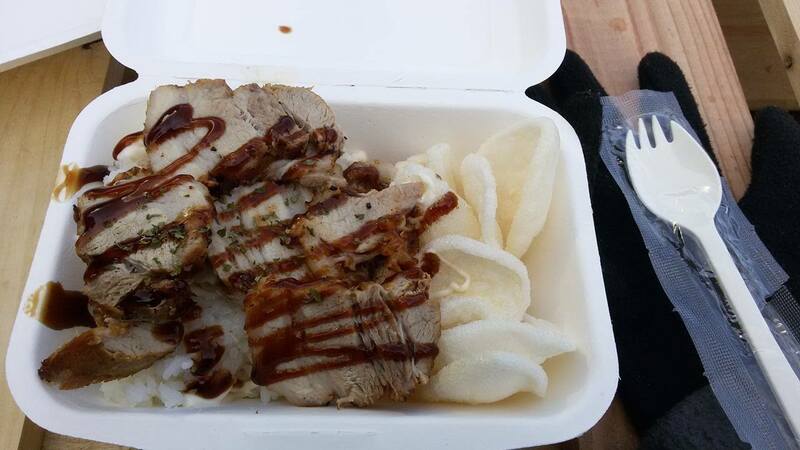 They gave us raw pork and beef that we then cooked on the grills. They placed kimchi and raw eggs at the side of the grill to cook. There were also condiments for us to season the meats while cooking. Thinking we had a good free meal, Emman said that we should chip in for the cost of our table, while they chip in at their table. 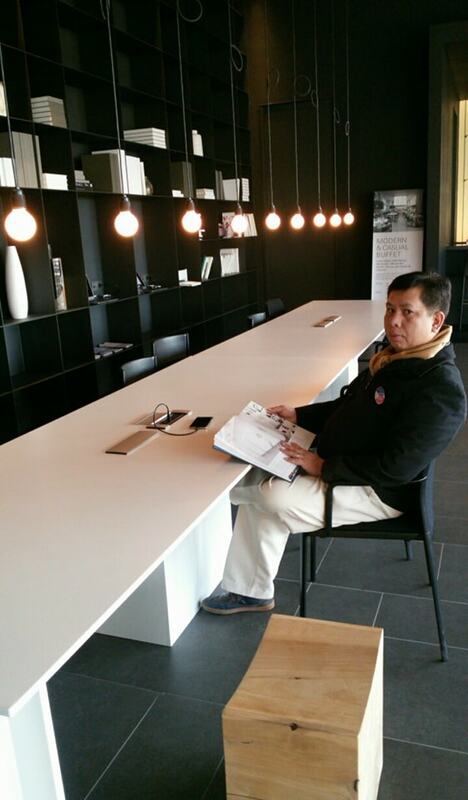 It cost about P800 per head, so I was caught off guard because of our dwindling budget. 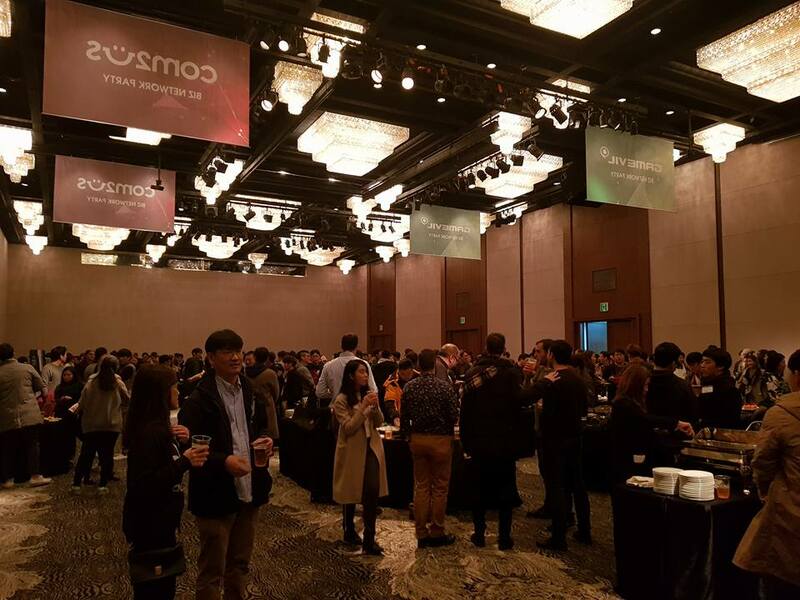 After dinner, we went straight to the Com2Us Business Networking Party at the Grand Ballroom of the Haeundae Grand Hotel. The said hotel is also just a walking distance from our hotel. 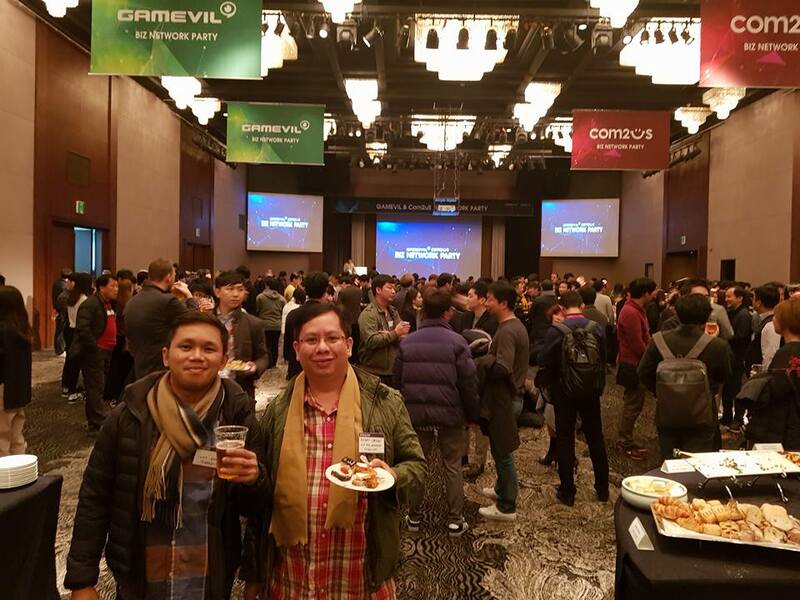 We were a bit late to the networking party, so we rushed to go there and arrived about 9:00 pm. 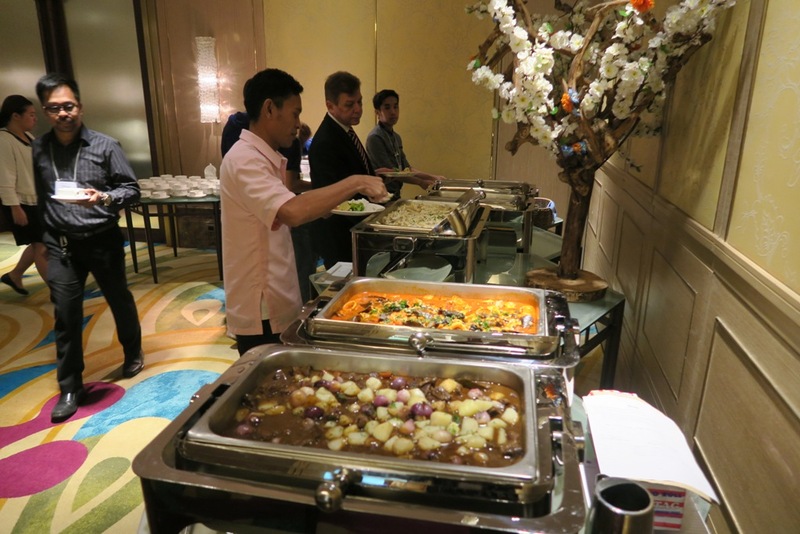 Edith and I then regretted having a paid dinner when we saw the variety of free food available. There was chicken, prawns, beef, burgers and lots more. We were full already, so we just tasted some of the food. The networking party was a good place to meet the other exhibitors. 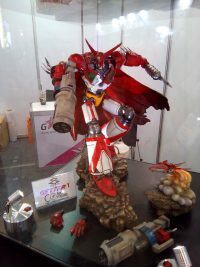 Then they announced that there was a raffle, they gave away a large Gundam Tobot, a drone, some action figures as well as computer accessories. 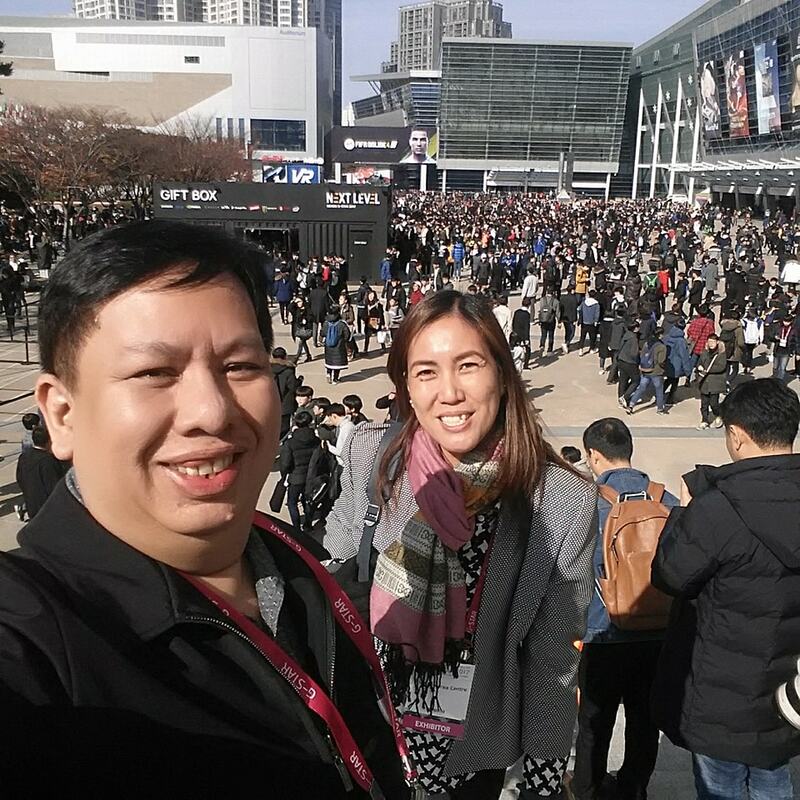 No one from the Philippine delegates won. 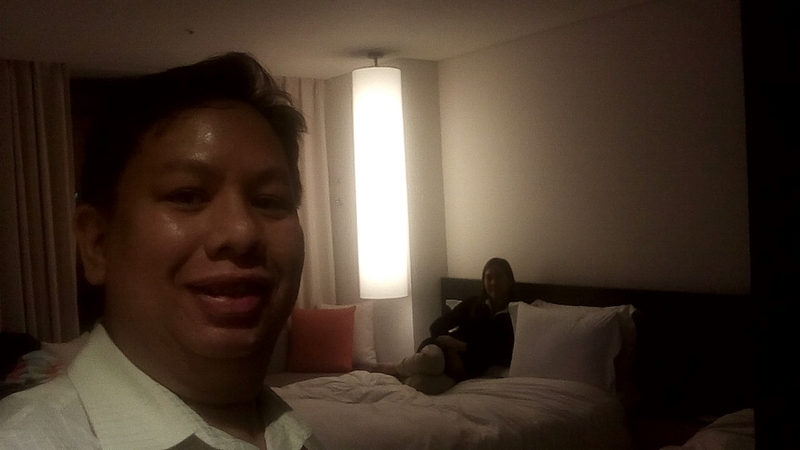 It was a fun night, after which we went back to the hotel at around 10:00 pm. 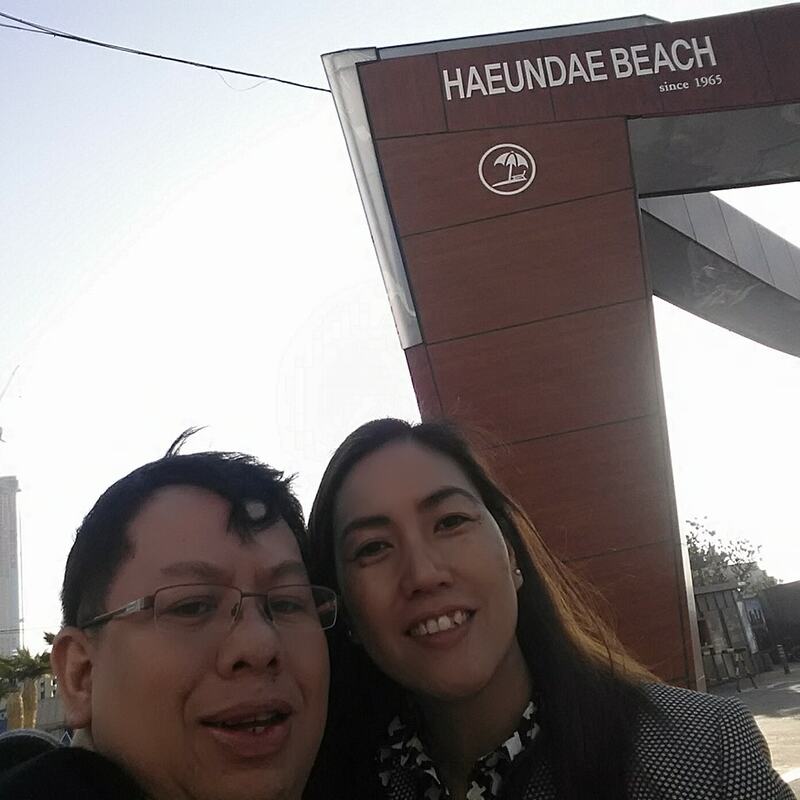 Our hotel was only a block away from the famous Haeundae Beach. So we went for a morning stroll at 8:00 am. 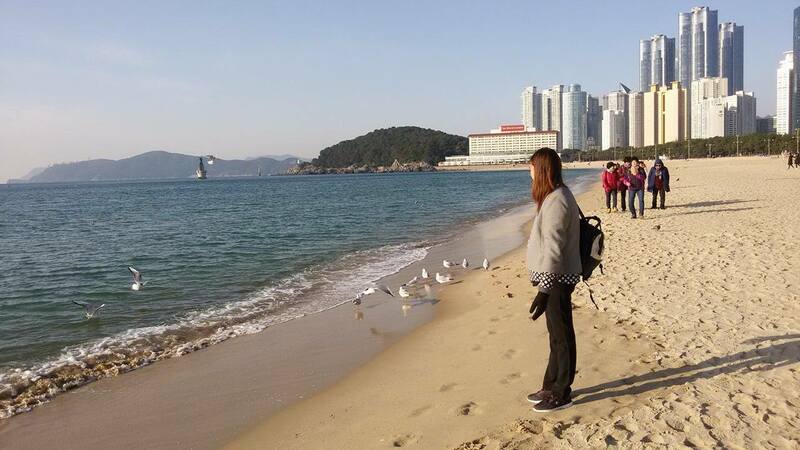 It was freezing but the beach was nice and clean. There were a lot of seagulls and pigeons. And there was an Aquarium near the beach but it was still closed. Back at the BEXCO around 10:00 am, the crowd was still large. 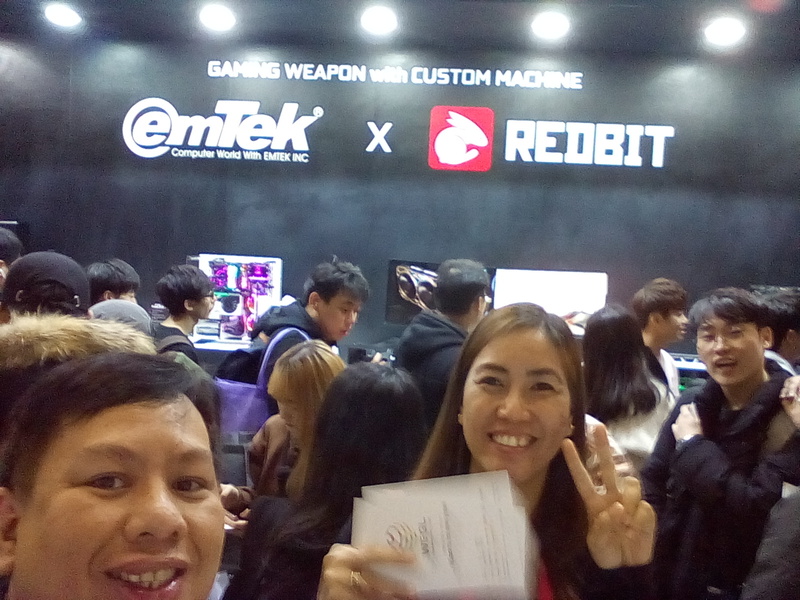 There were fewer people at the business matching so it gave us a chance to go to each Korean booth and give our calling cards, show our game and make some connections. We tried one of the food trucks outside for lunch this time at around 11:30 am, we chose the shortest line with barbecue ribs. The price was equivalent to P280 for a single serving. 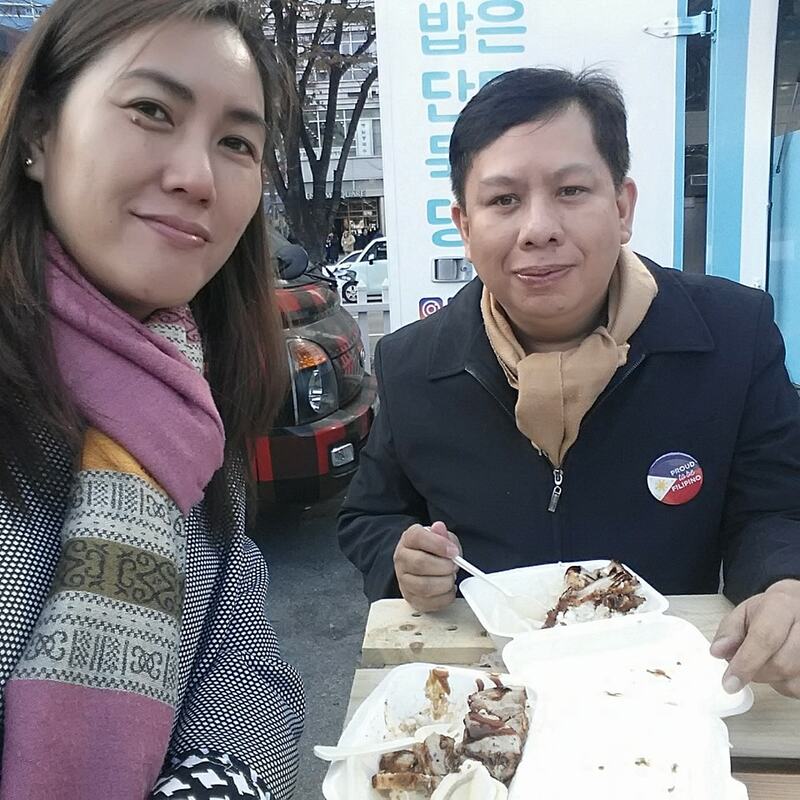 It was good though, but we had to eat at tables made out of cargo planks at the parking area. 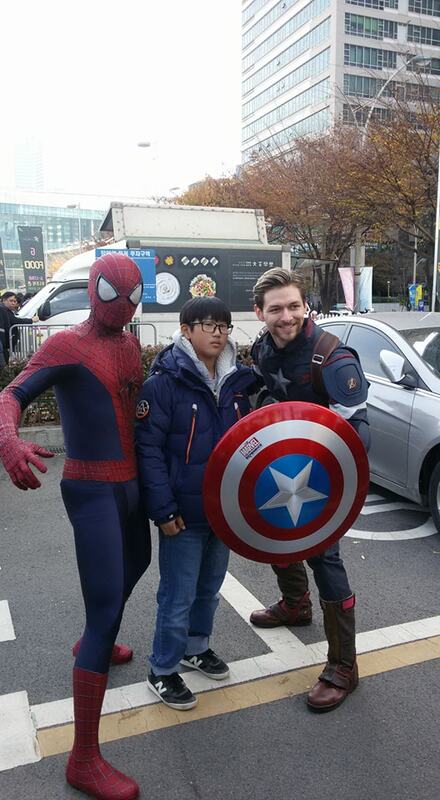 There were also some cosplayers who posed with the crowd at the food truck area. We also took shots at the park beside the BEXCO. 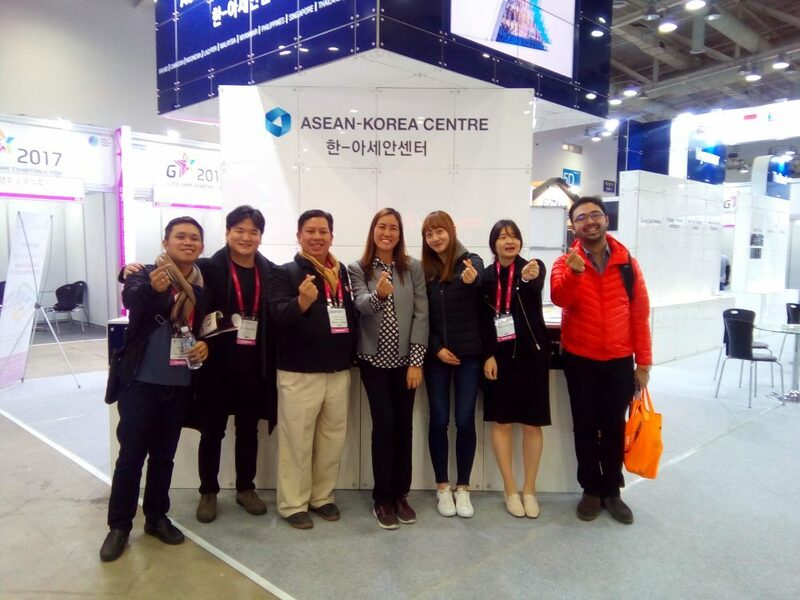 When we went back at 12:30 pm, all the staff of the AKC and the ASEAN delegates were having photo shoots, so we joined them. We thank everyone for the warm hospitality. 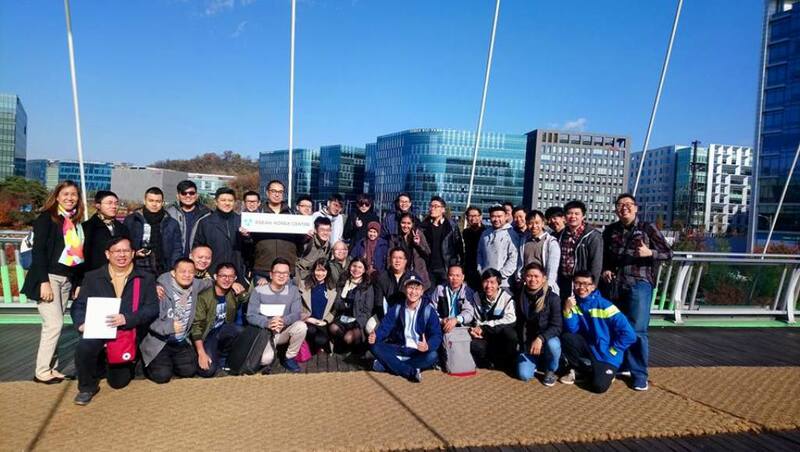 It was a great experience for us overall. 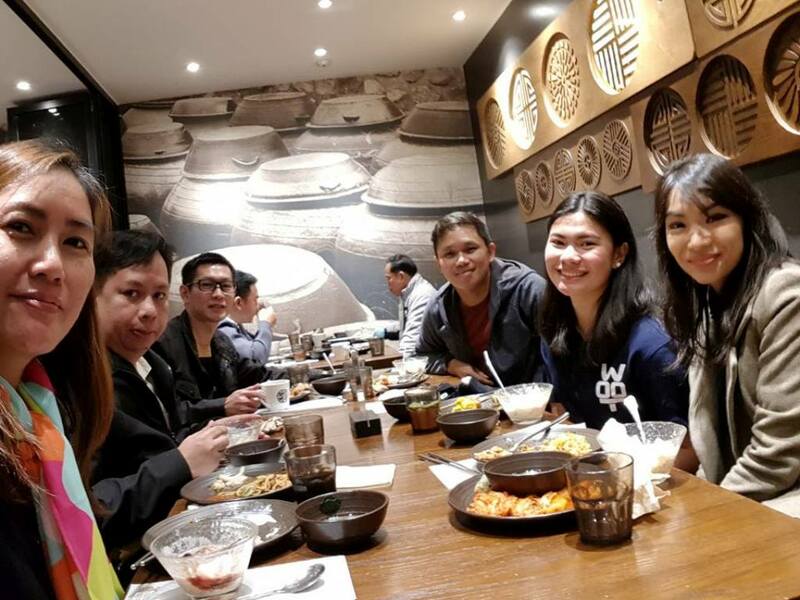 John of Indigo, An Jin of the AKC, Als, Edith, Ms. Park of the AKC, another guide and Josh of Synergy. After G-Star, some of us agreed to go to the mall for stuff to take home at around 6:00 pm. The mall was so big and stuff was too expensive, so we weren’t really able to take home anything. 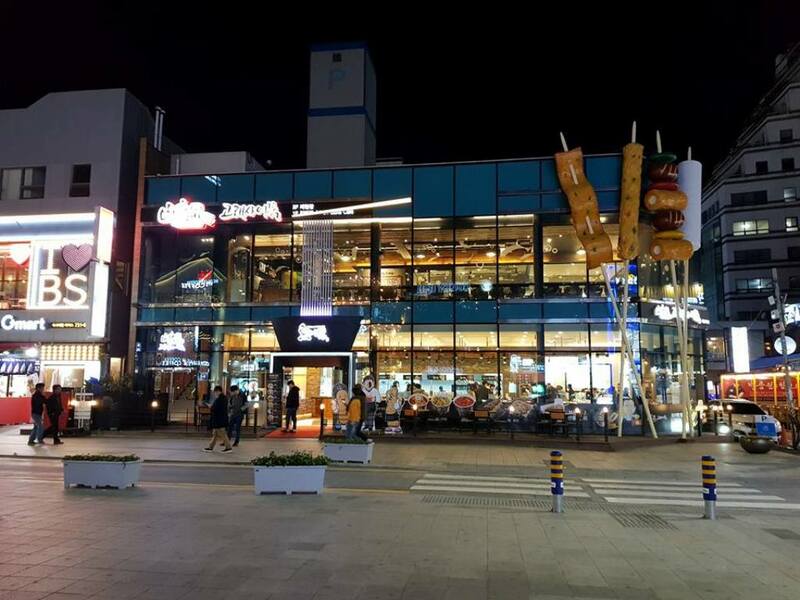 We had dinner at the food court and we took a taxi back to the hotel afterward at around 9:00 pm. 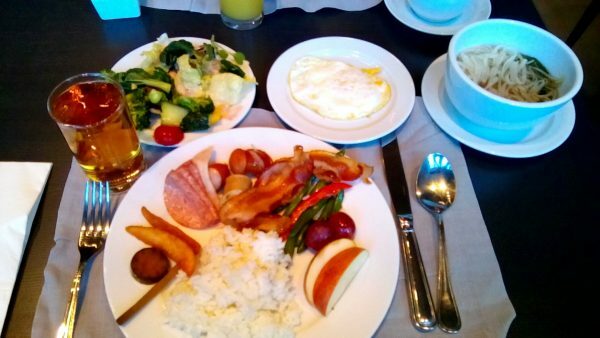 Edith and I ate at the buffet breakfast at the hotel around 8:30 am. We also had some last shots in the lobby after for checkout at 10:00 am. 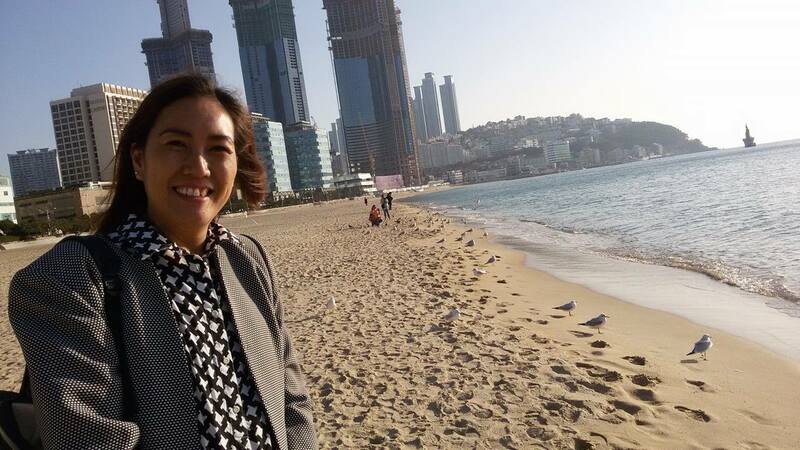 I then took Edith to the subway 10:30 am because she had a different flight and she needed to take the train back to Incheon. 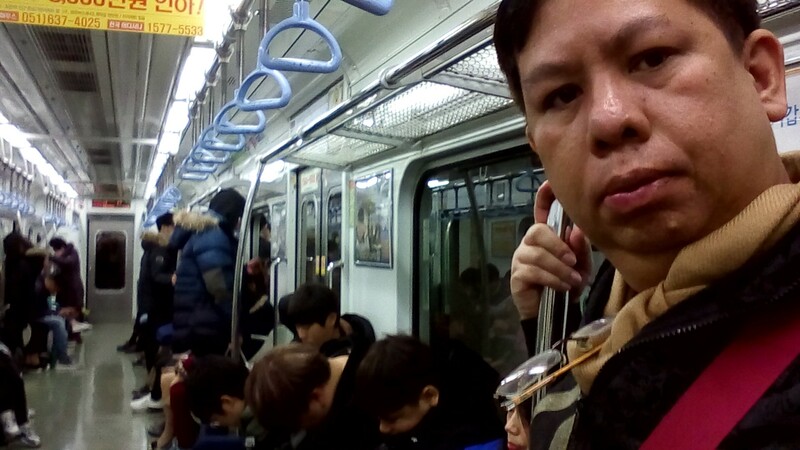 The rest of us would take a connecting flight from Busan airport to Incheon airport. 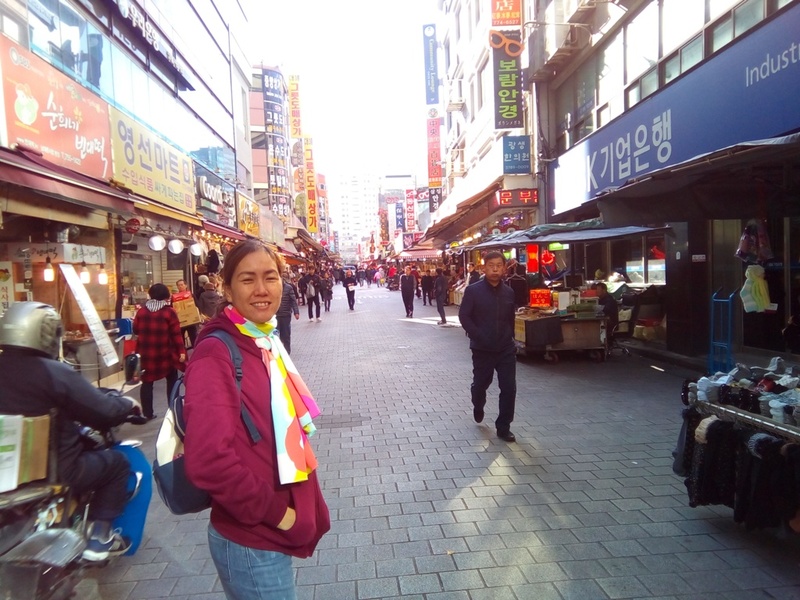 The road to the subway led us to a strip with lots of restaurants and some tourist spots. 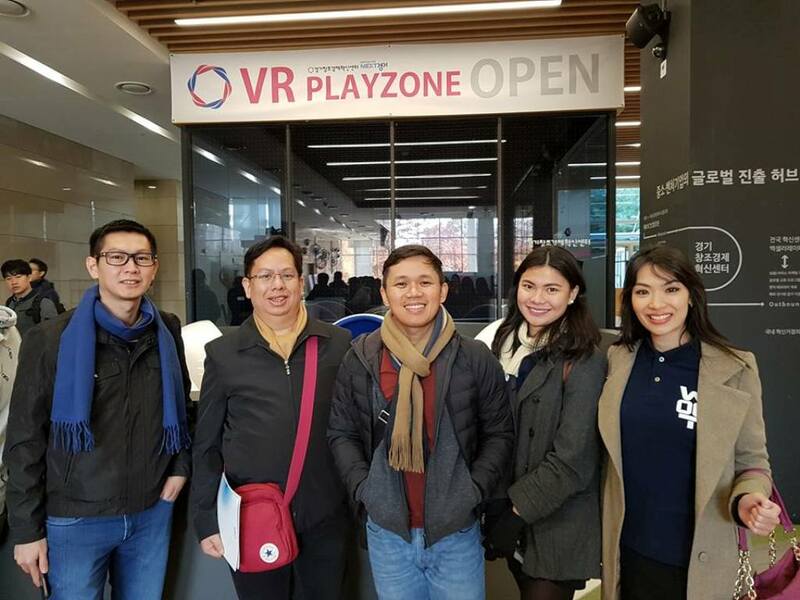 At around 11:00 am, we learned that it would be a 2-hour train ride to the Busan station, so after taking her about 9 stations, I headed back to the hotel to meet with the other Philippine delegates. 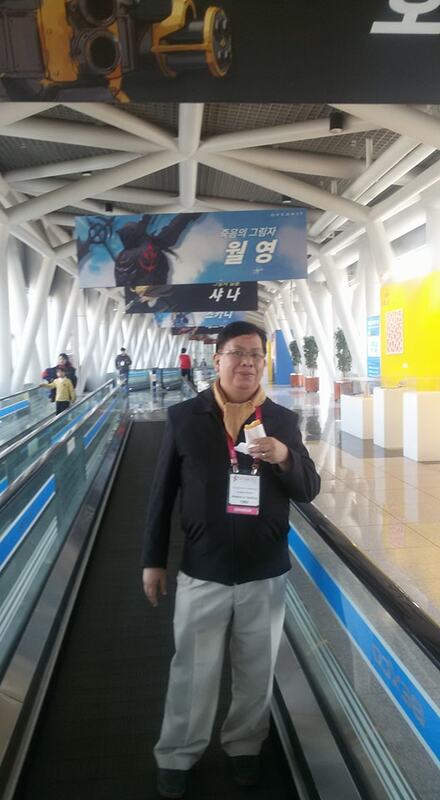 After that, it was a mad rush to the airport for the 2:00 pm flight so we didn’t have time to take pictures. On November 22, Emman Ang messaged us via viber. 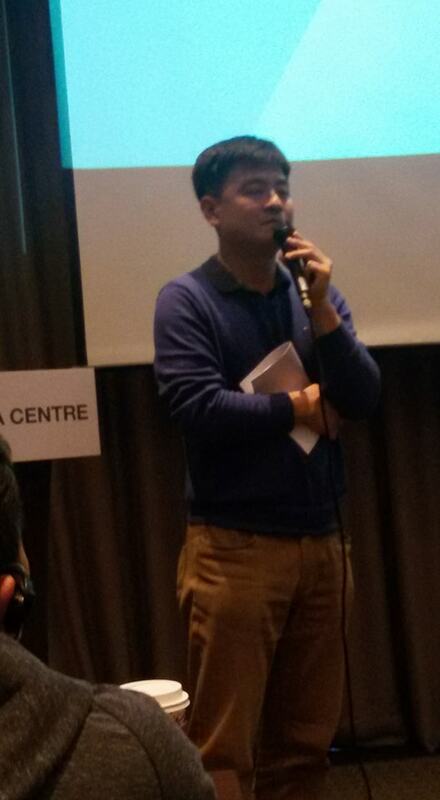 He said that the AKC was disappointed with the no-show of one of the Philippine delegates. 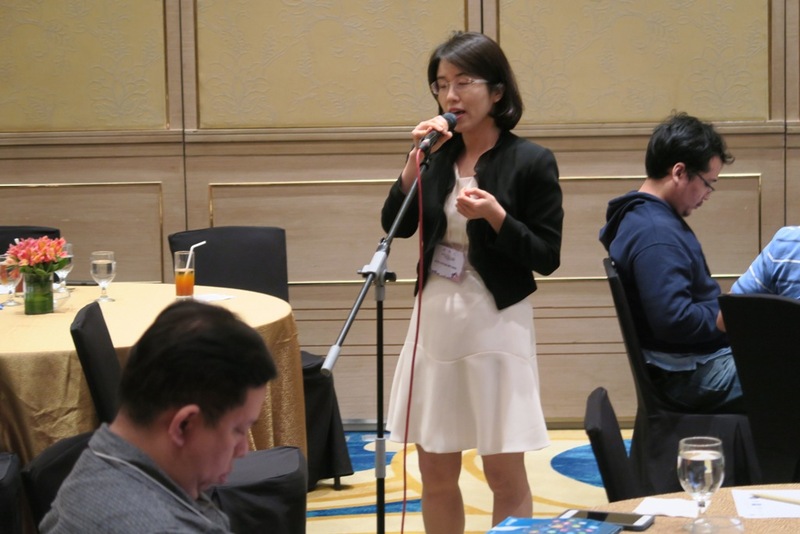 Ms. Tess Loring of DTI-EMB defended themselves that they informed the PTIC Seoul of the VISA problem. 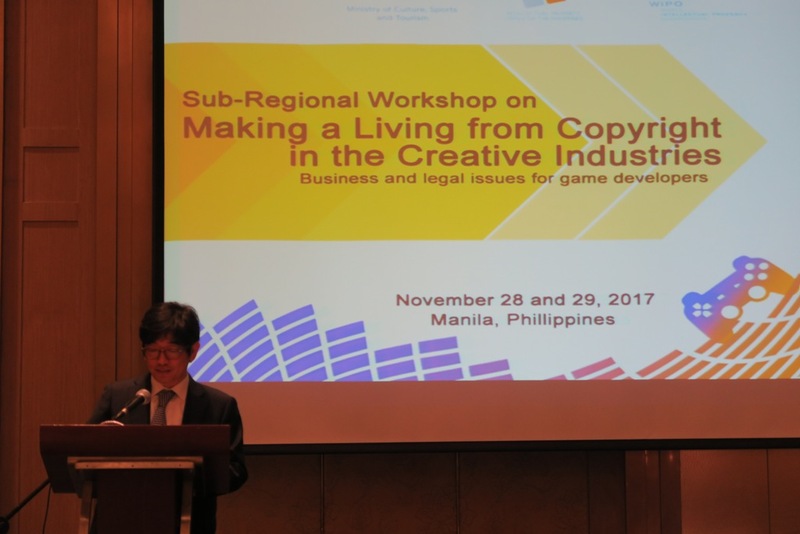 Emman said that wasn’t the point because they only allowed 3 companies per country and we asked for more slots, to which they obliged. So it was up to DTI-EMB to make sure that all those slots would be filled. 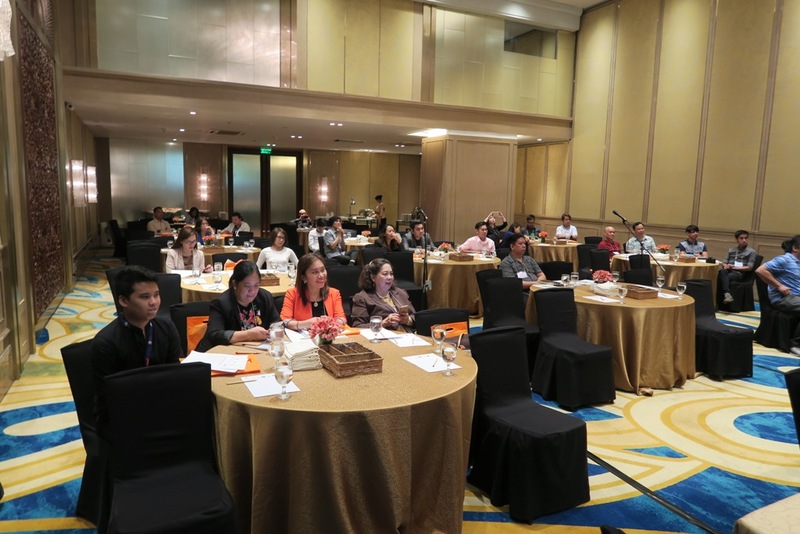 The AKC even brought up a suggestion to make the accommodations partially paid by the delegates just so that they take it seriously next year. 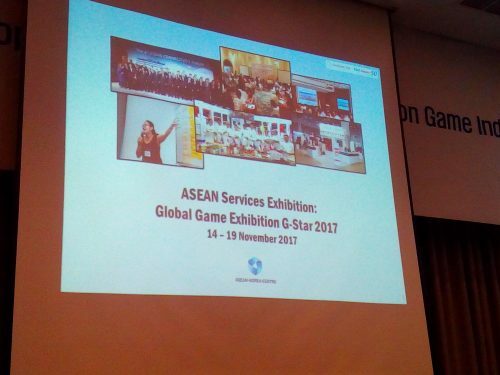 There were even some countries saying to scrap the event, in the end, there was good news: G-Star will continue the ASEAN partnership again next year. 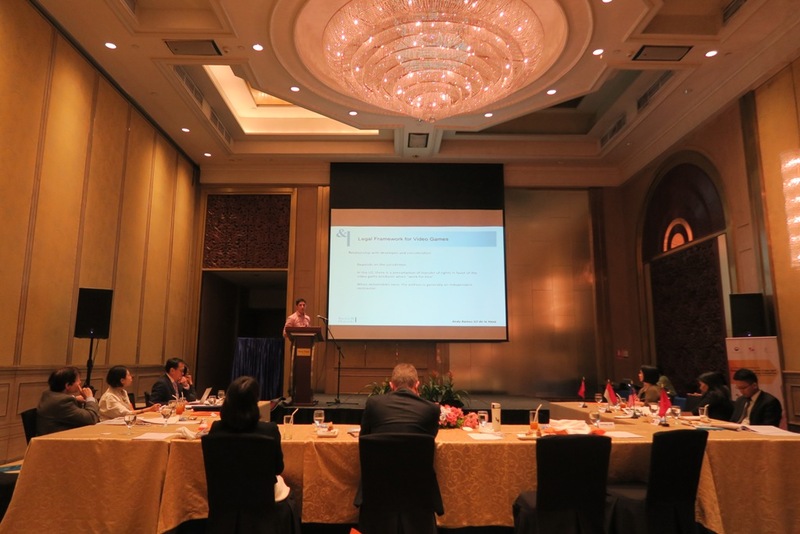 The DTI-EMB asked us to attend a post G-star meeting on November 23. 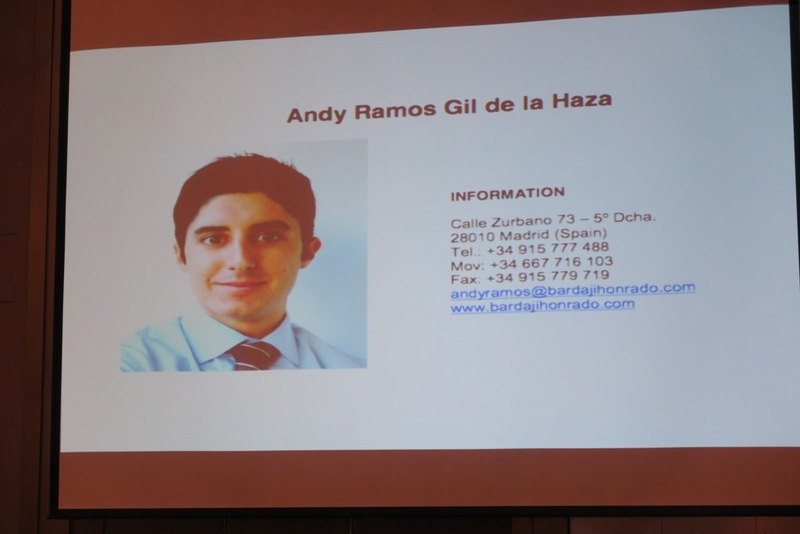 Unfortunately, I had to deal with a death in our family so I wasn’t able to attend. 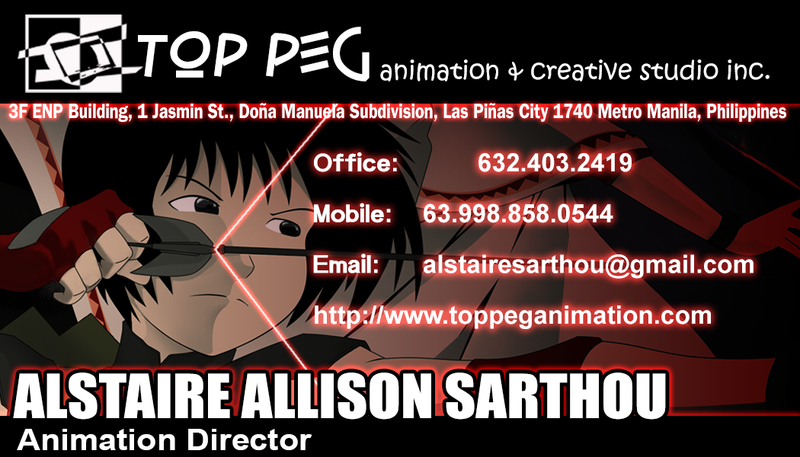 They emailed me that I needed to send them a report of the leads we got and also our suggestions for the preparations. 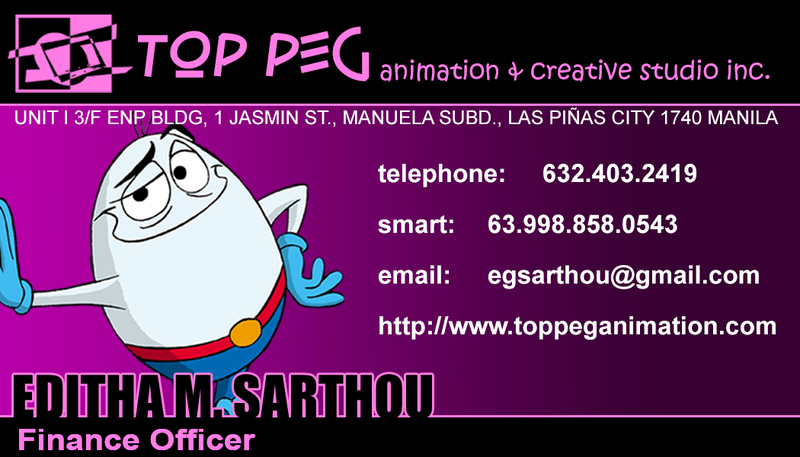 They also asked us to send copies of the calling cards we gathered that are potential clients in the future. 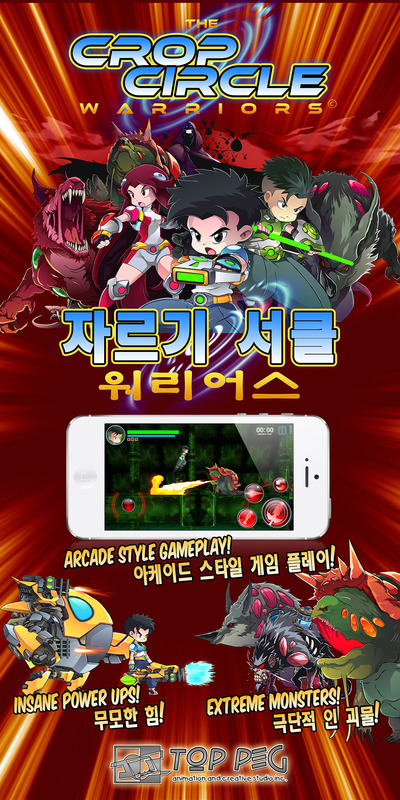 As a tip for those who would like to go to the G-Star, be prepared for a final full mobile game with a business model. A good looking game with a good gameplay is just for starters. Most of the time they don’t even look at your game. Many things will be asked of you by the Chinese, Korean, and other Asian businessmen, which I am not at liberty to divulge. 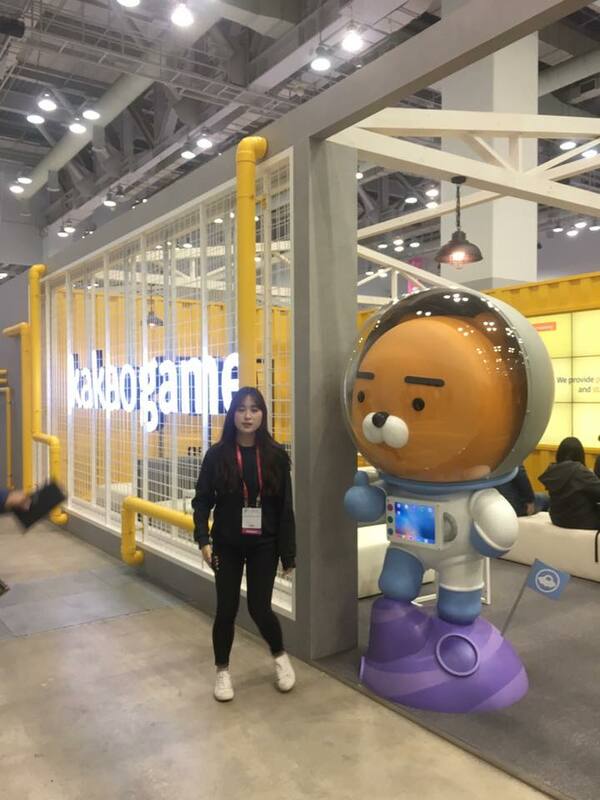 If you have no game or have a game but no business model, then your time and the foreign businessmen’s time will be wasted. 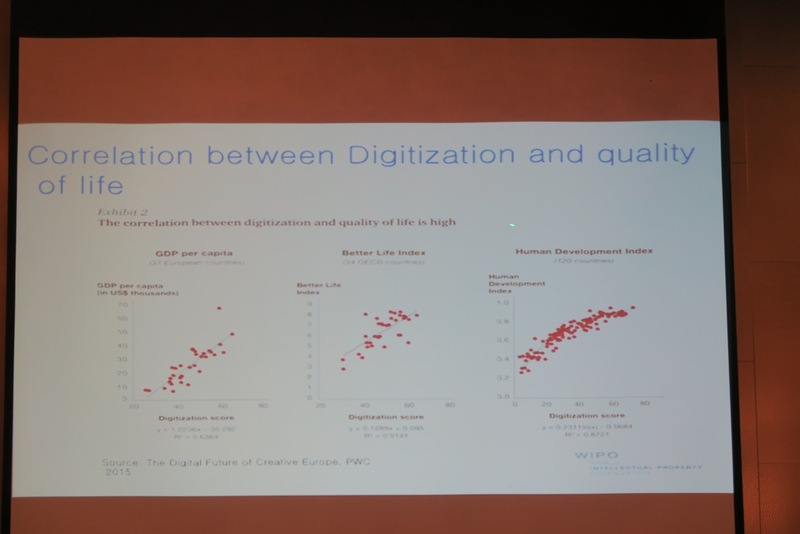 As for services, that would depend on what services your firm will provide, but most are not interested in services since they have their own talents in their own county.